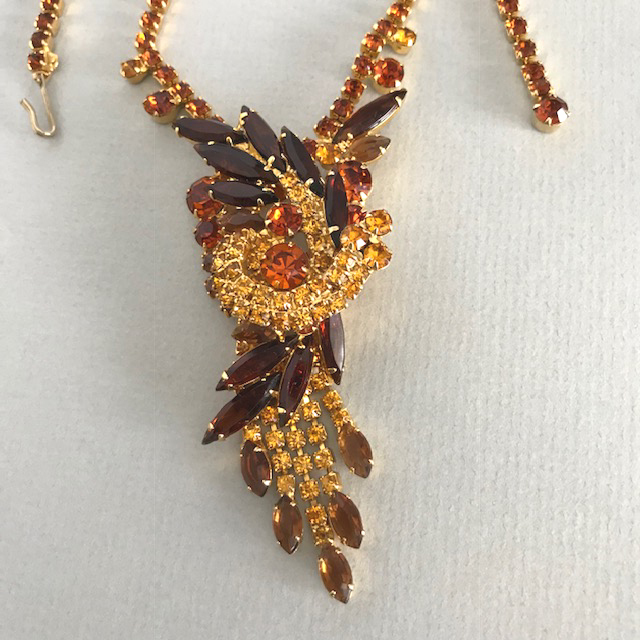 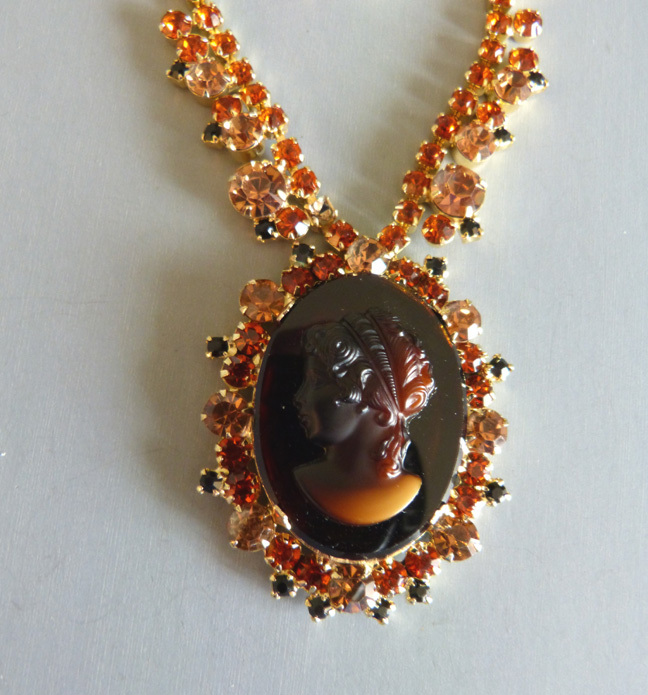 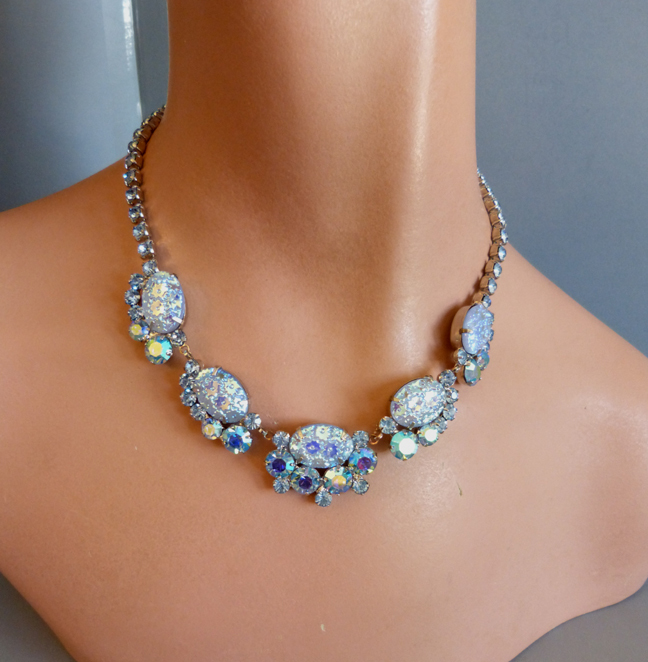 Juliana jewelry has a look that is collected by many jewelry lovers... terrific colors, art glass stones, and a showy presentation make it a favorite. 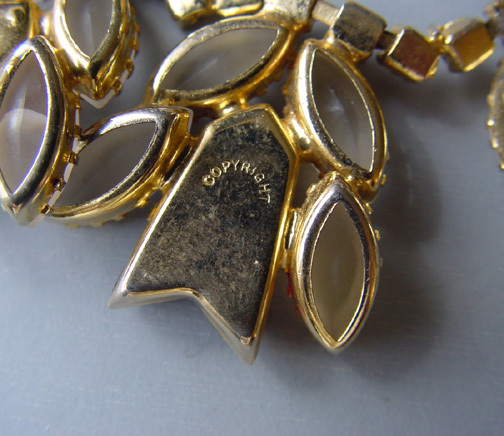 Juliana jewelry was marked, if at all, by paper hang-tags only. 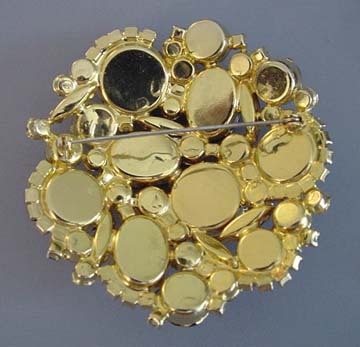 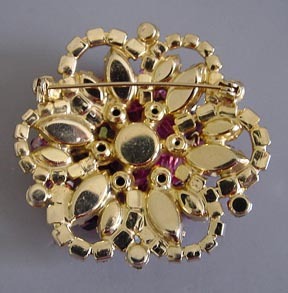 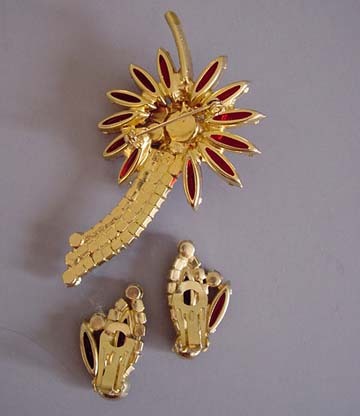 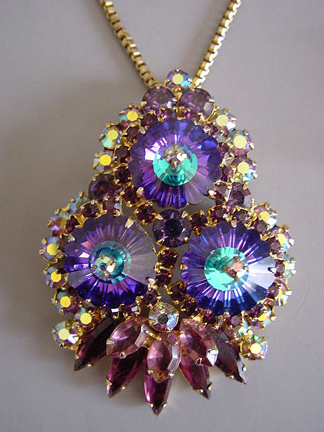 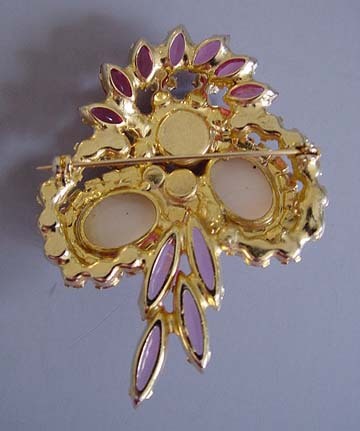 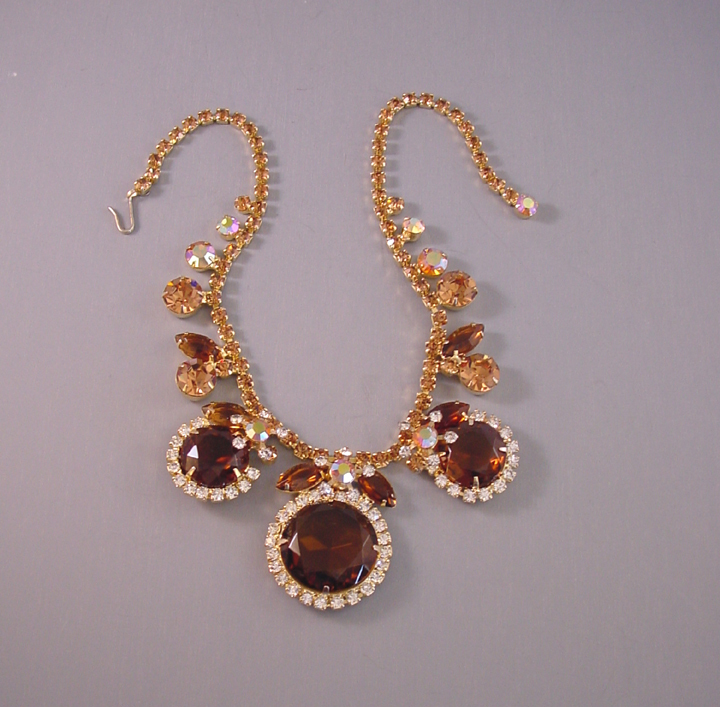 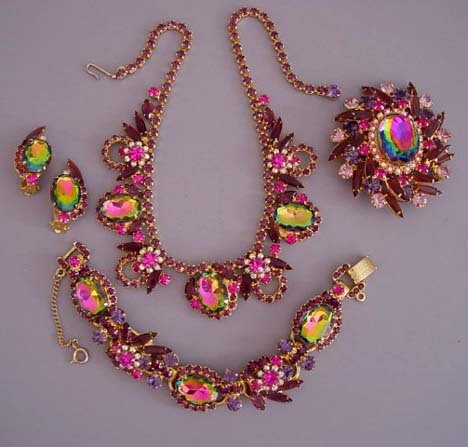 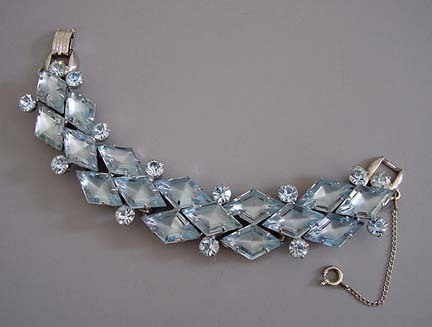 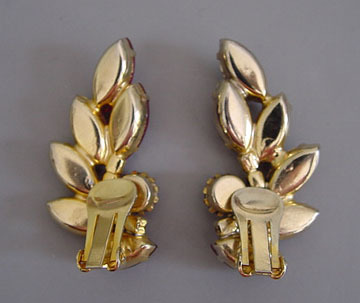 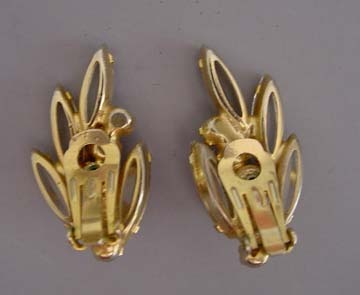 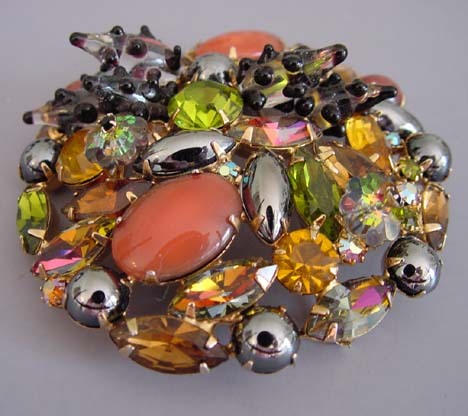 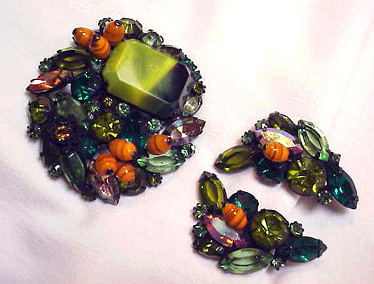 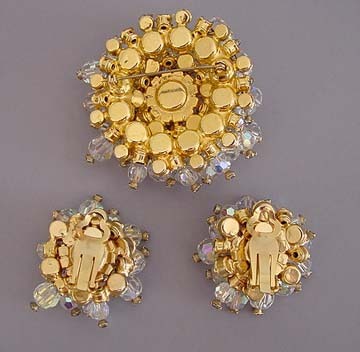 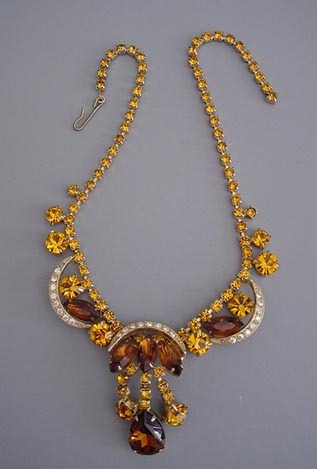 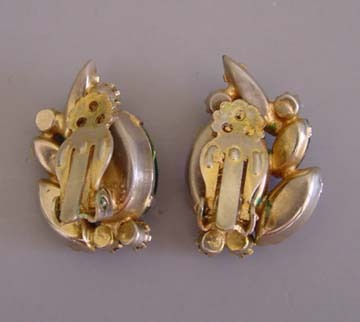 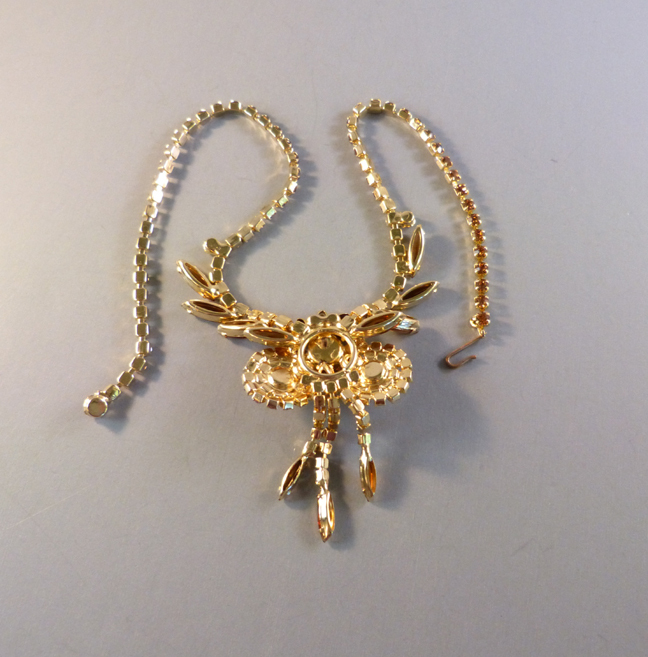 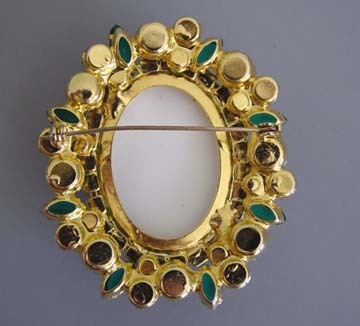 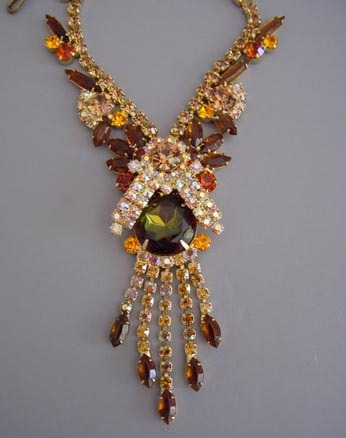 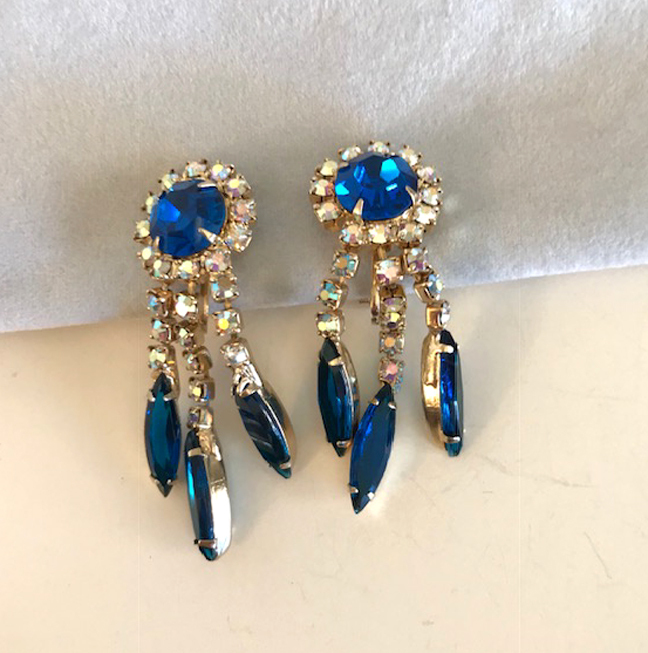 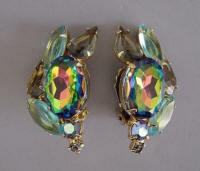 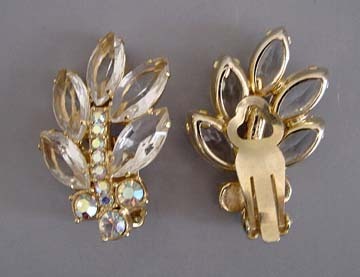 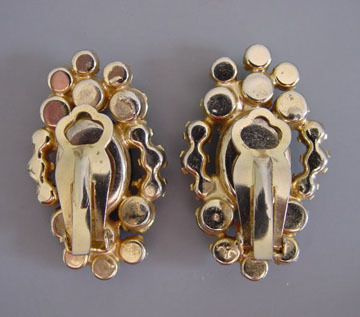 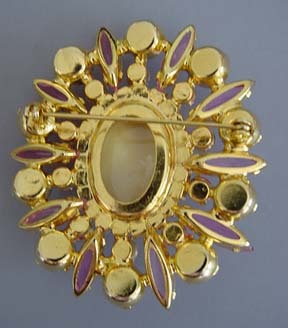 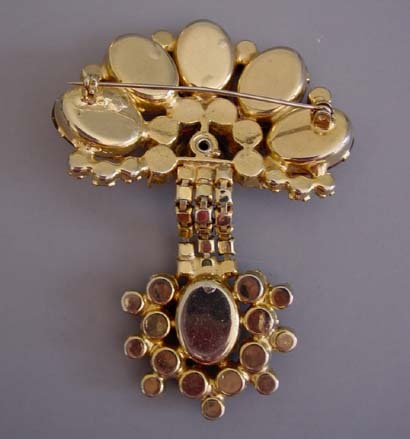 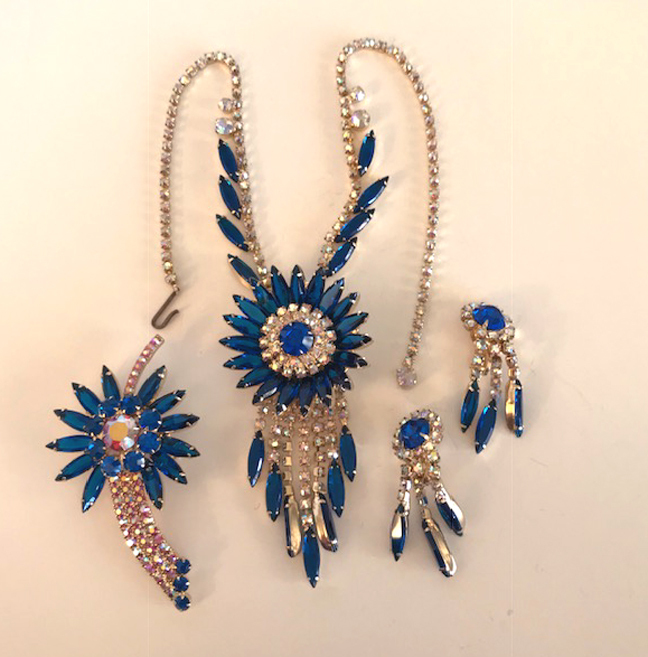 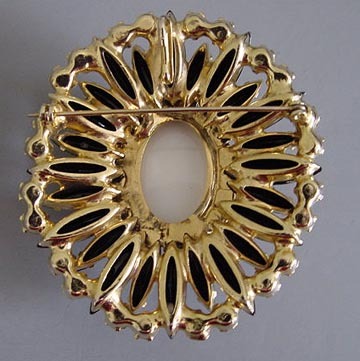 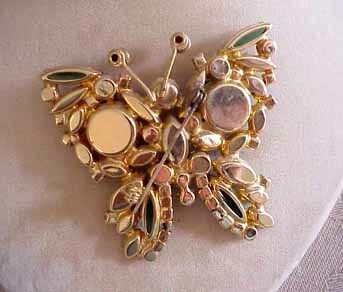 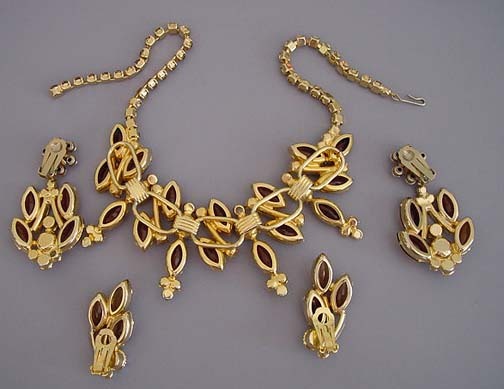 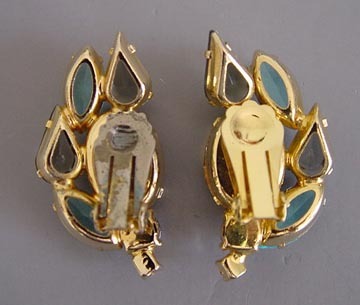 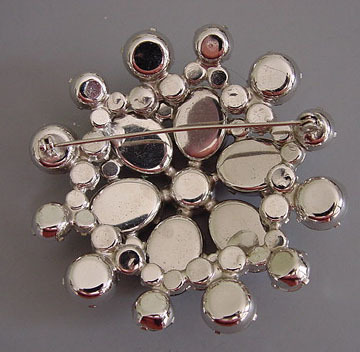 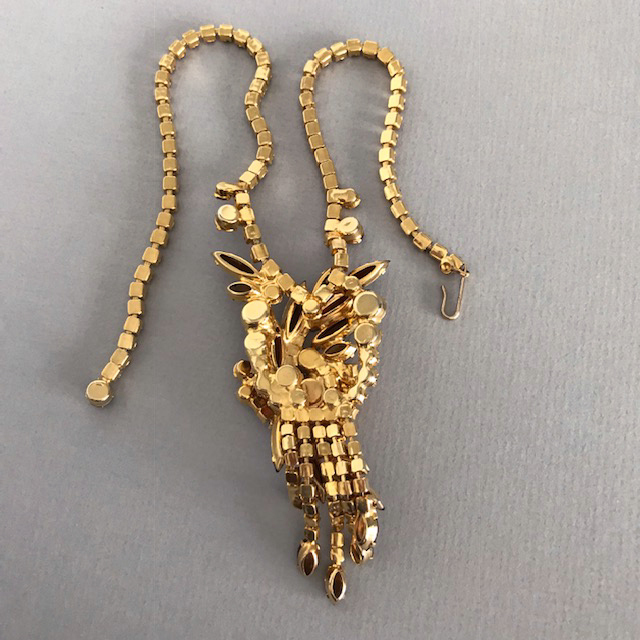 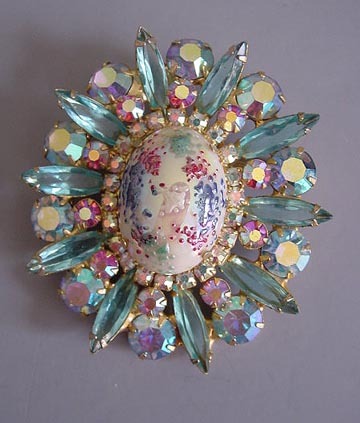 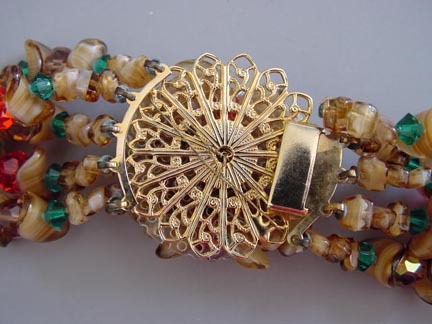 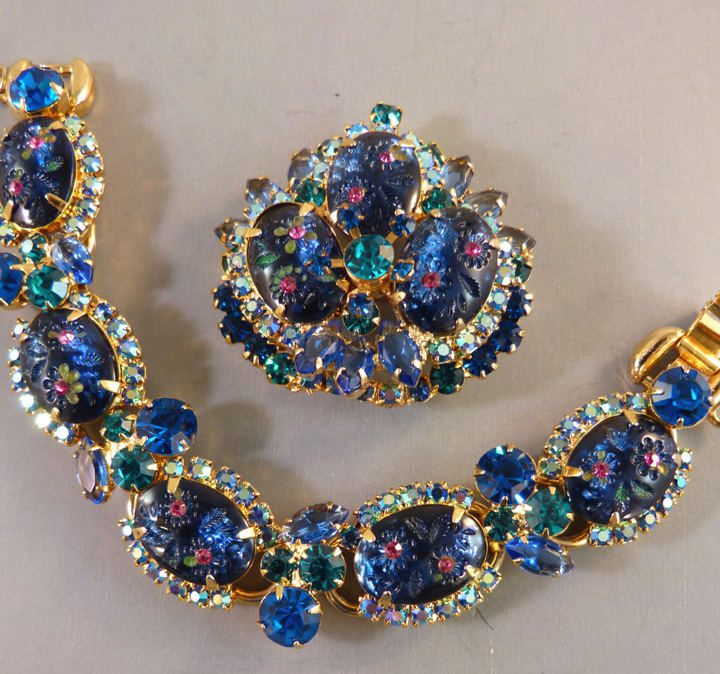 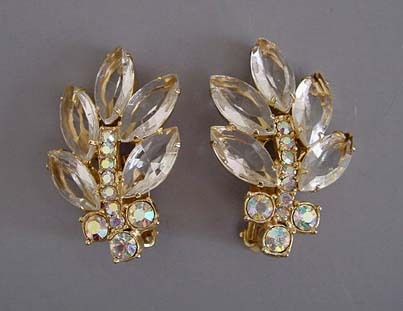 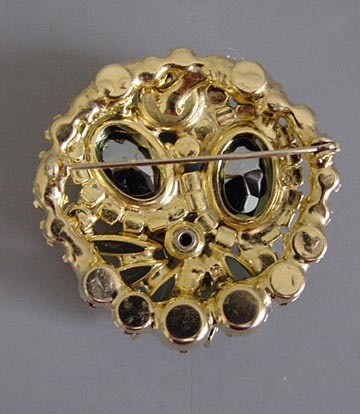 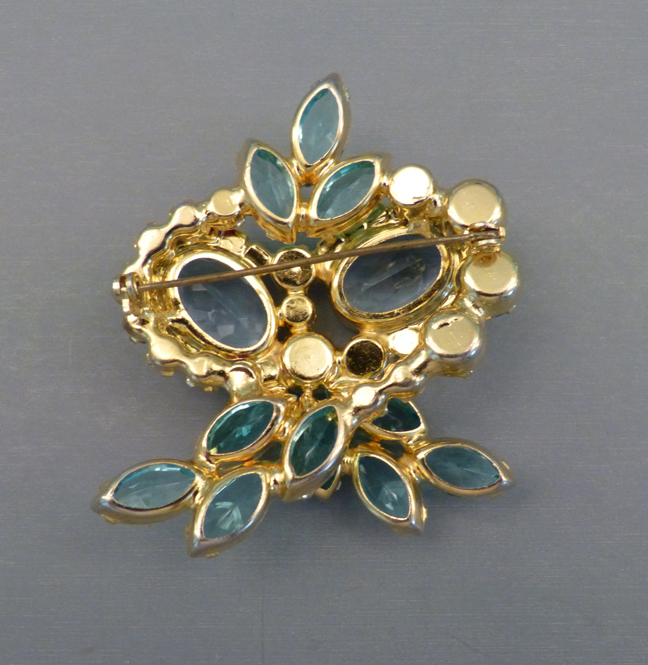 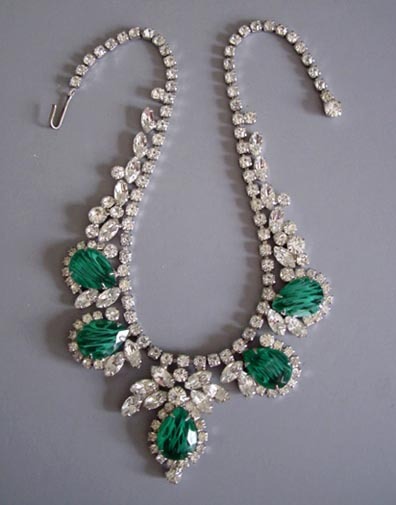 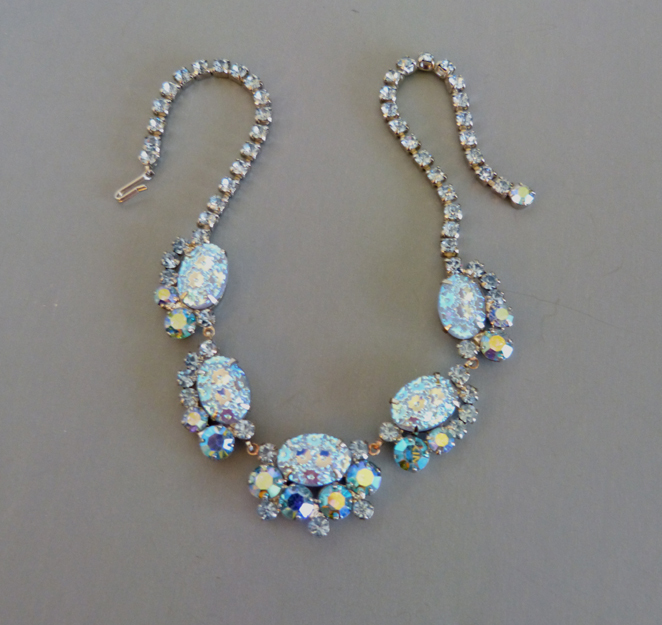 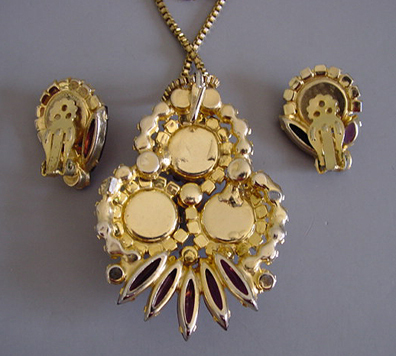 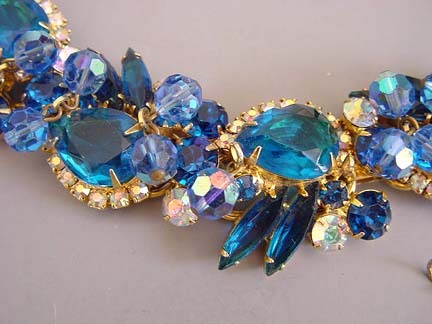 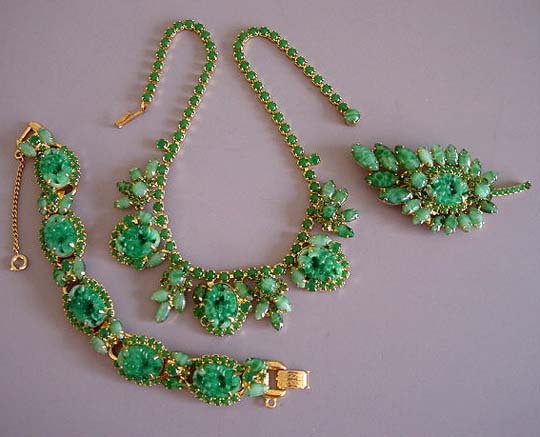 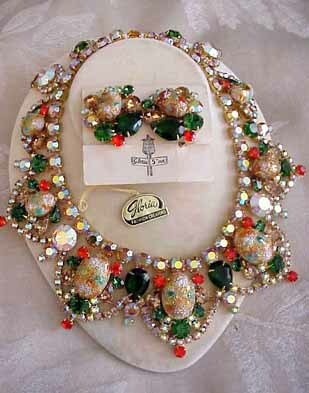 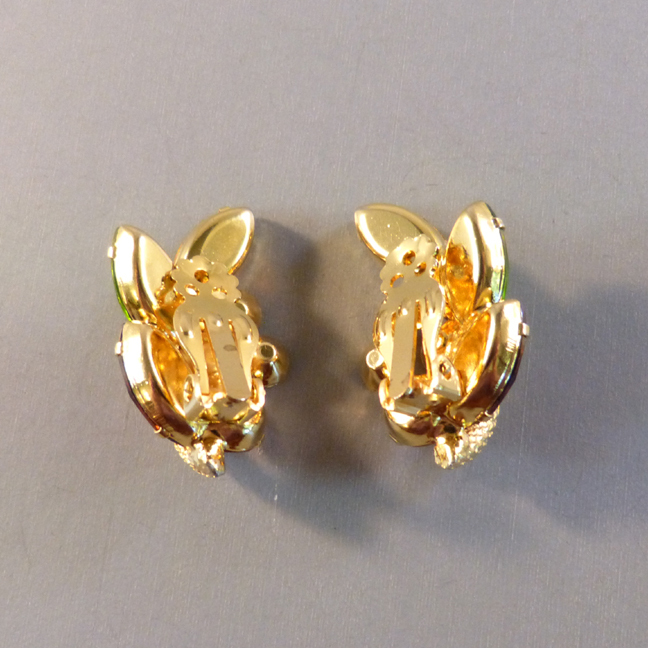 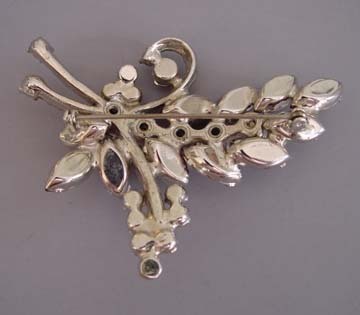 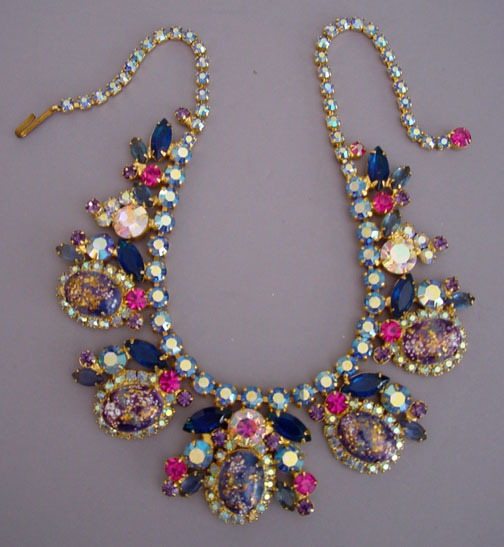 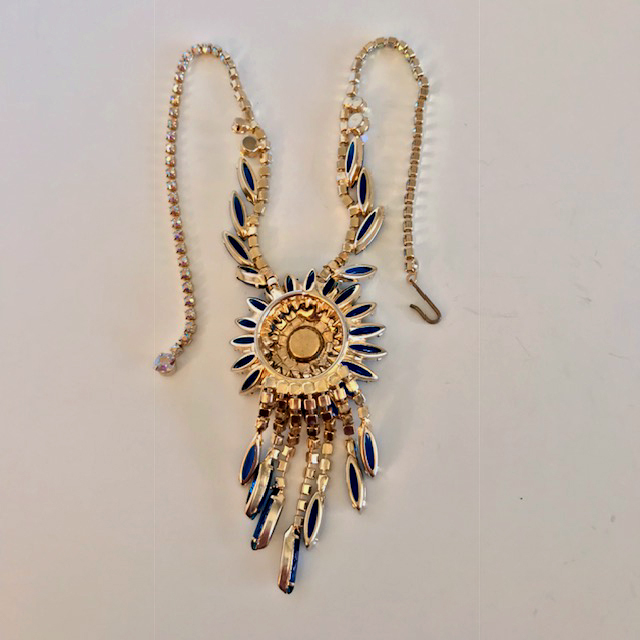 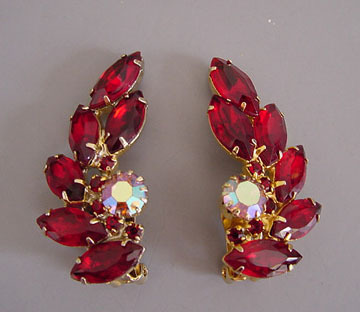 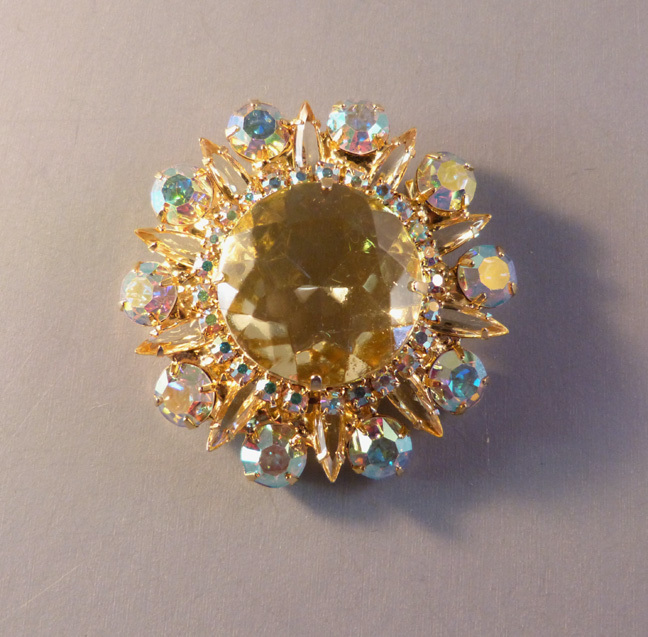 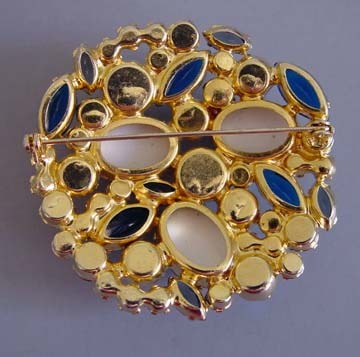 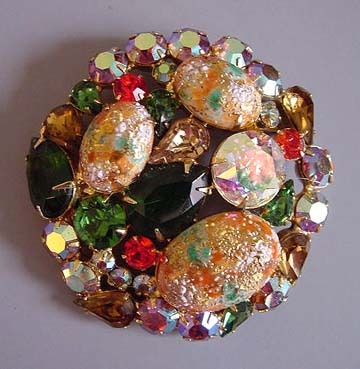 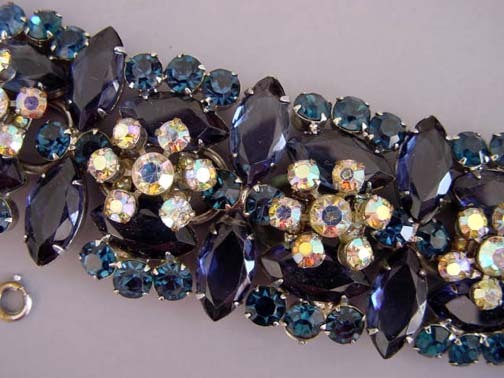 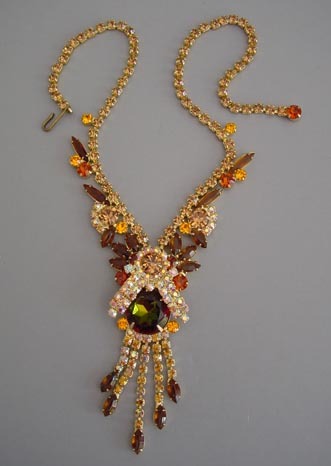 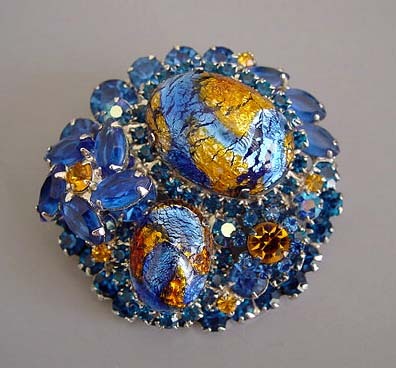 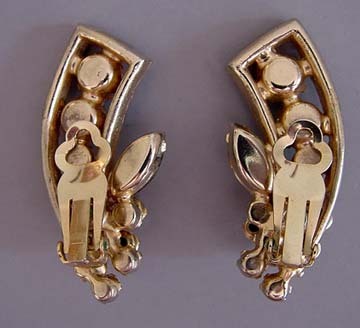 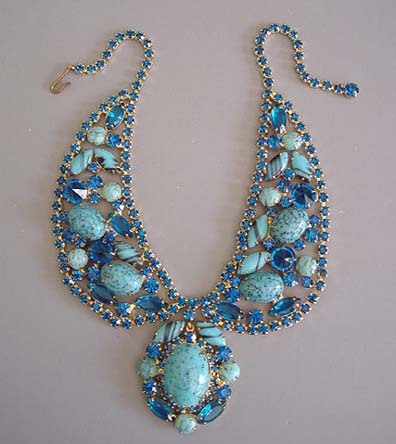 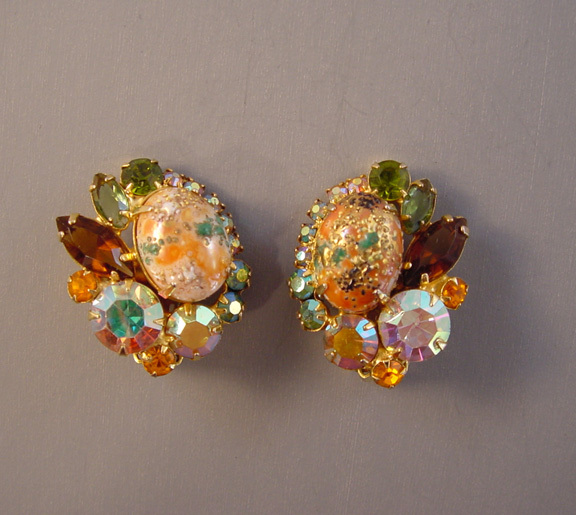 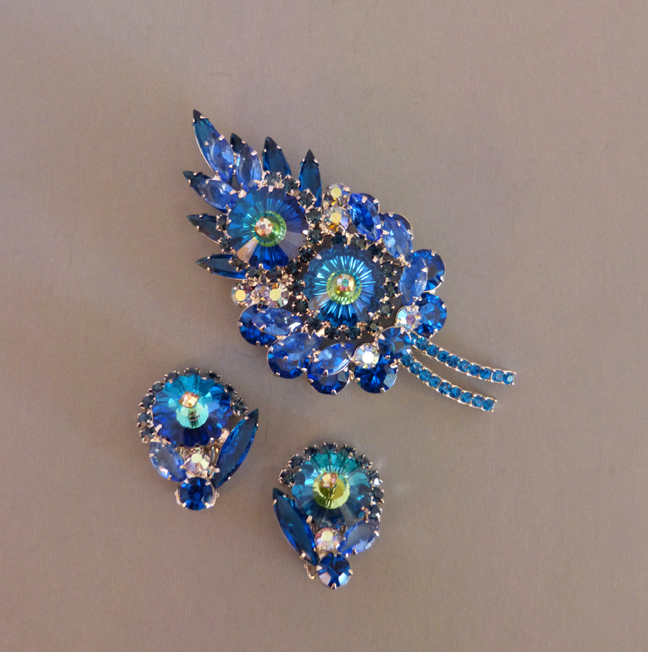 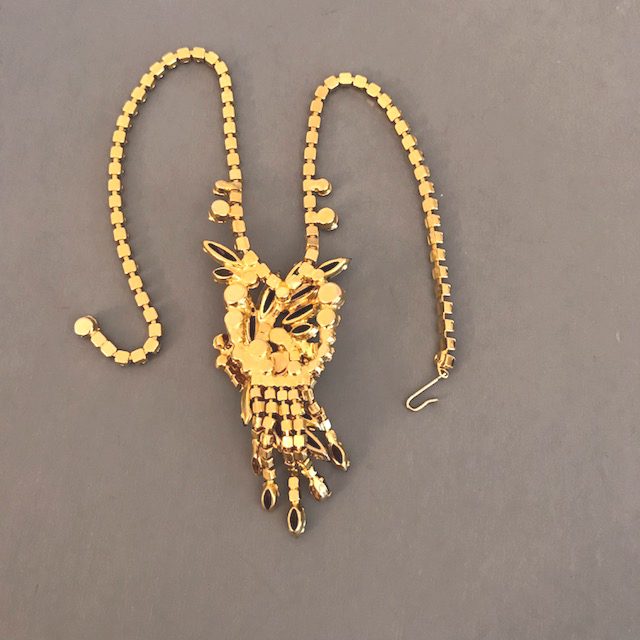 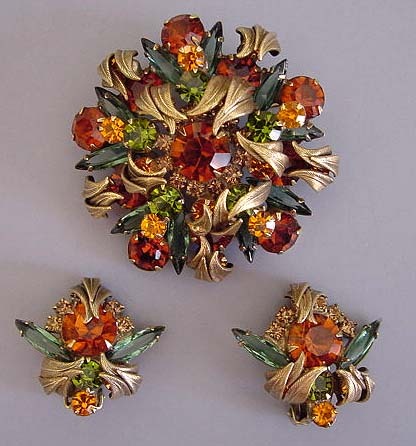 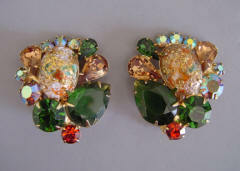 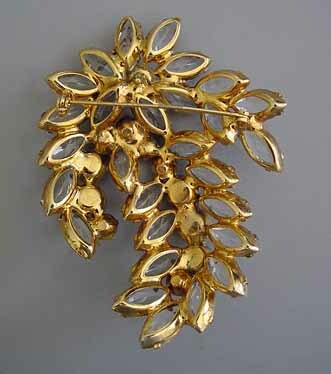 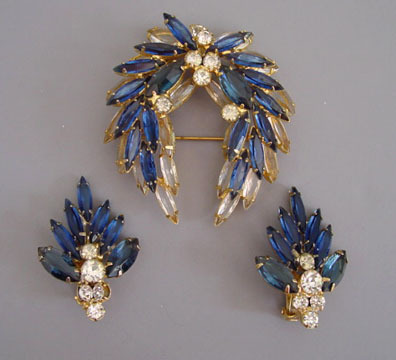 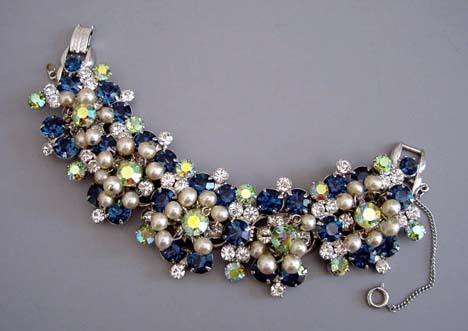 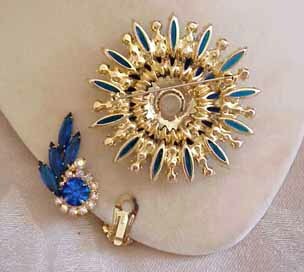 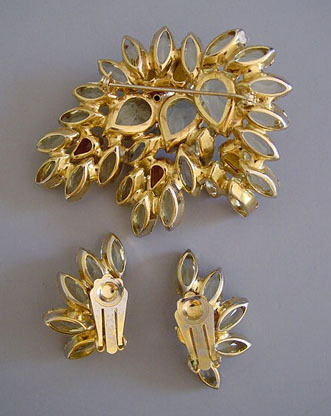 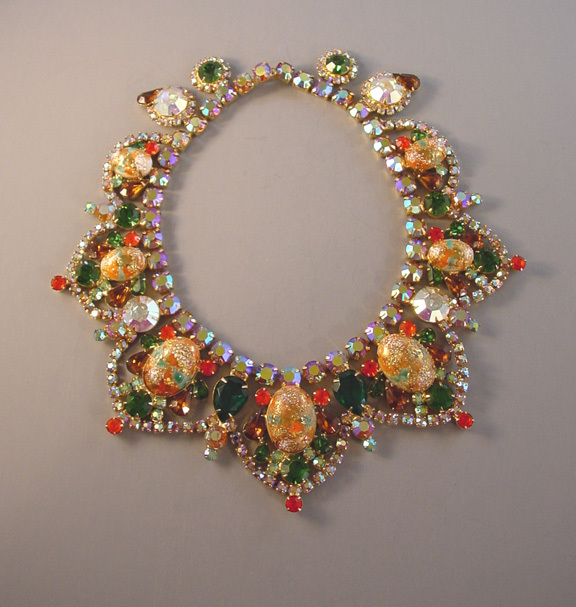 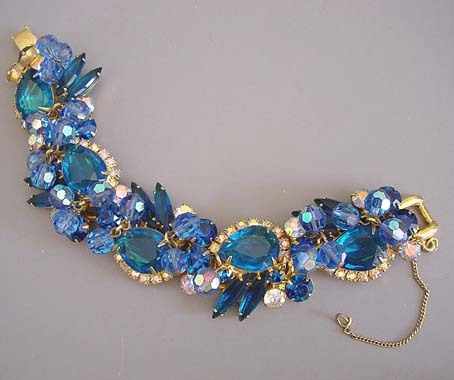 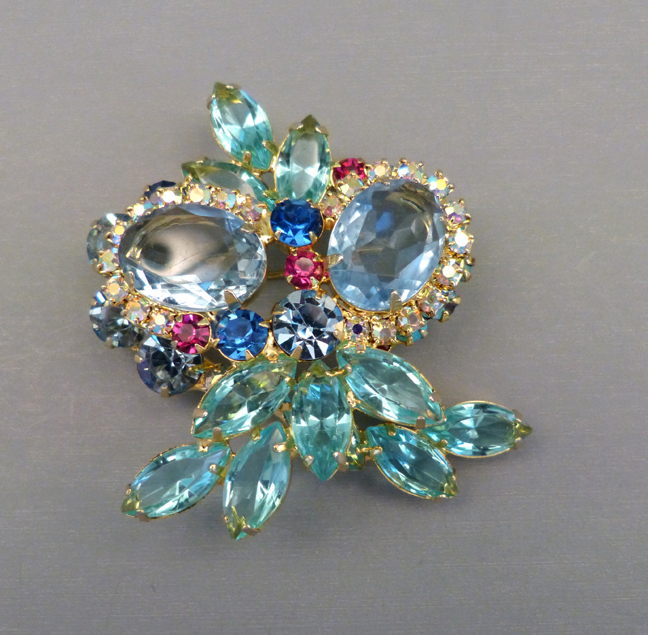 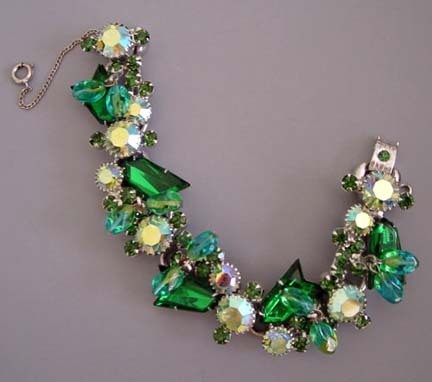 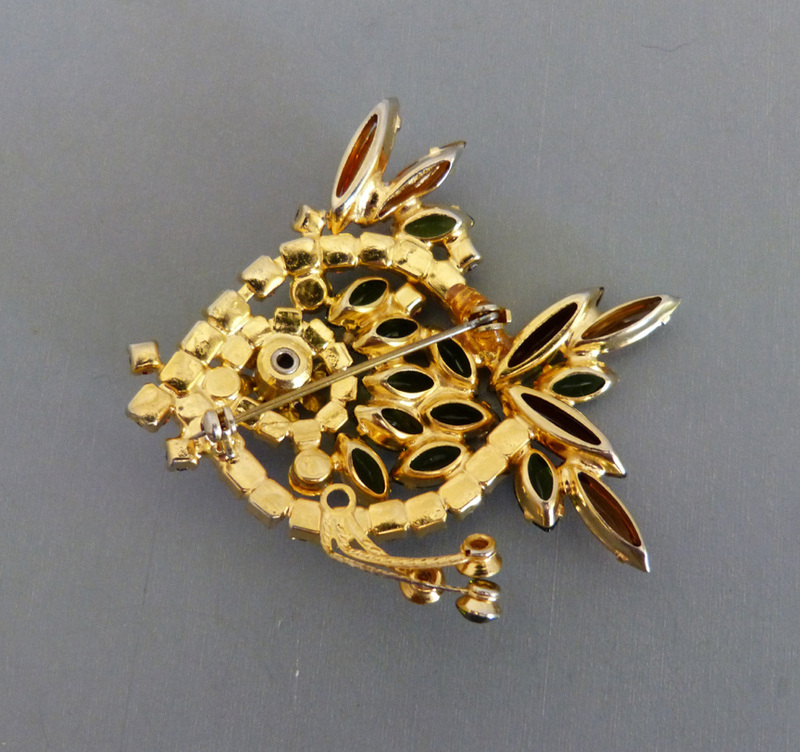 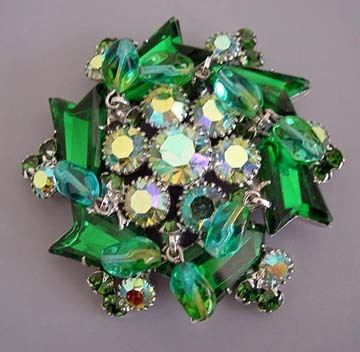 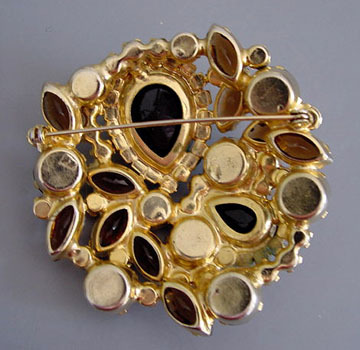 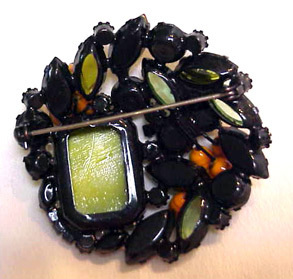 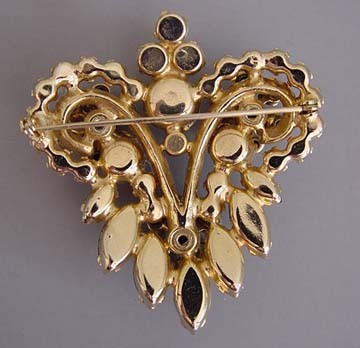 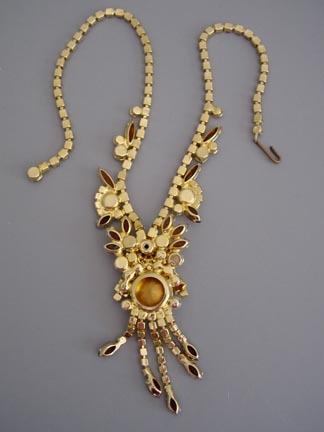 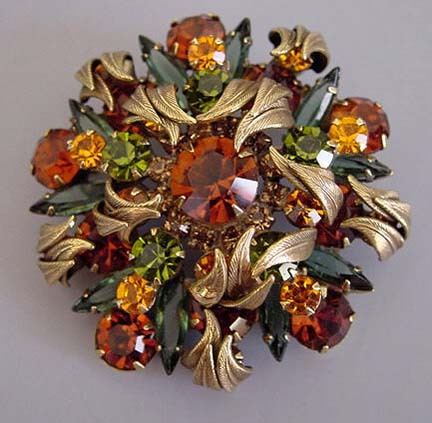 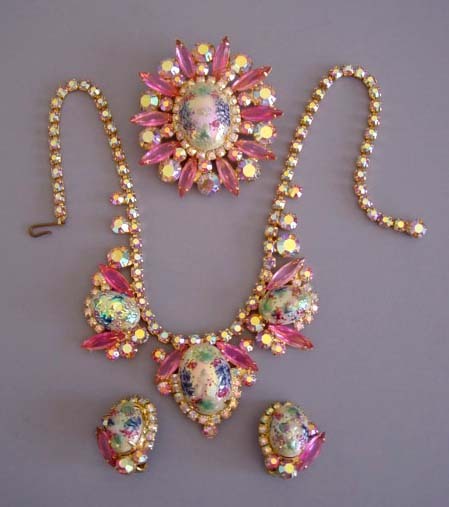 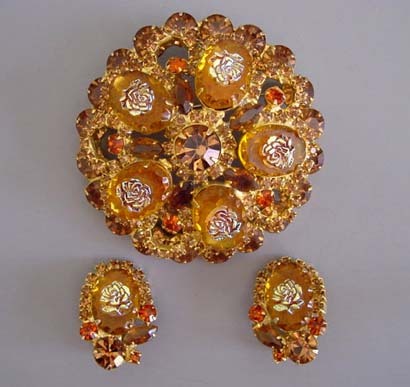 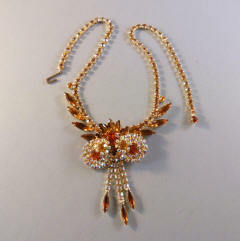 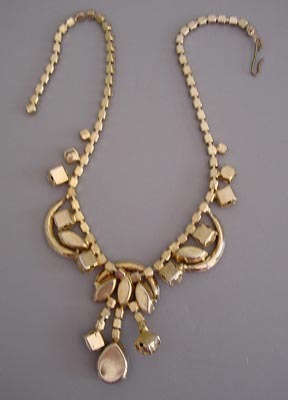 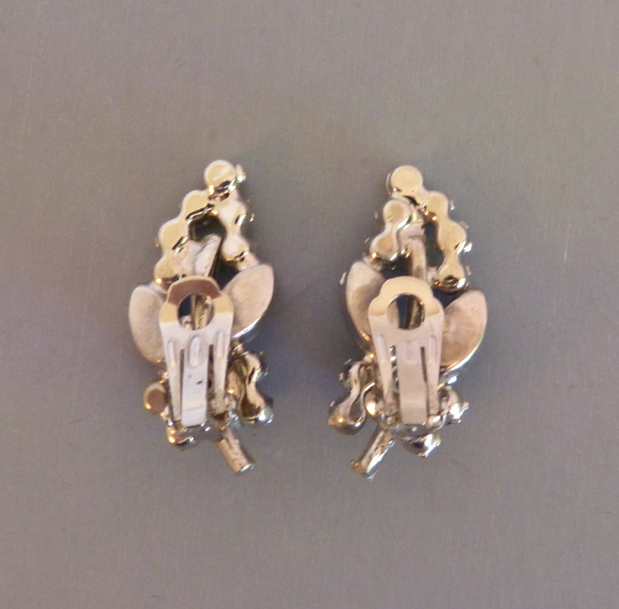 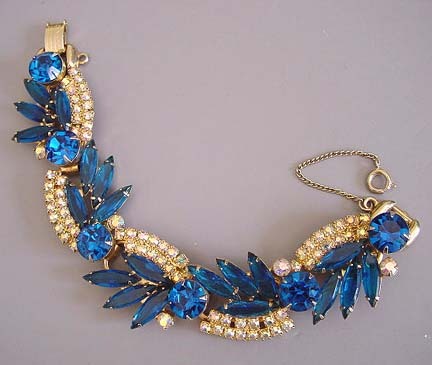 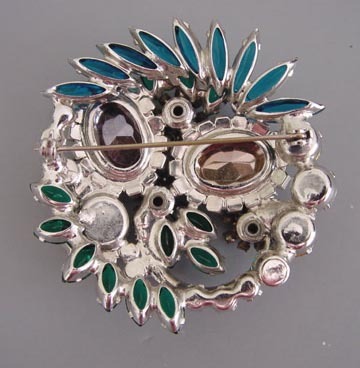 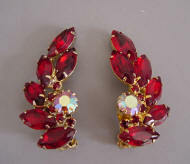 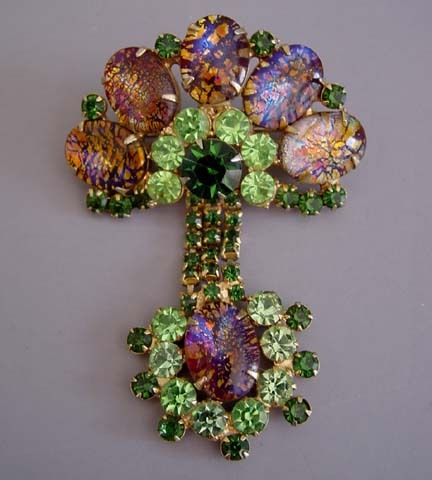 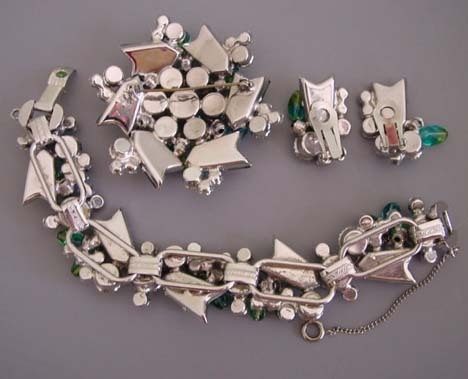 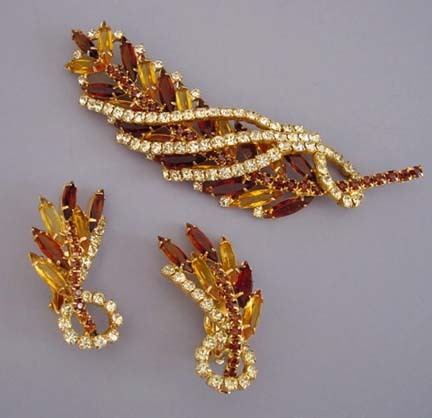 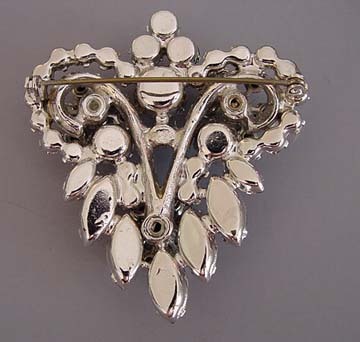 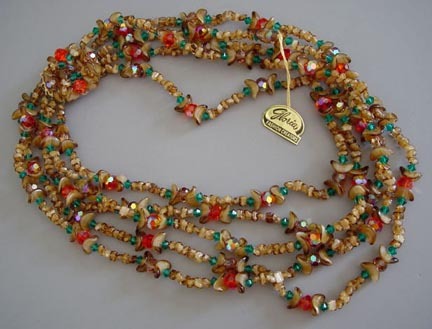 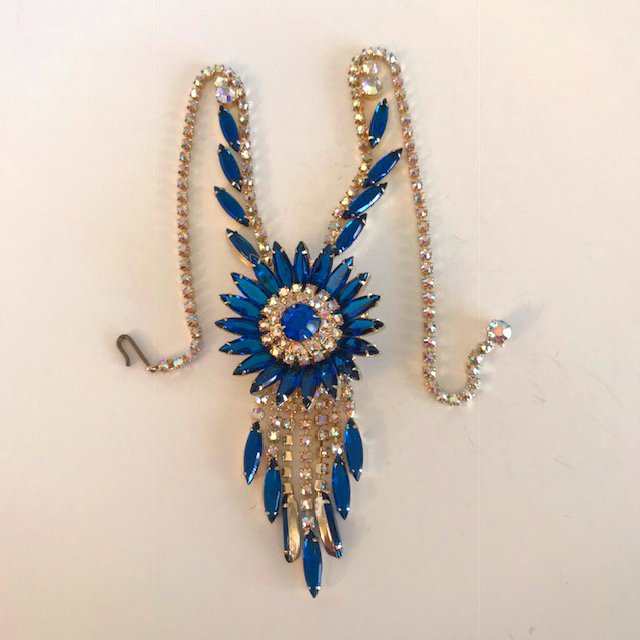 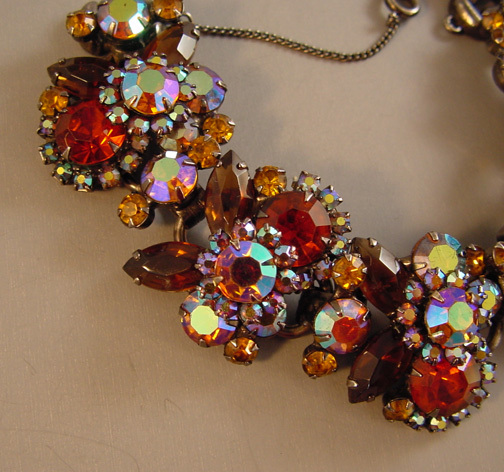 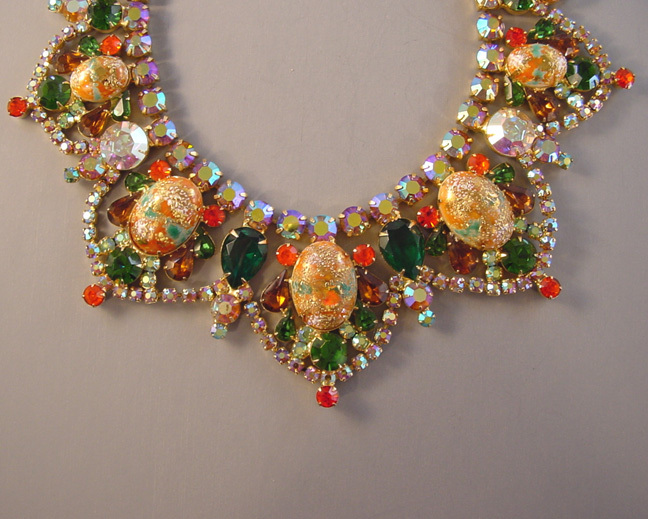 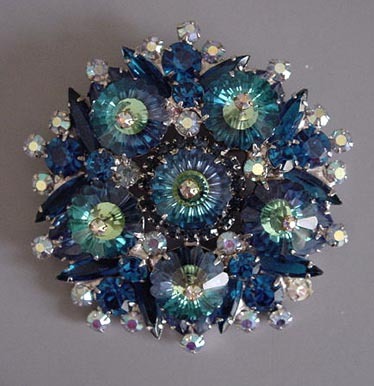 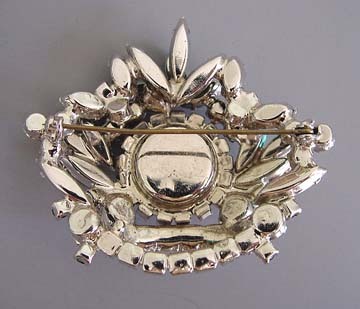 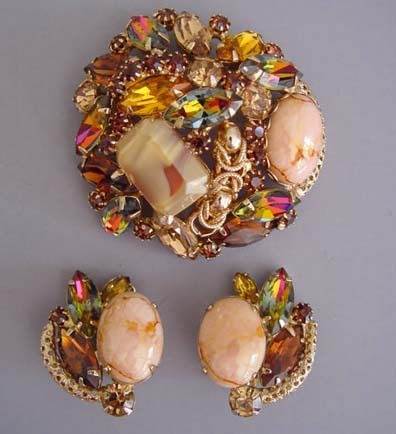 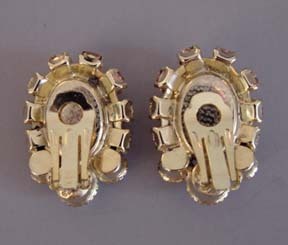 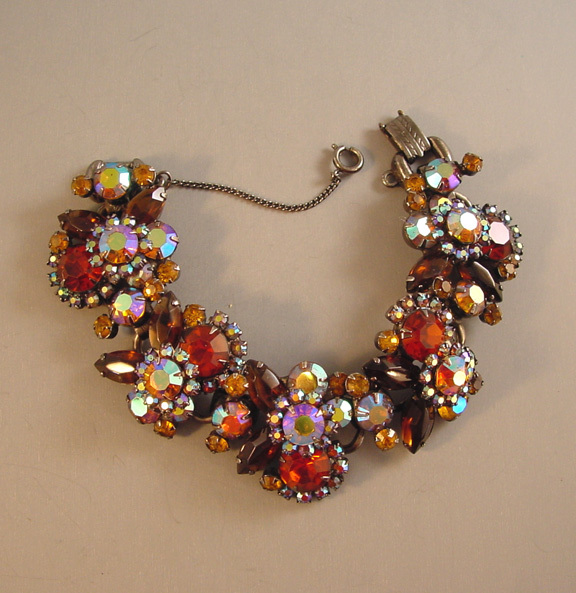 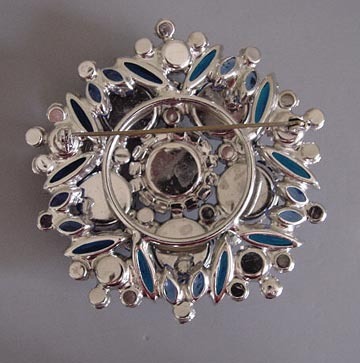 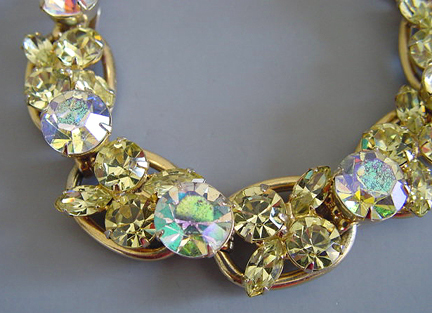 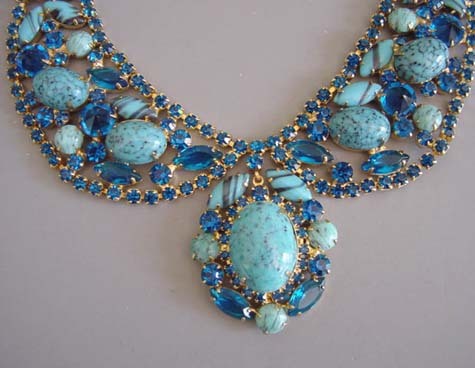 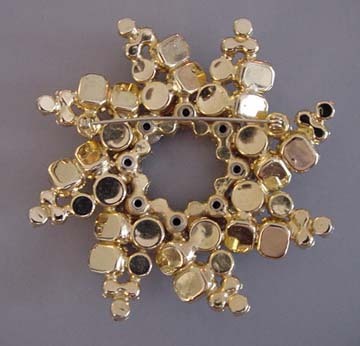 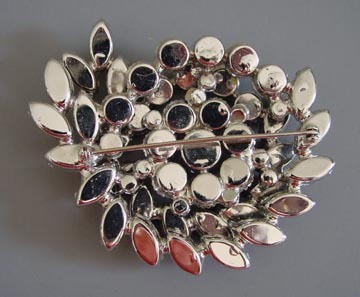 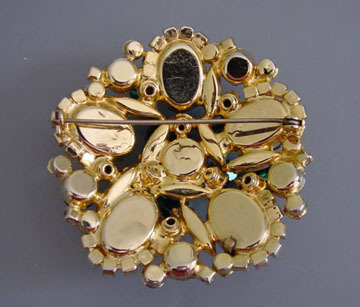 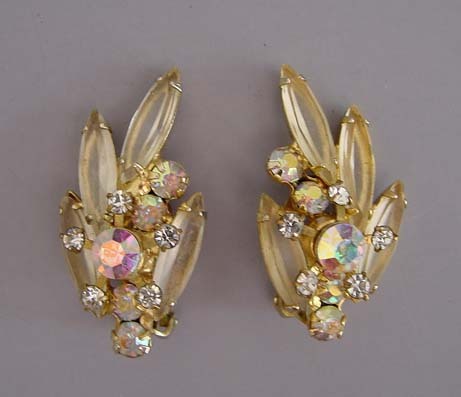 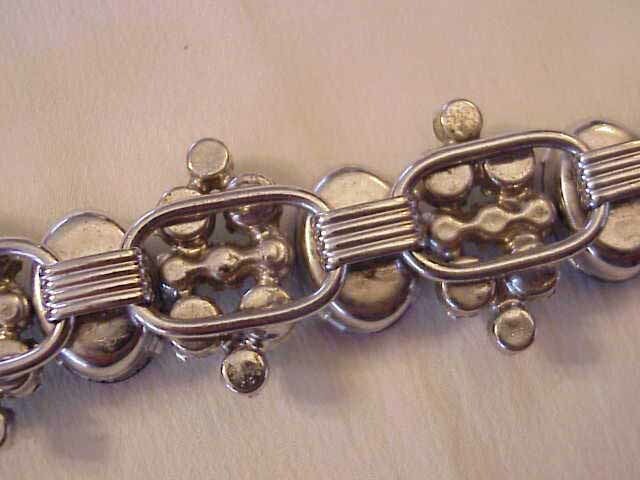 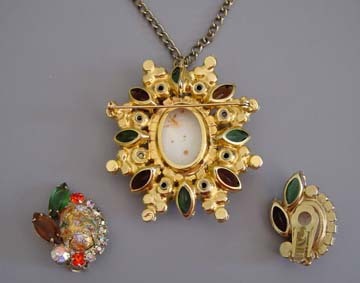 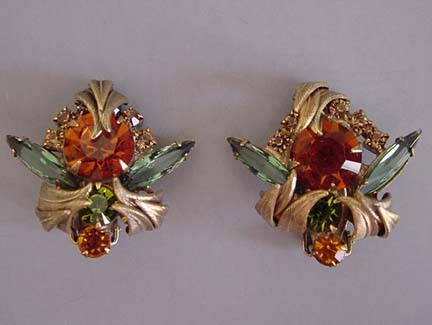 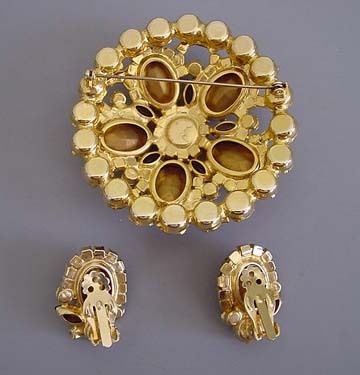 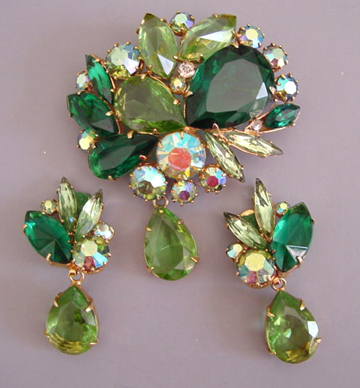 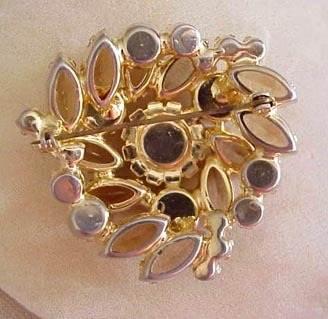 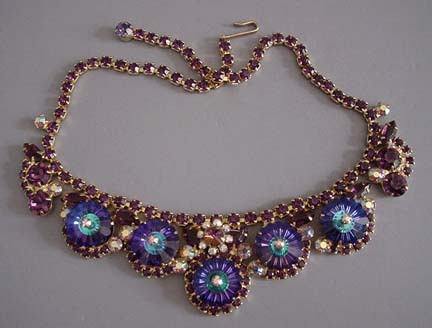 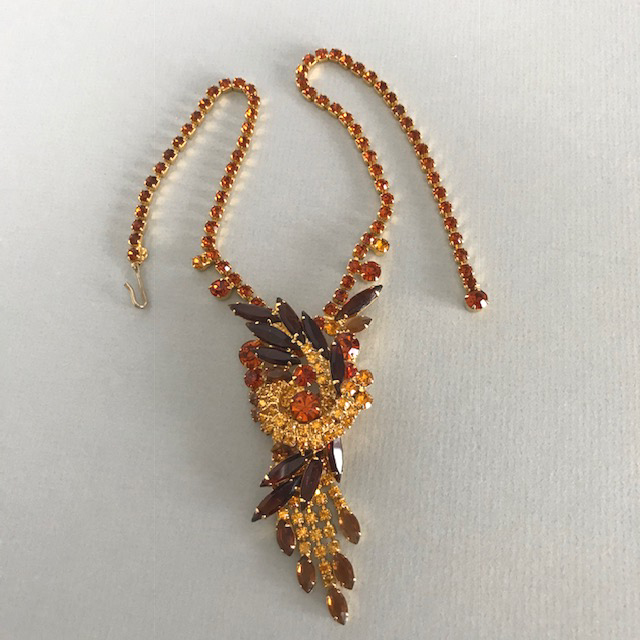 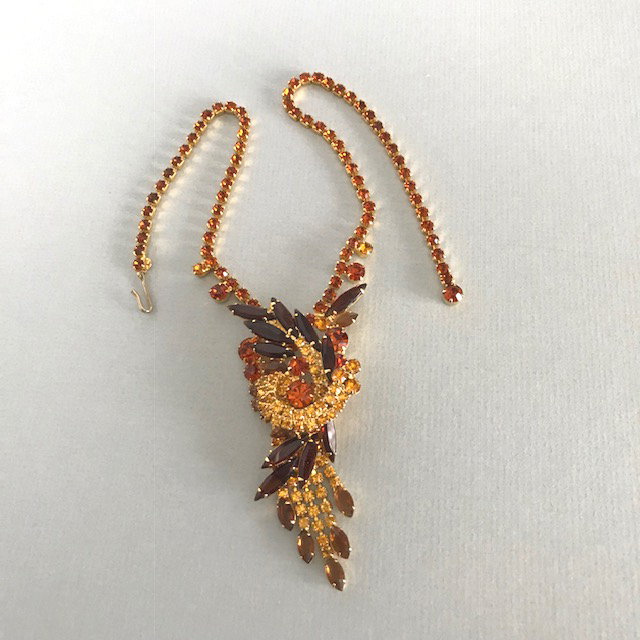 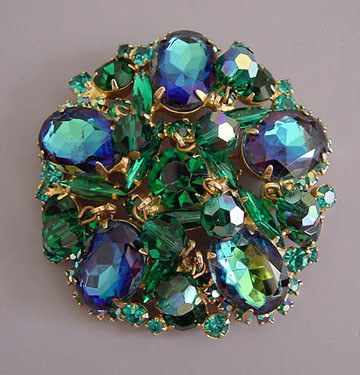 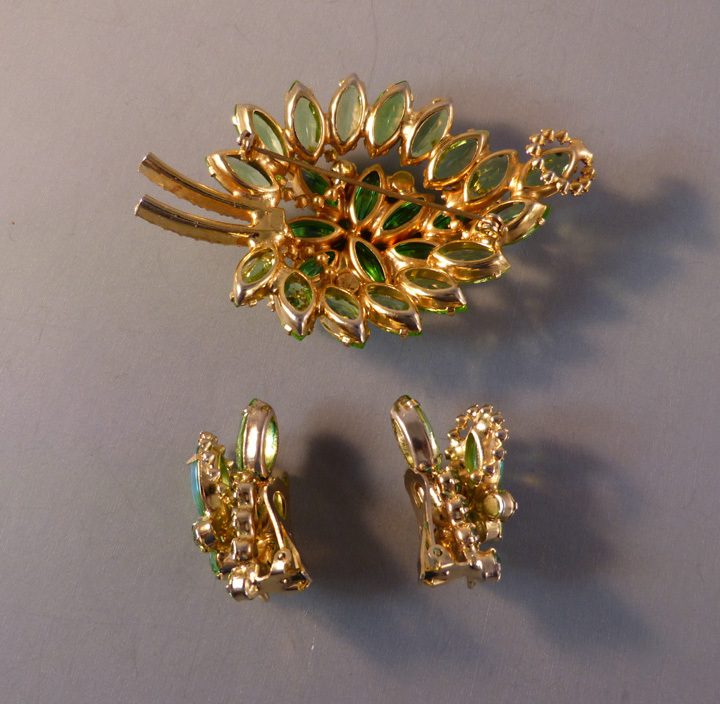 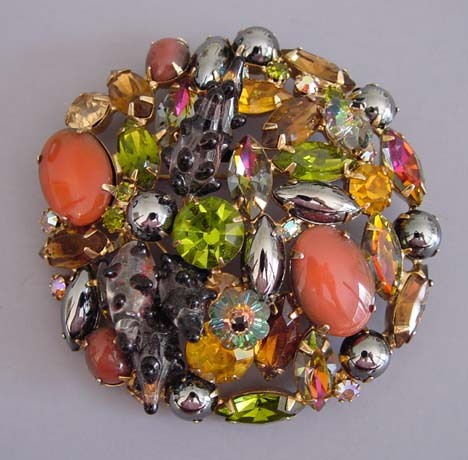 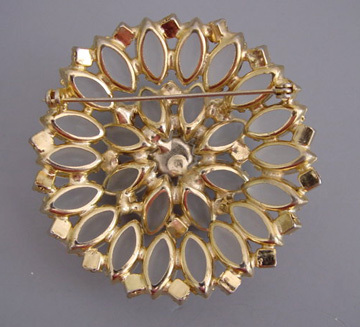 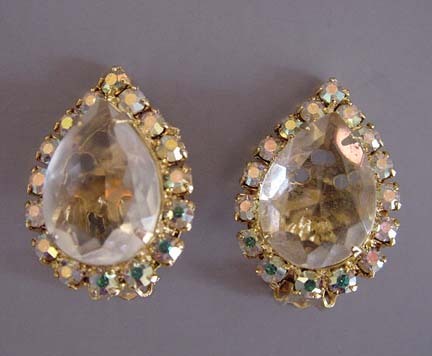 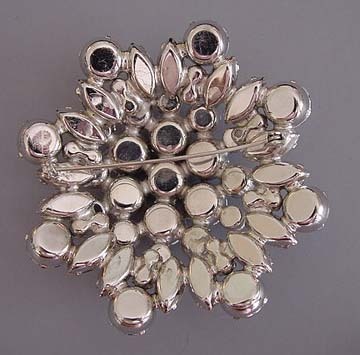 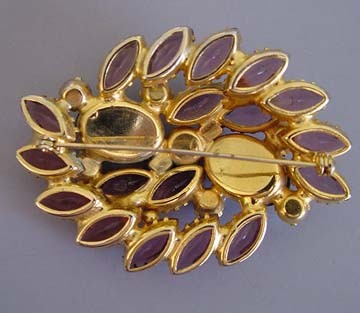 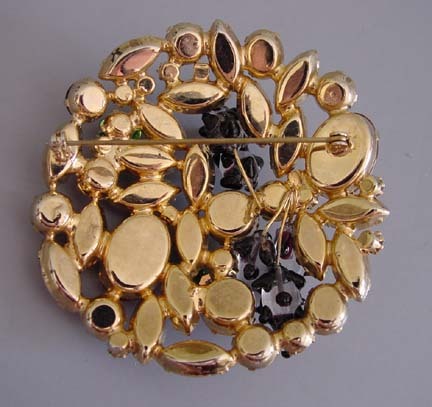 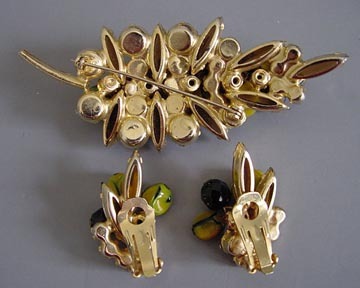 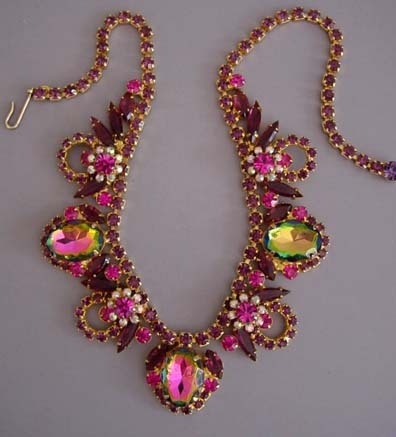 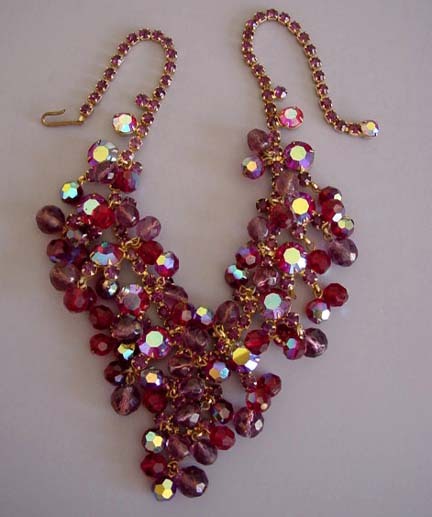 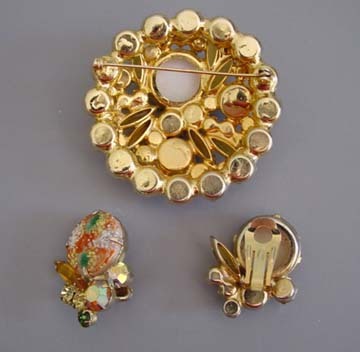 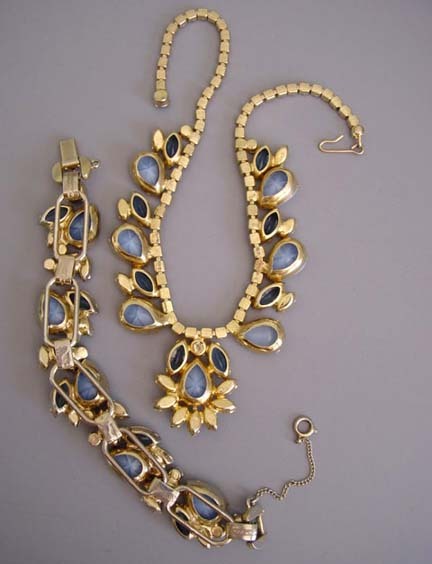 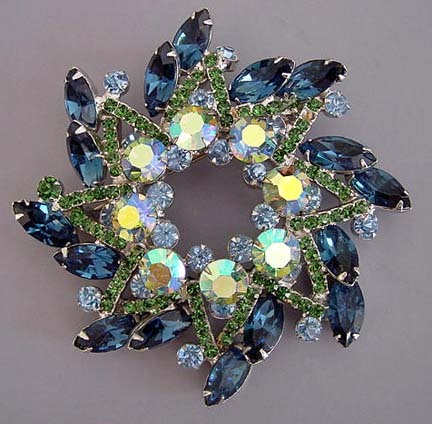 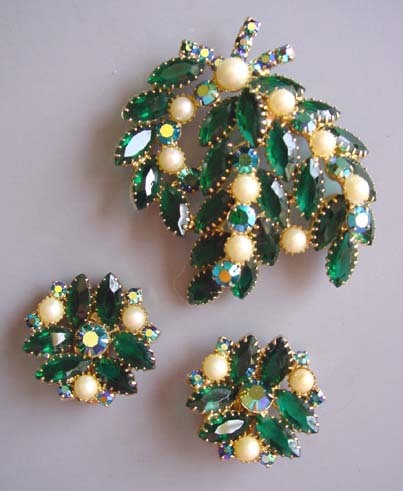 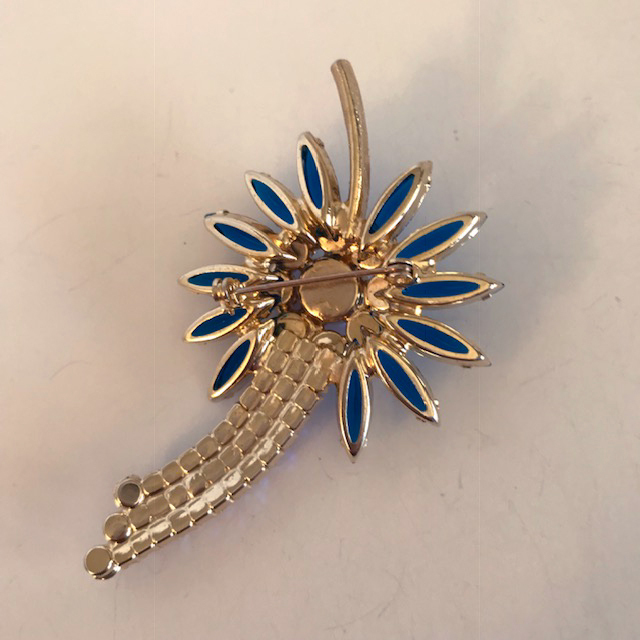 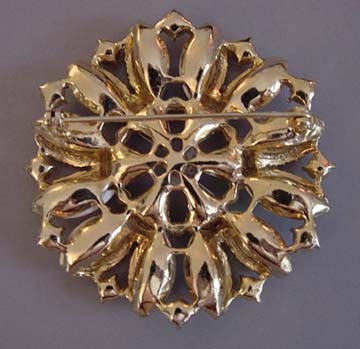 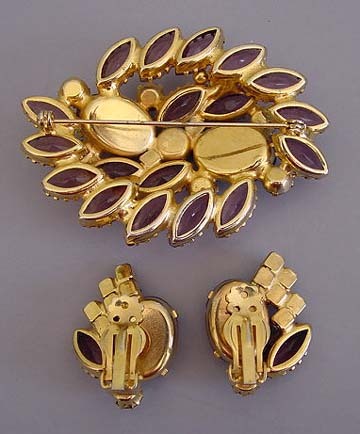 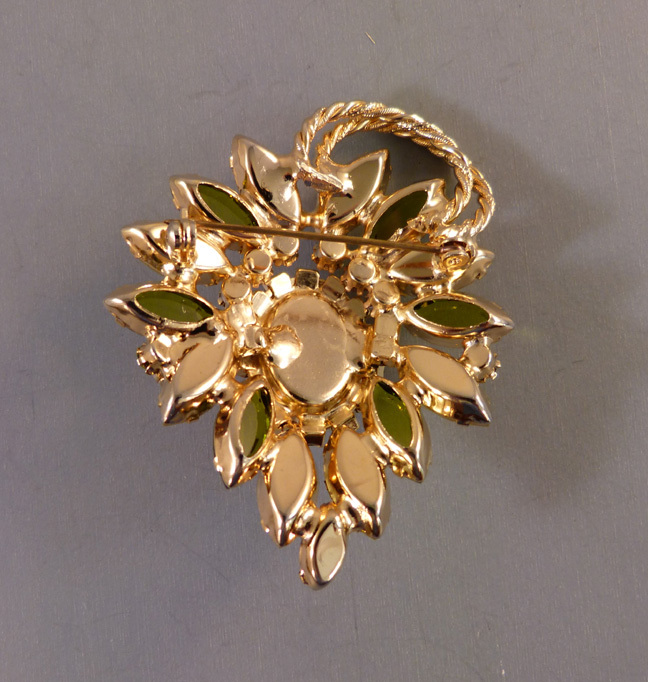 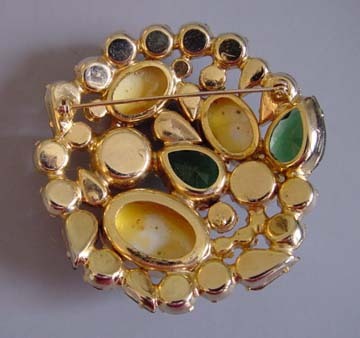 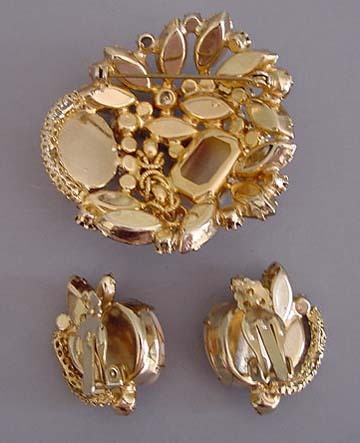 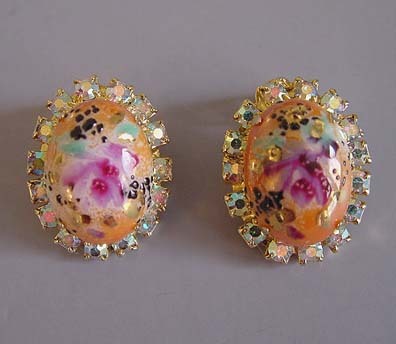 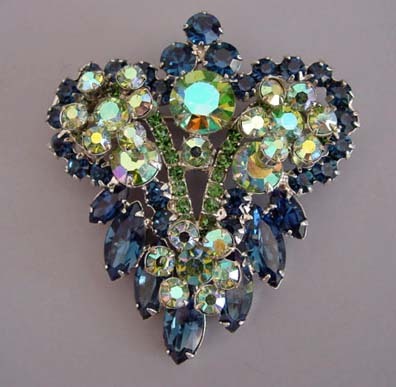 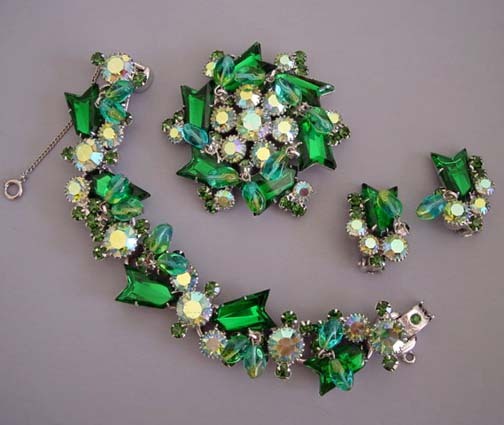 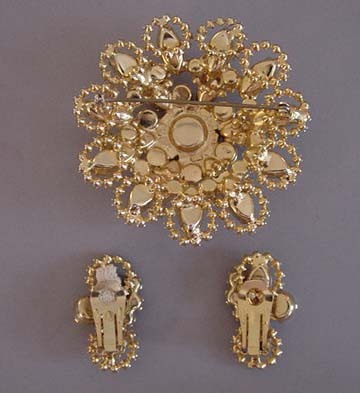 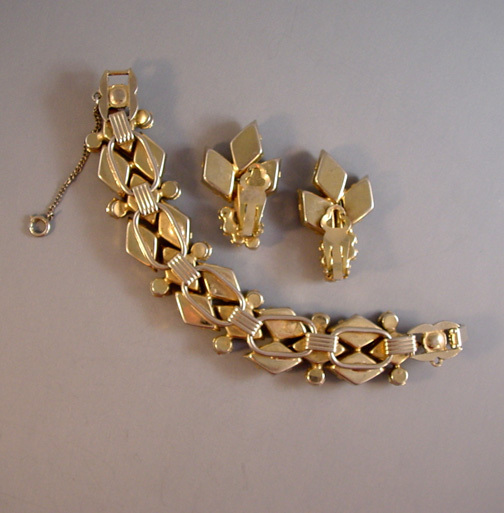 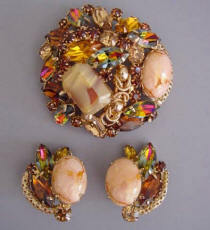 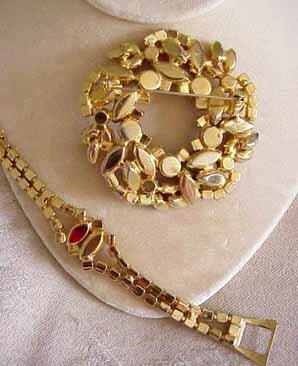 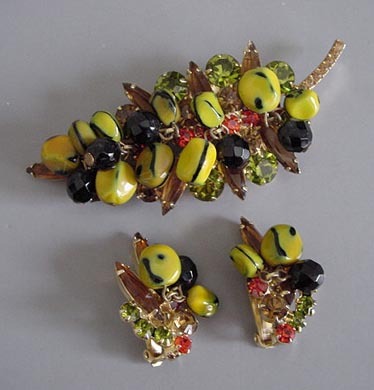 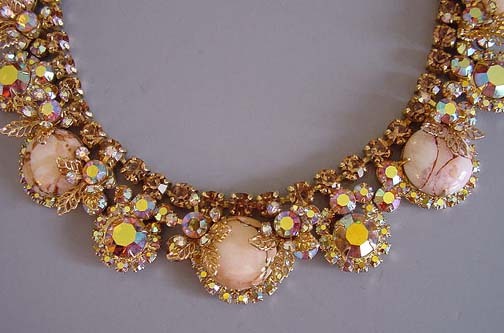 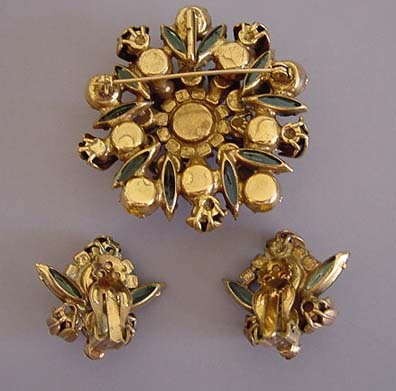 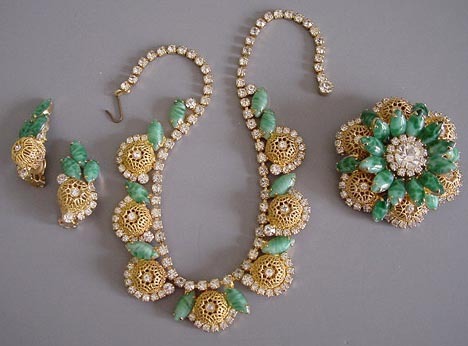 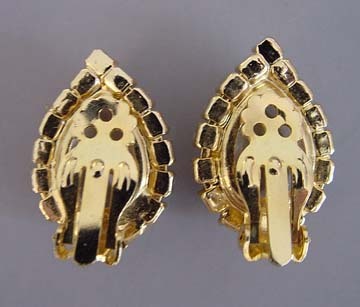 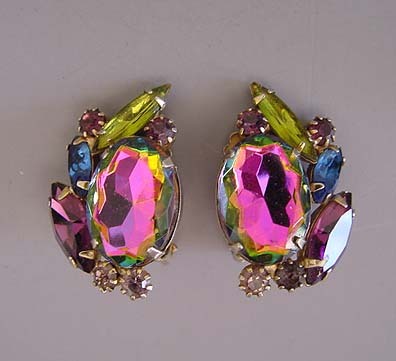 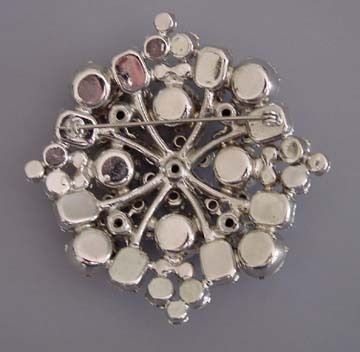 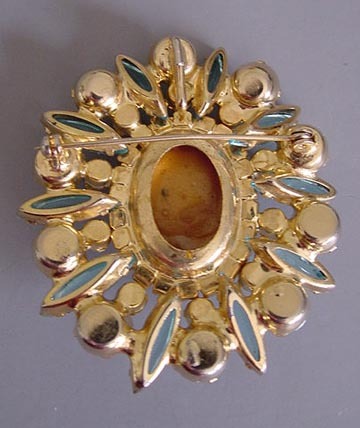 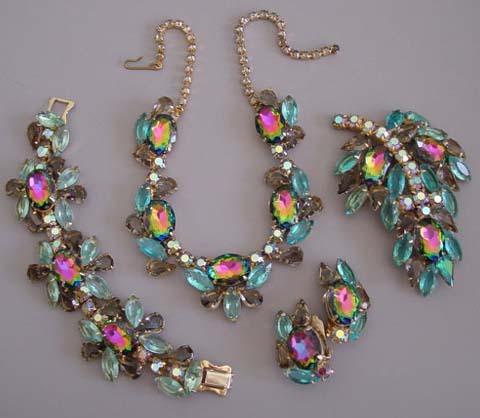 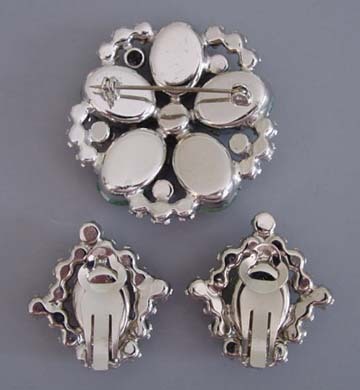 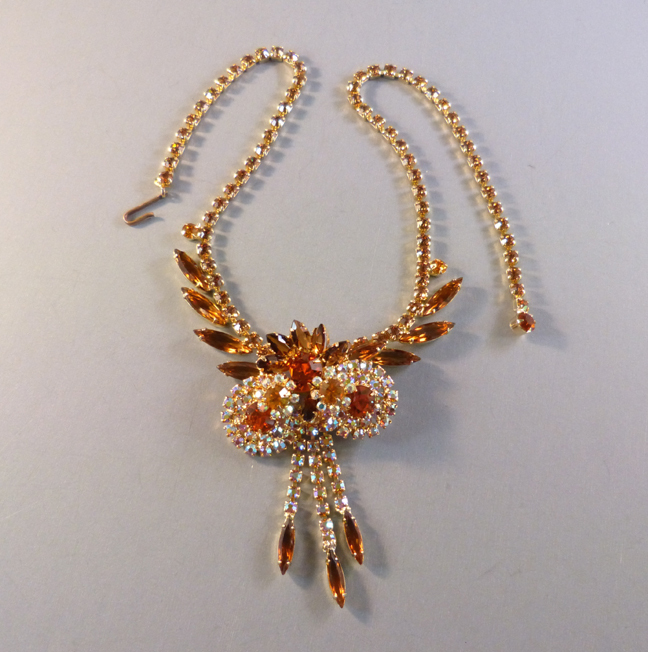 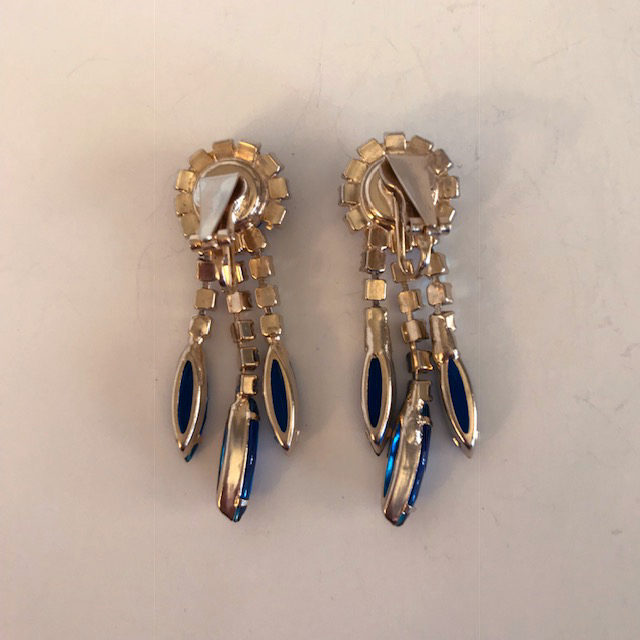 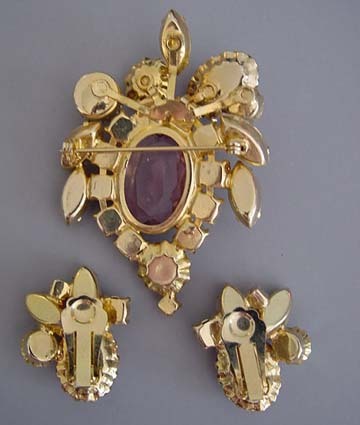 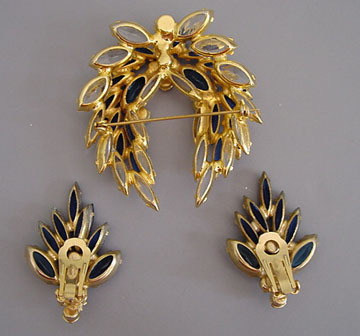 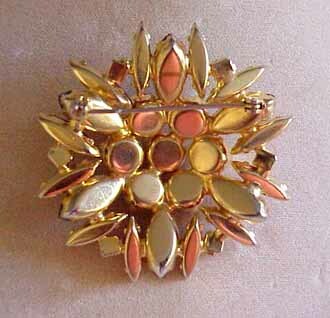 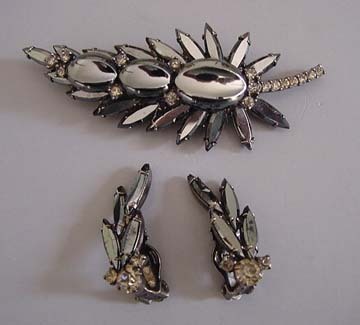 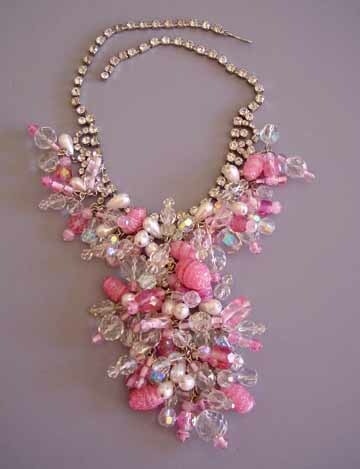 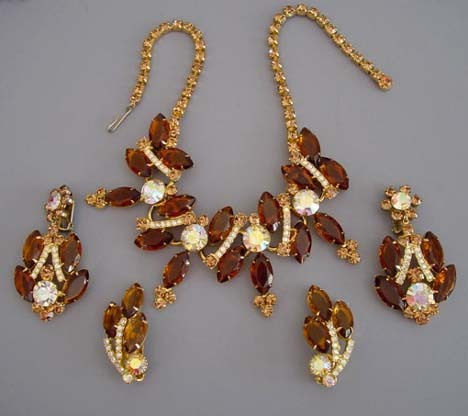 This same style also came with other hang-tags, though, so while we refer to it as "Juliana style", it was actually made in the 1960's by DeLizza & Elster (William DeLizza & Harold Elster, New York City, NY) and sold along with a variety of their designs to other jewelry companies. 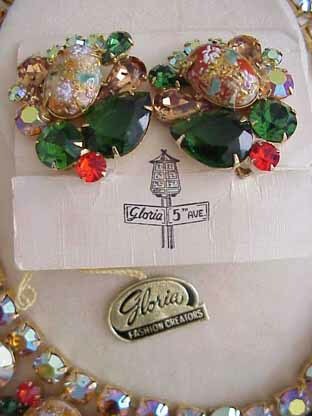 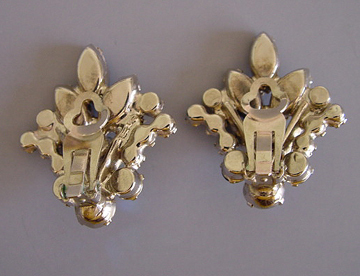 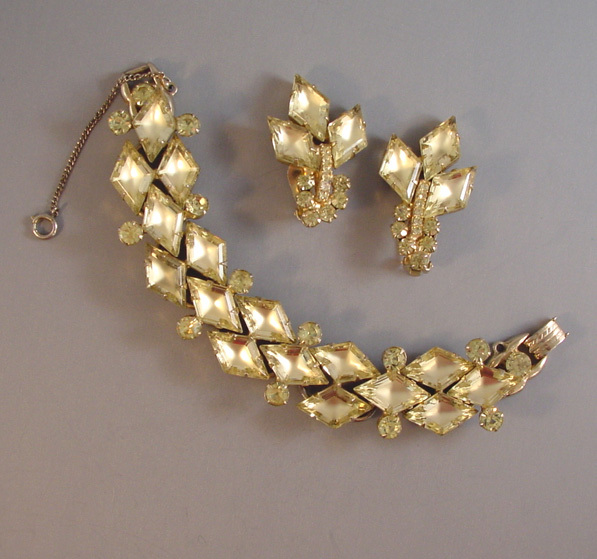 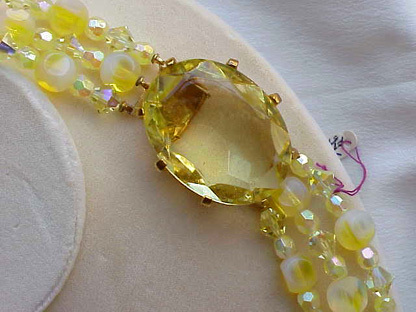 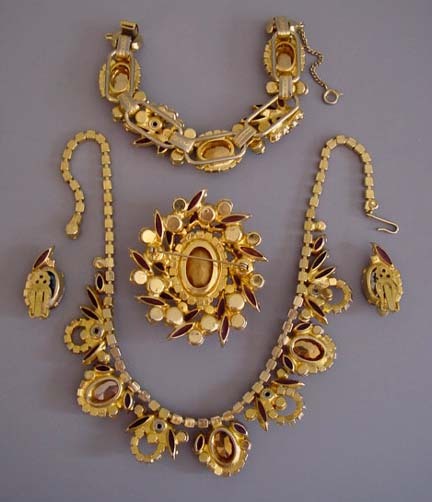 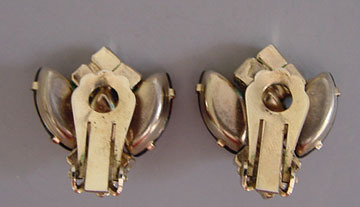 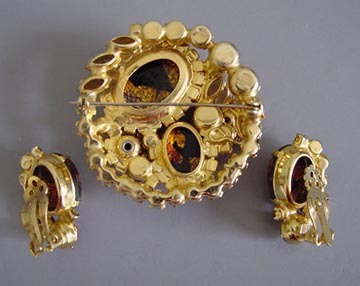 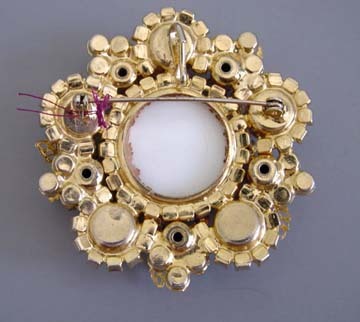 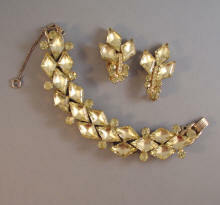 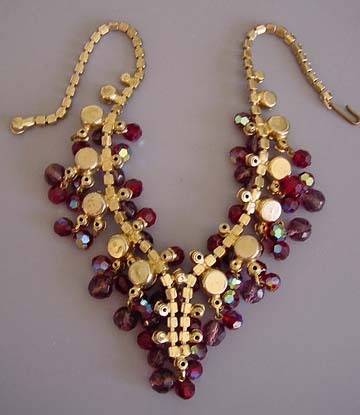 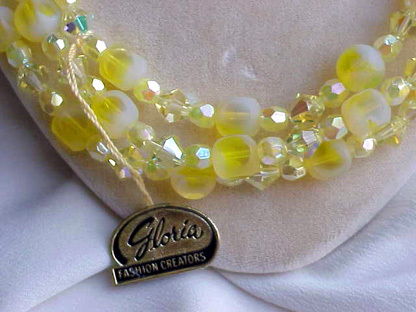 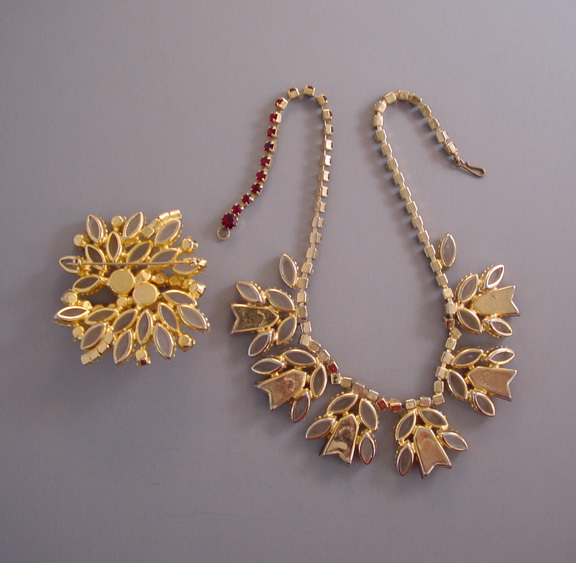 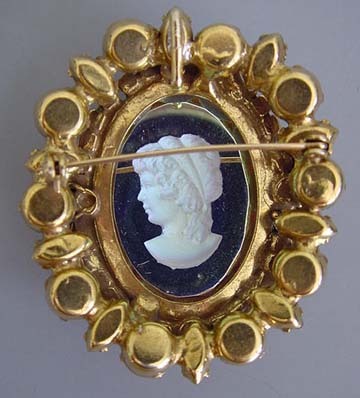 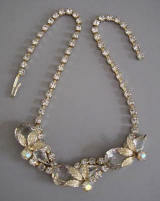 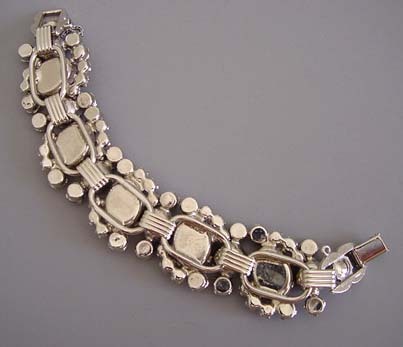 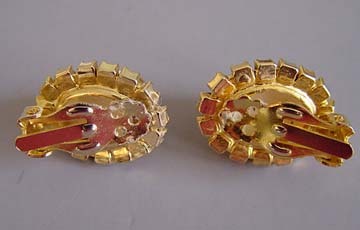 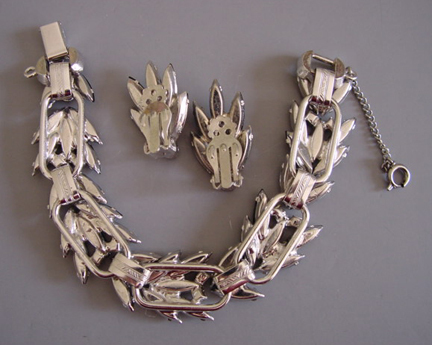 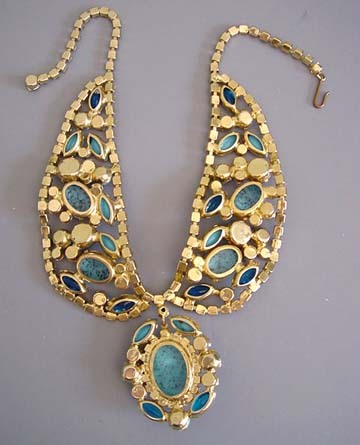 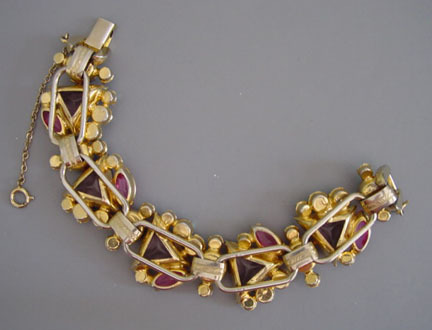 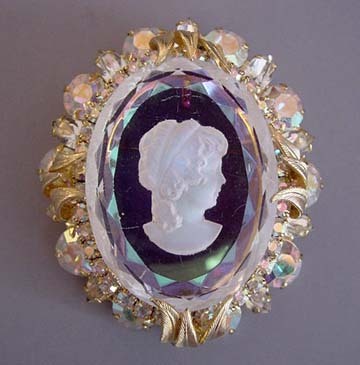 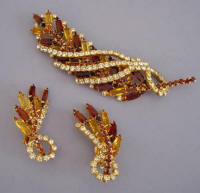 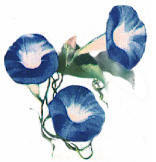 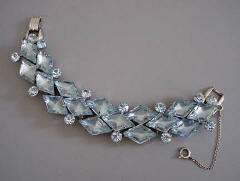 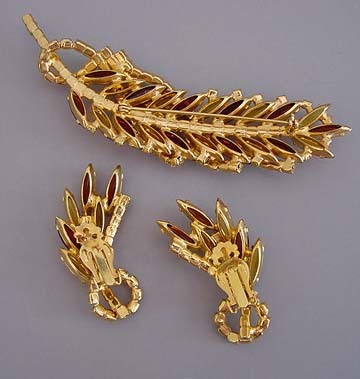 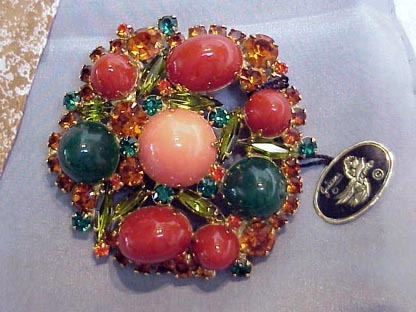 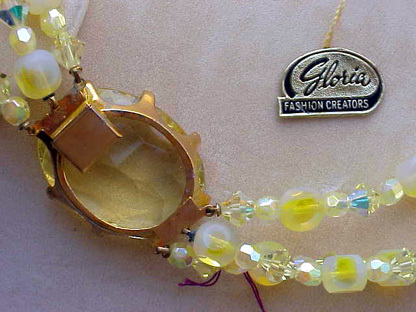 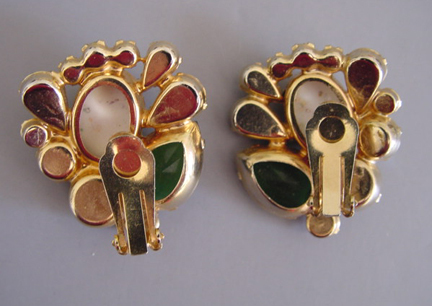 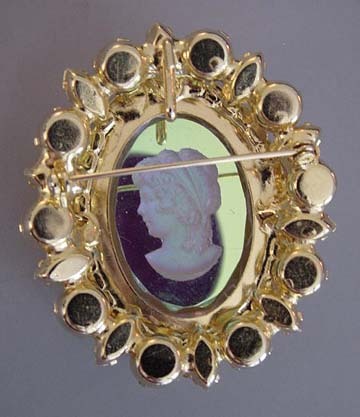 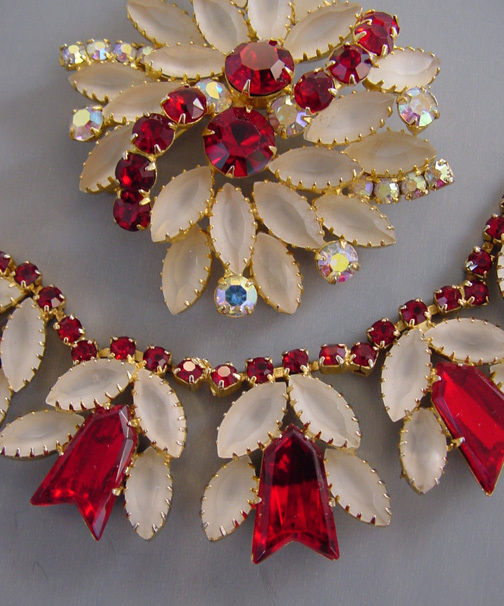 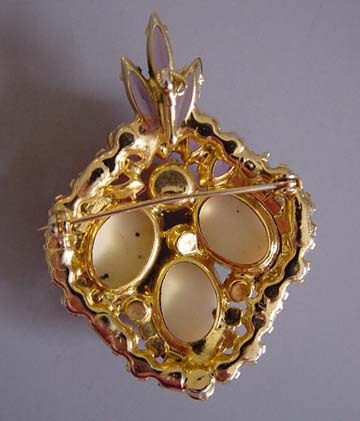 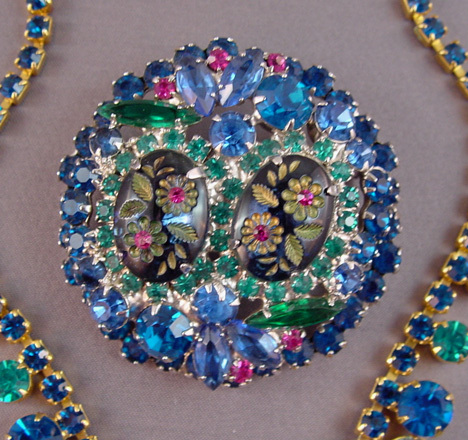 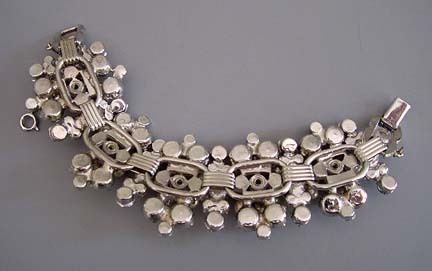 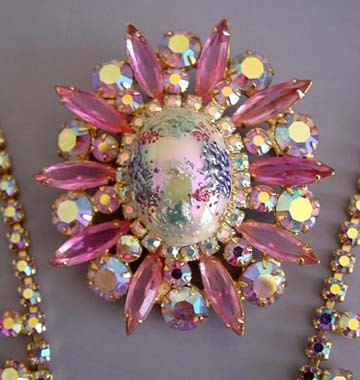 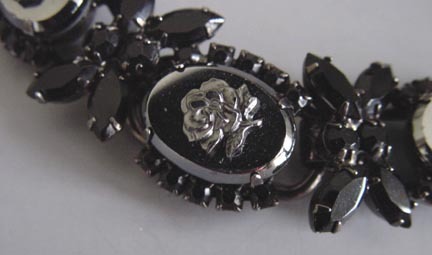 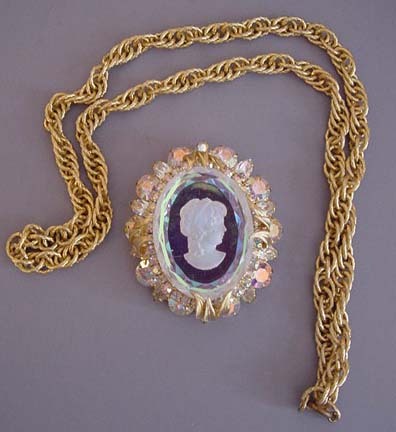 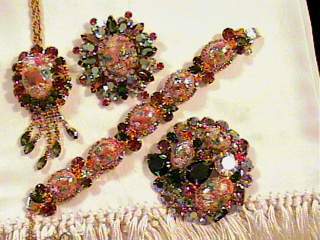 Two of the other paper hang tags seen on this type of jewelry are "Gloria" and "Tara". 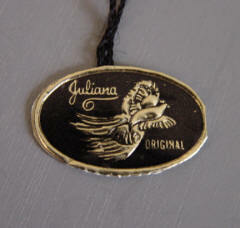 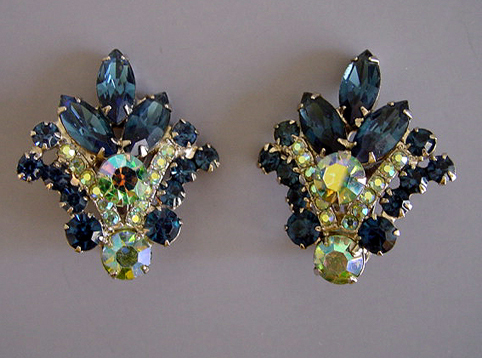 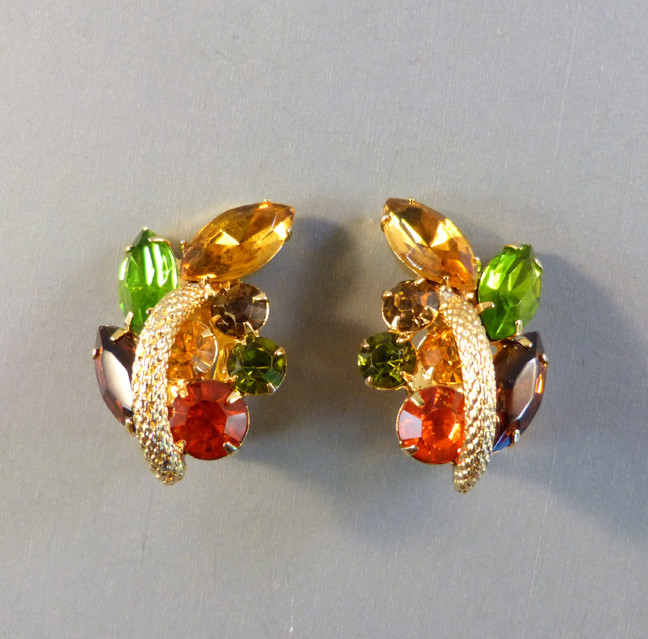 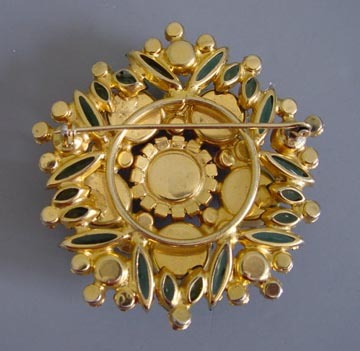 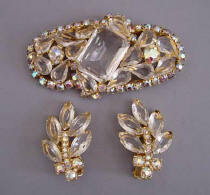 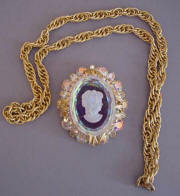 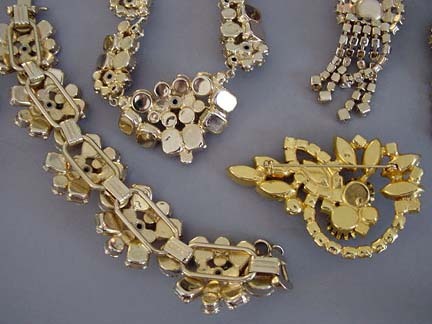 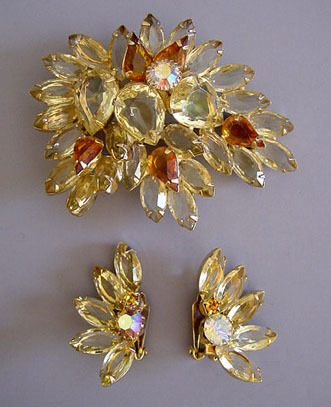 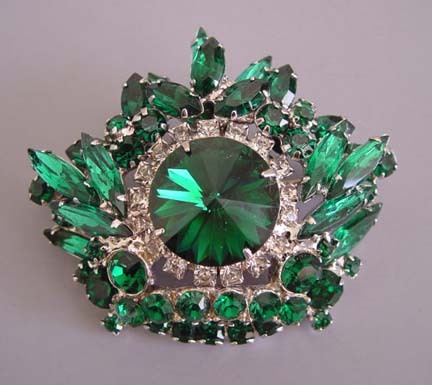 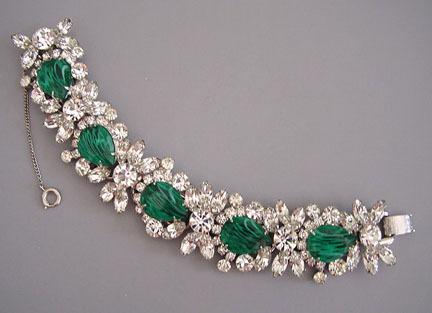 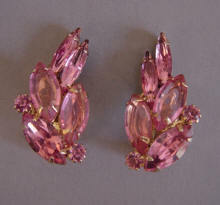 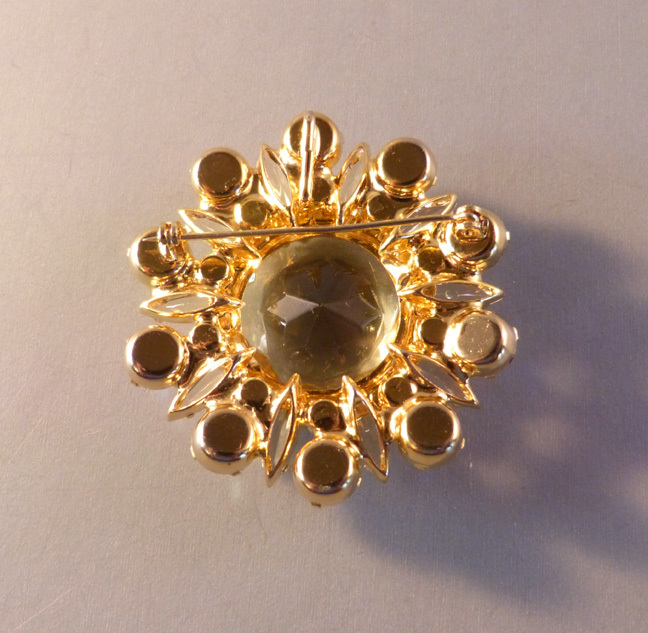 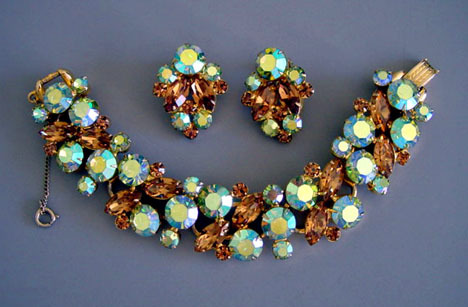 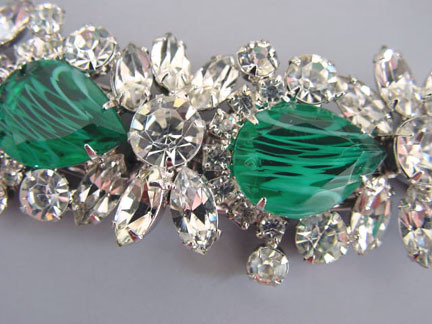 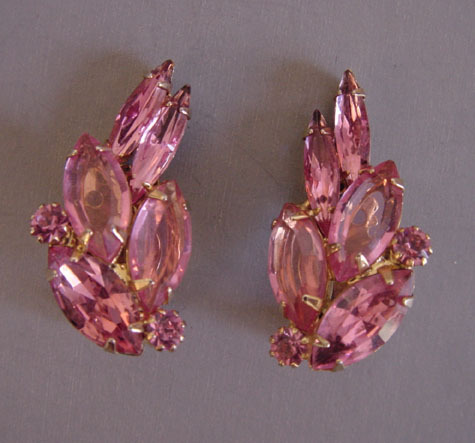 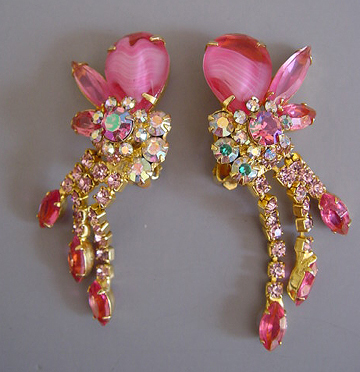 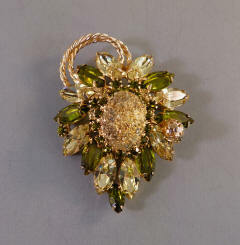 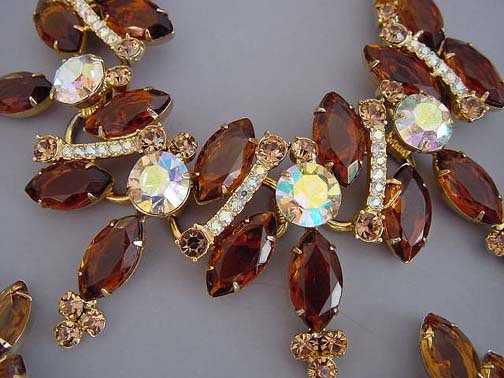 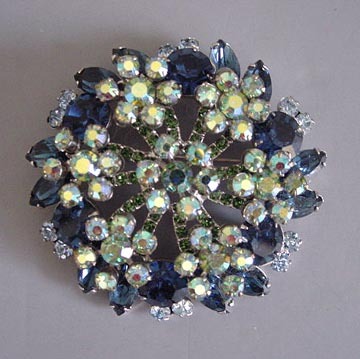 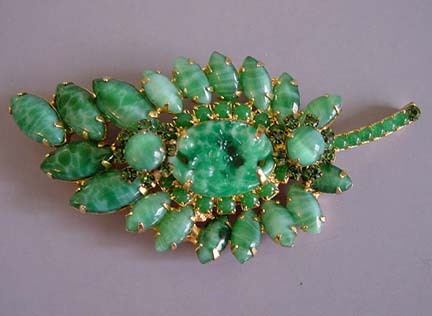 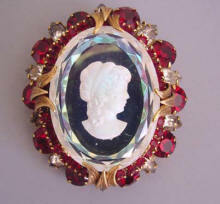 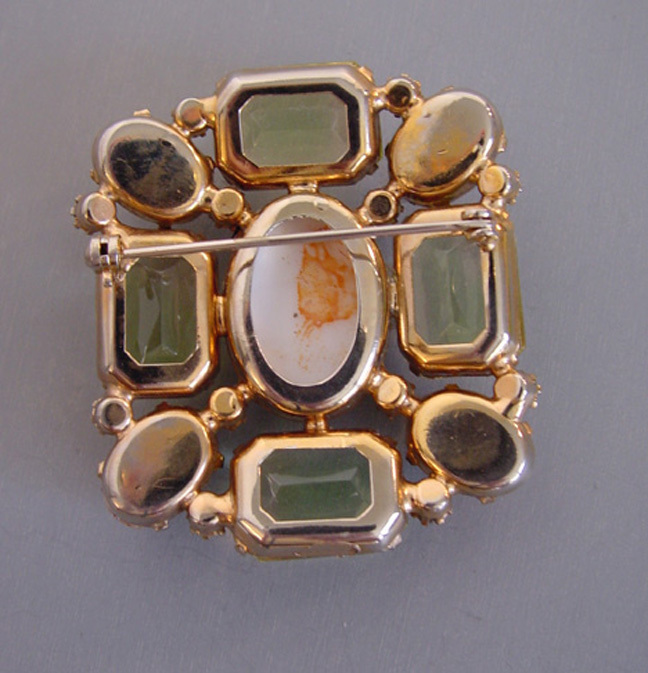 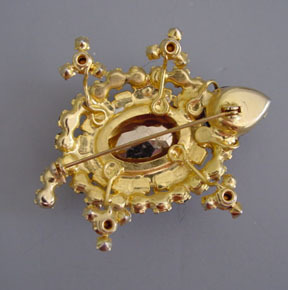 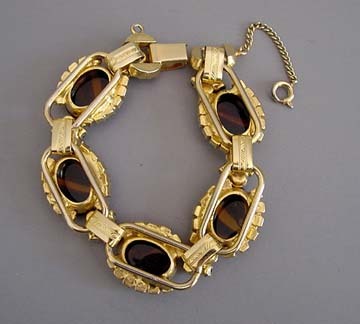 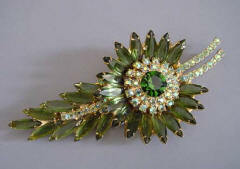 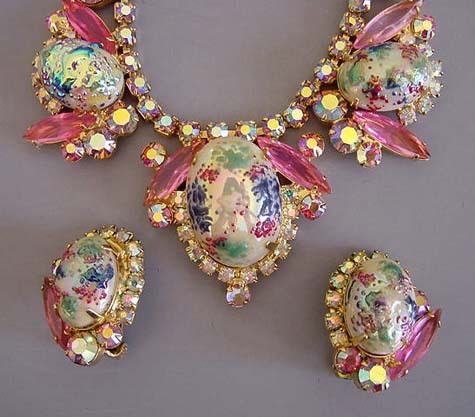 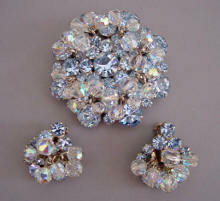 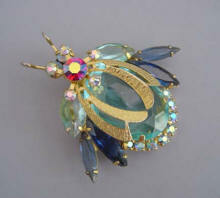 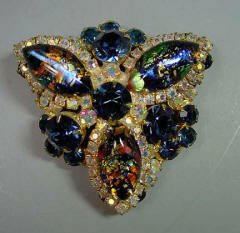 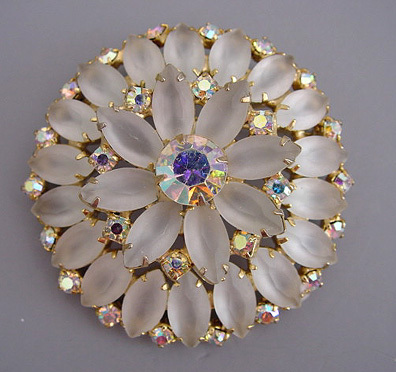 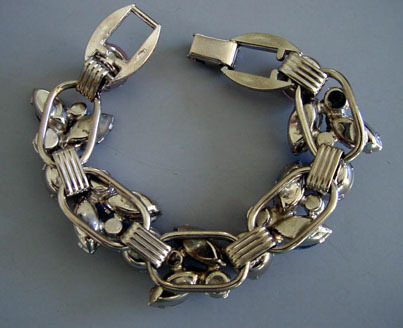 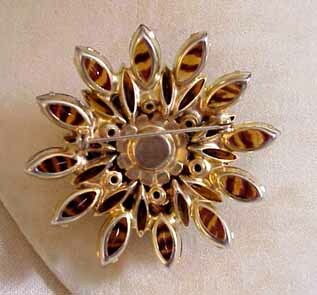 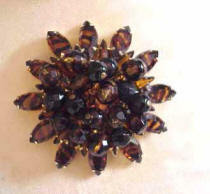 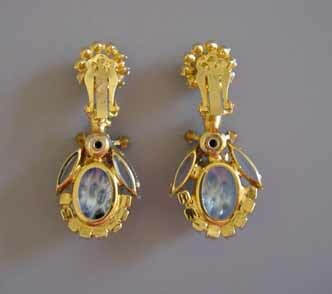 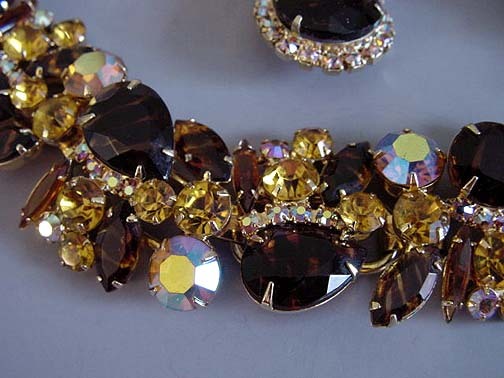 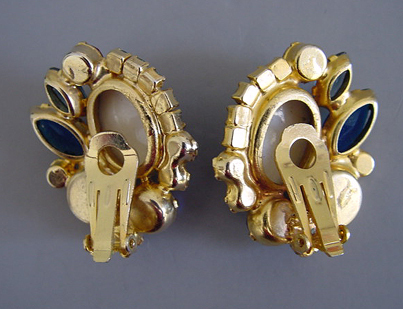 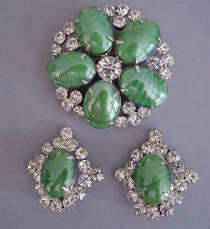 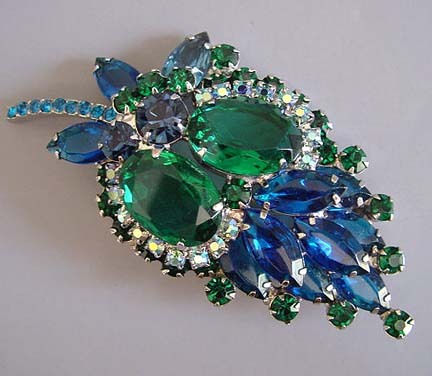 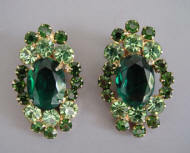 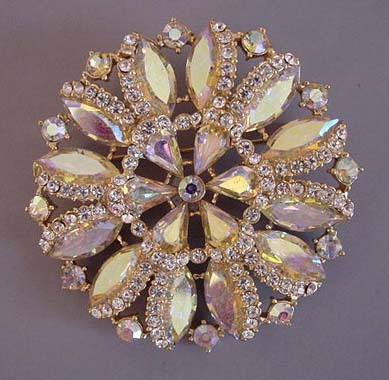 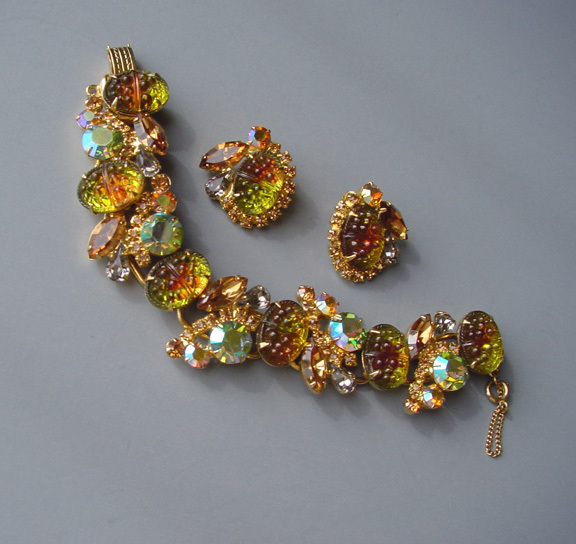 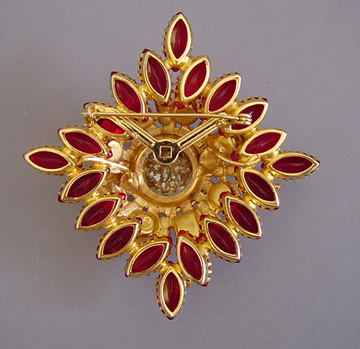 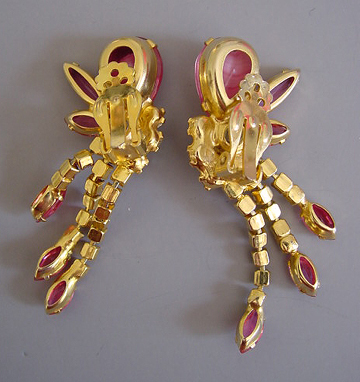 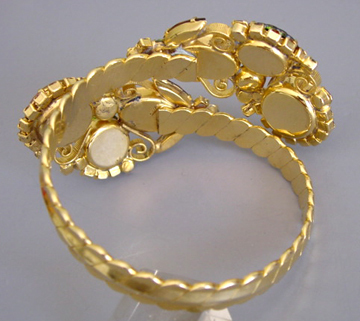 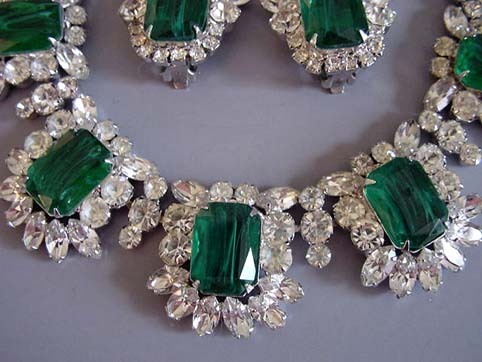 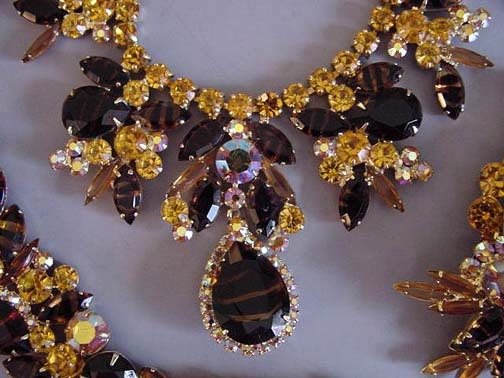 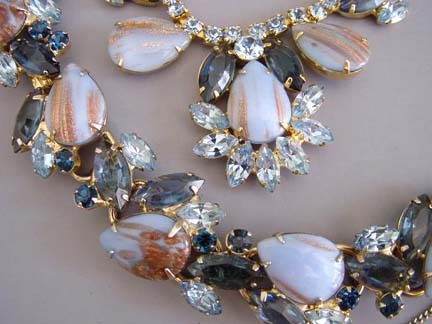 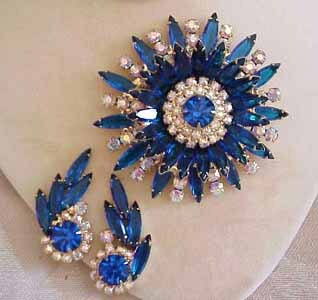 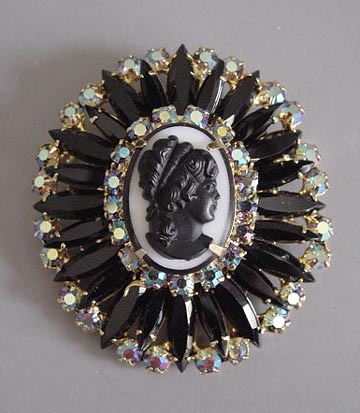 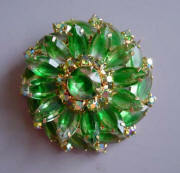 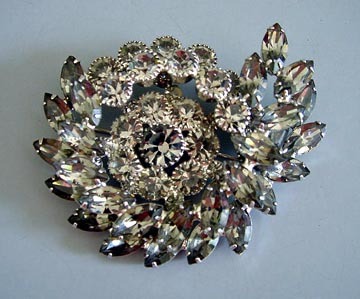 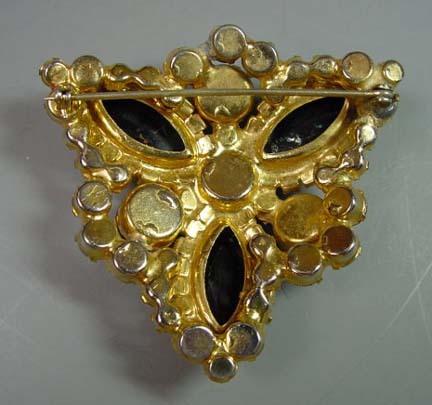 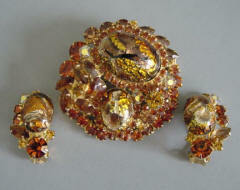 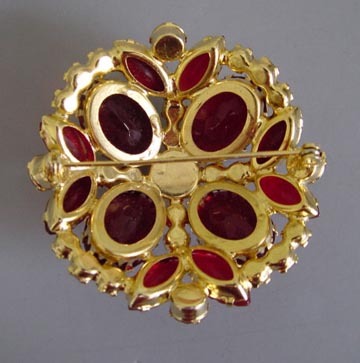 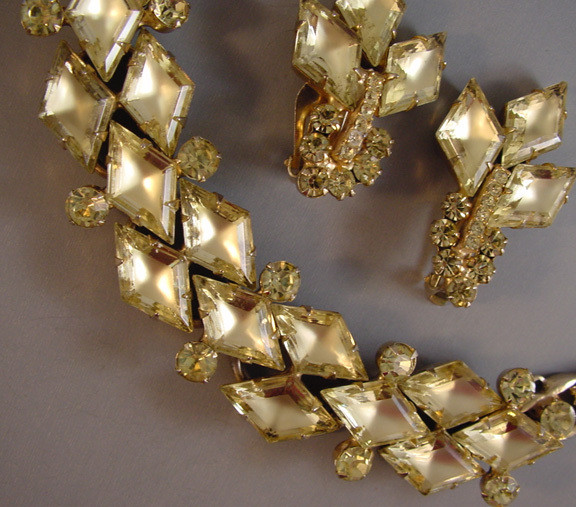 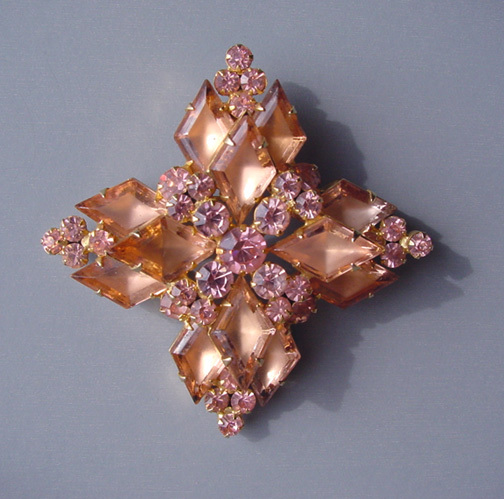 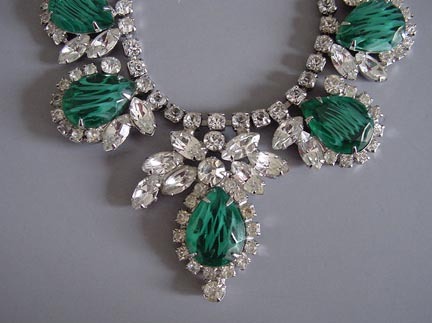 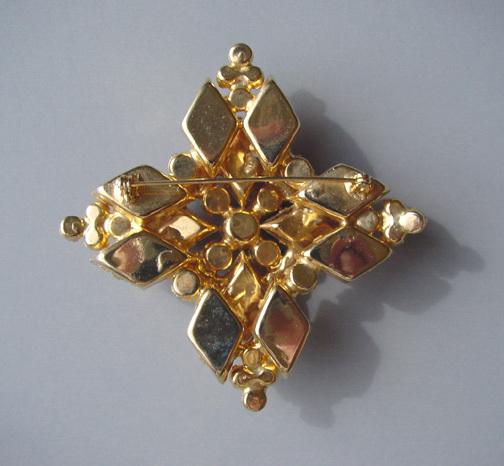 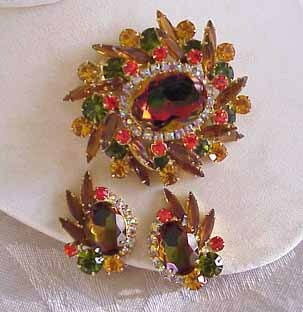 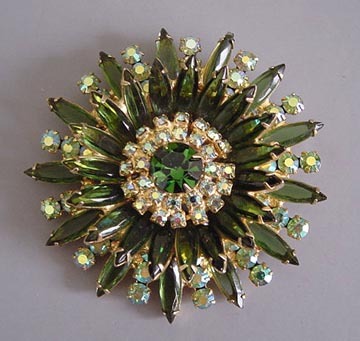 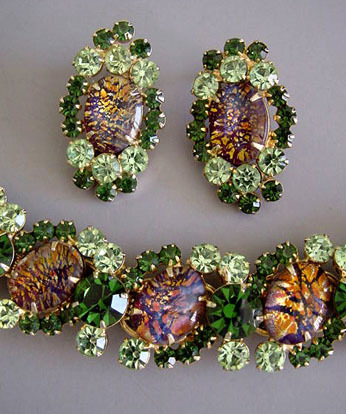 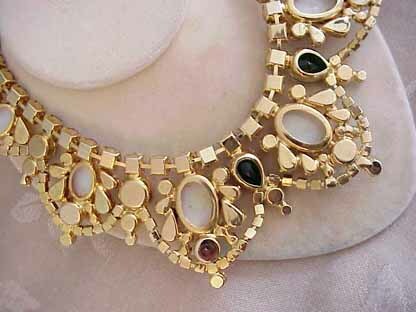 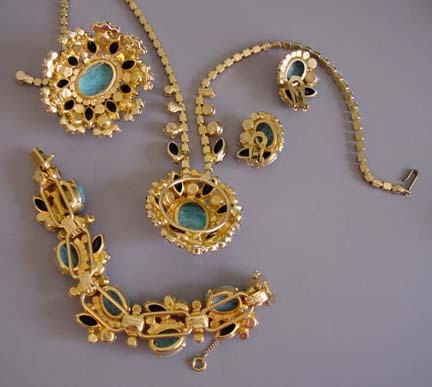 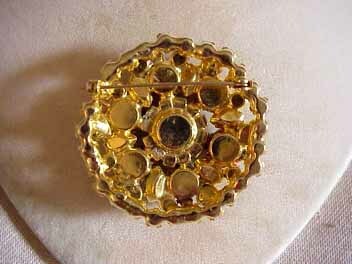 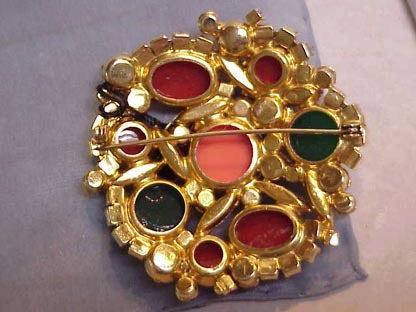 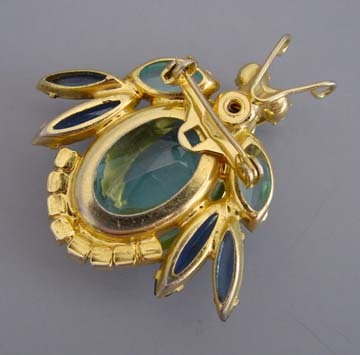 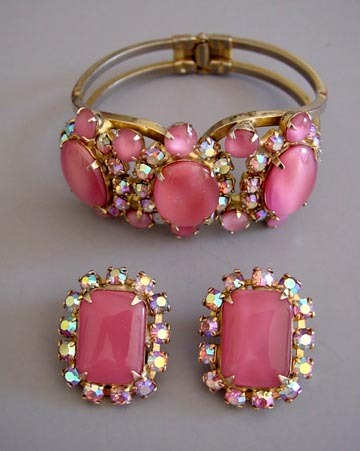 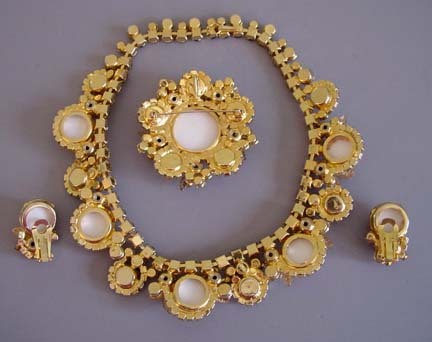 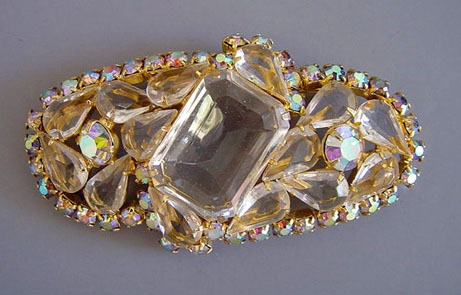 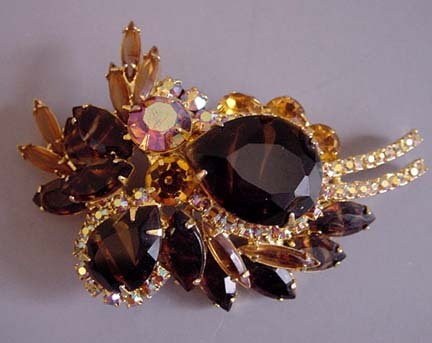 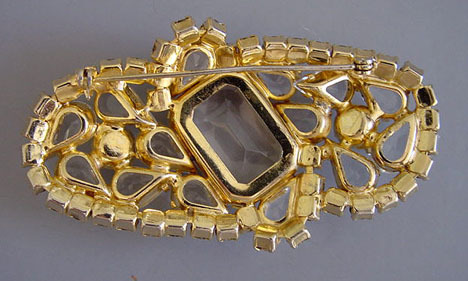 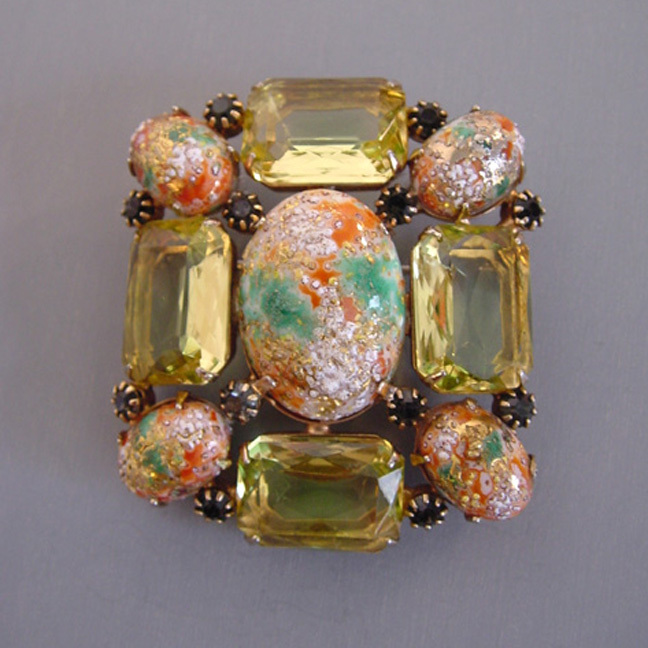 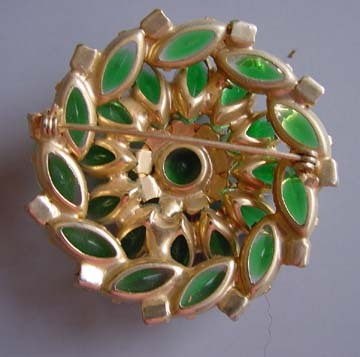 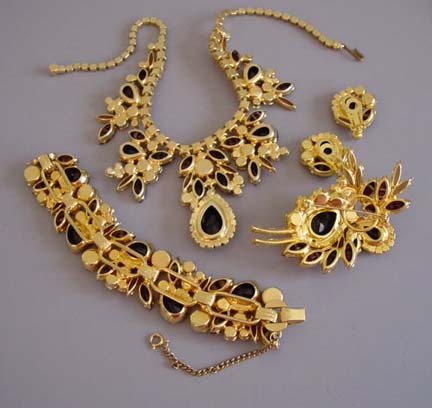 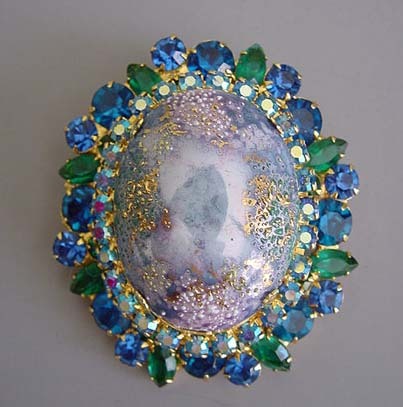 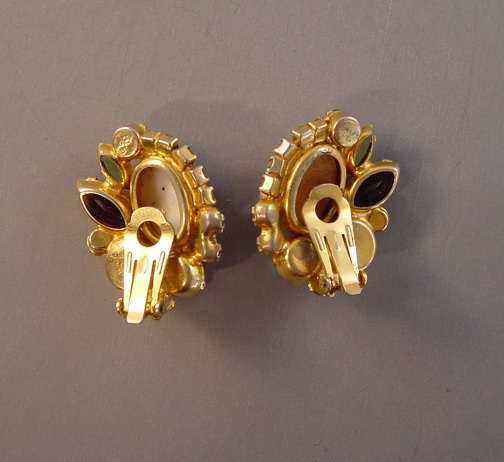 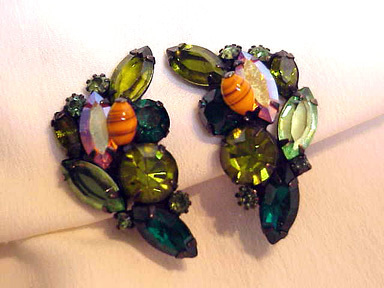 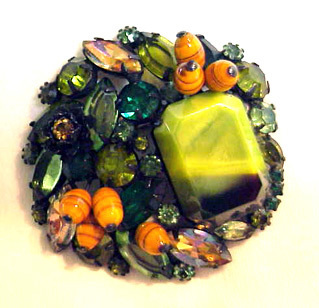 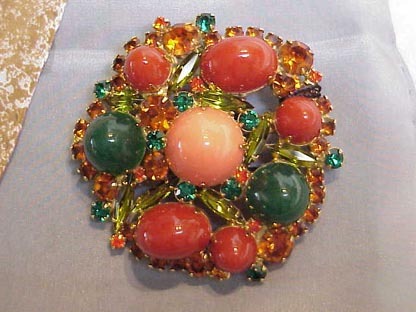 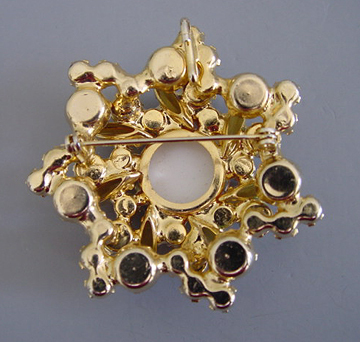 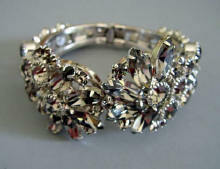 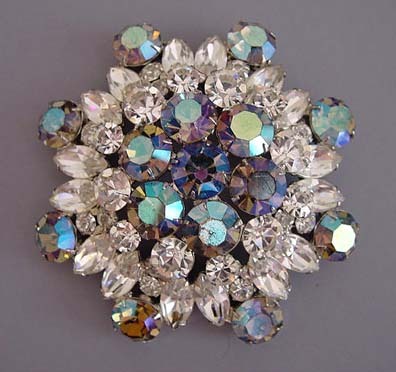 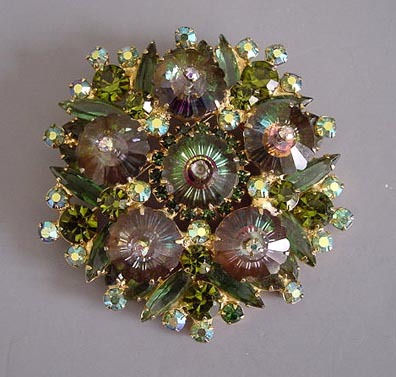 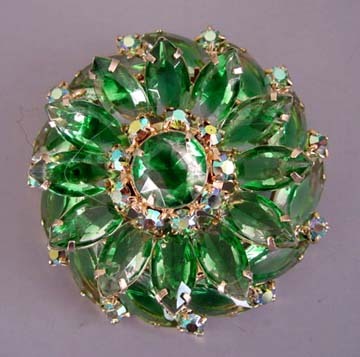 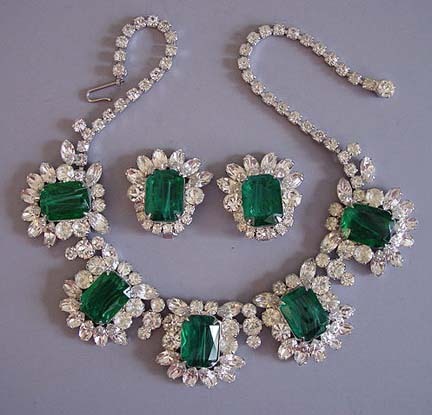 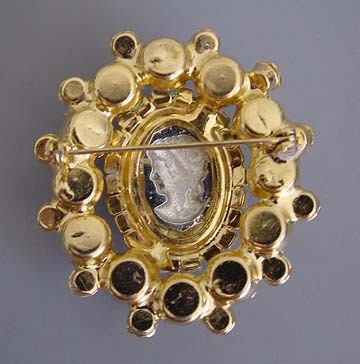 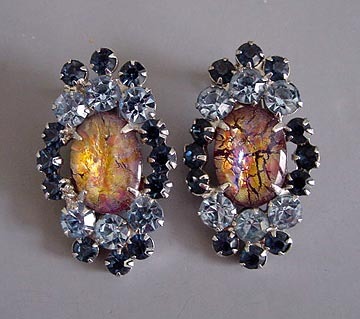 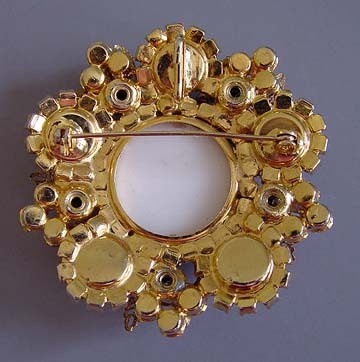 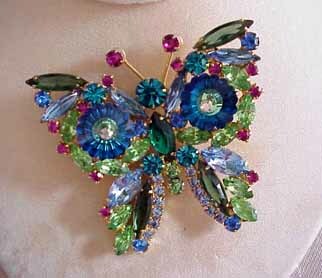 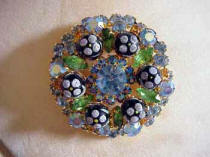 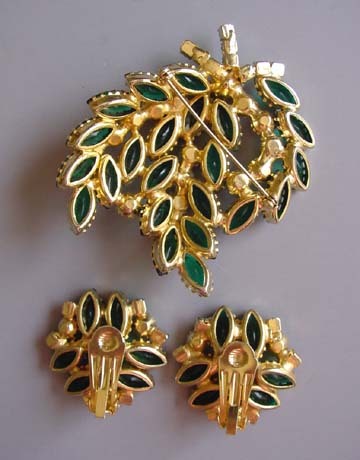 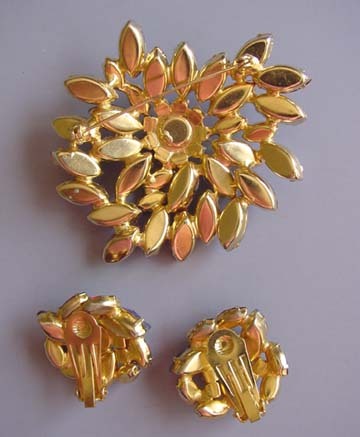 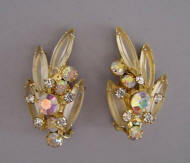 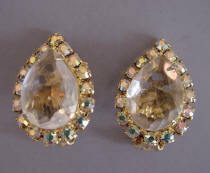 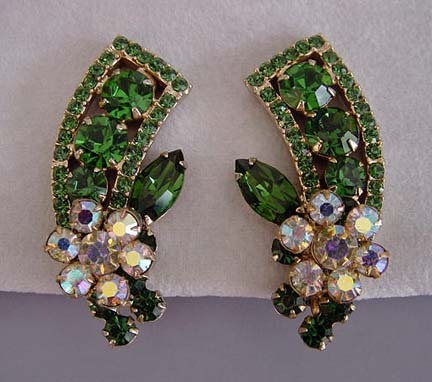 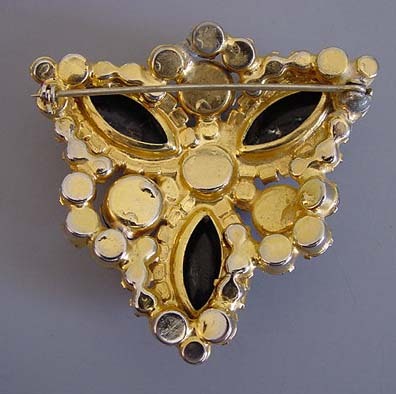 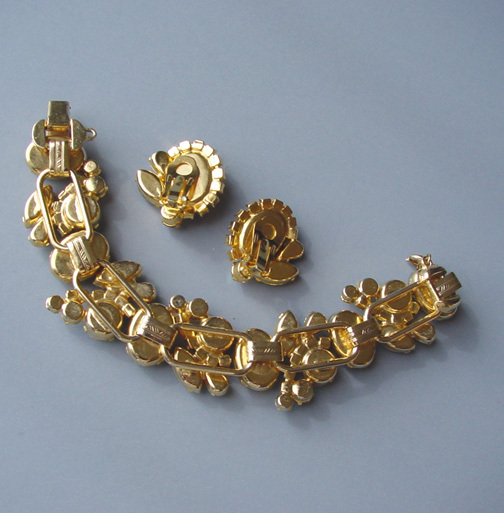 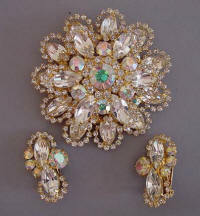 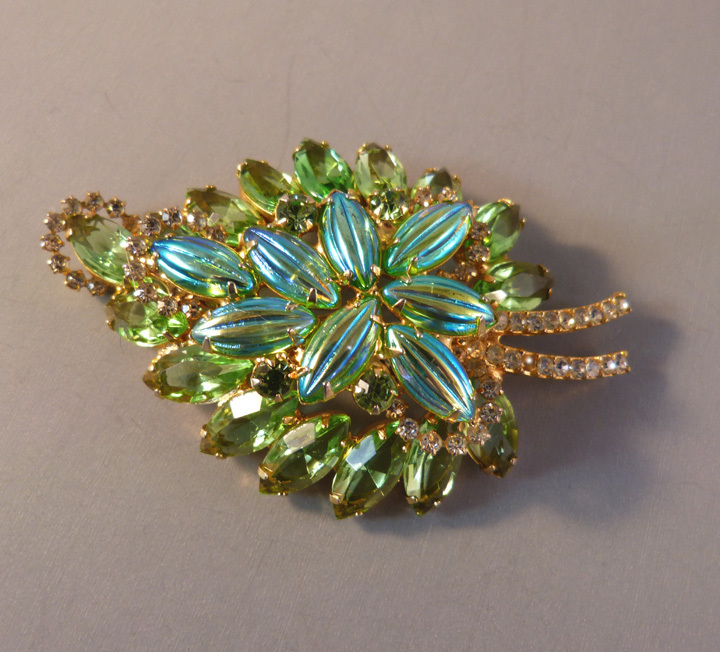 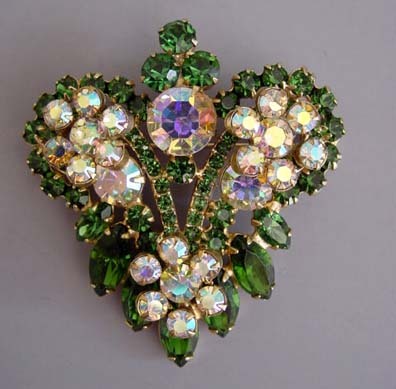 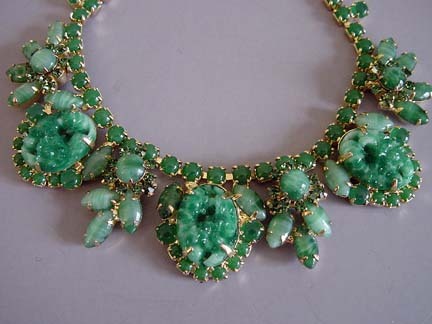 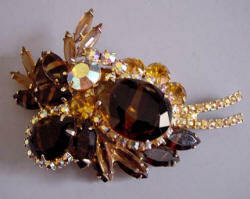 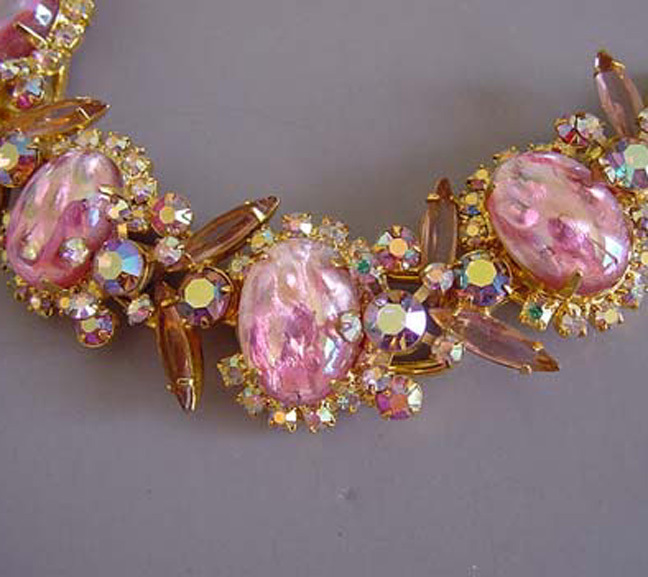 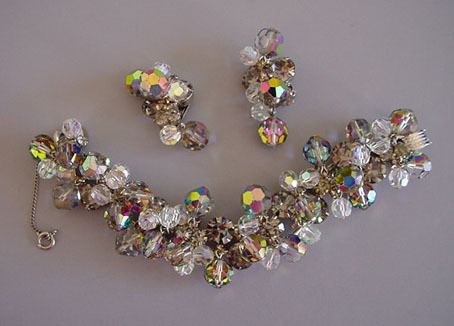 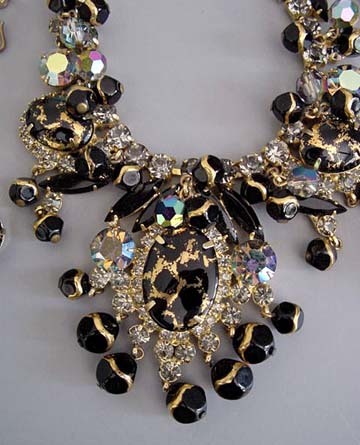 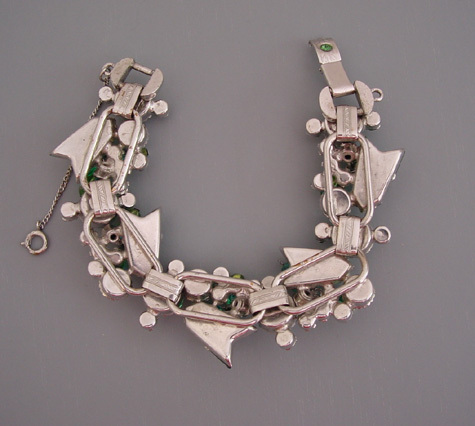 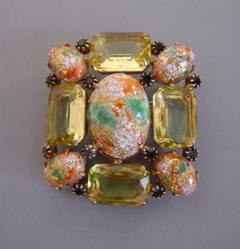 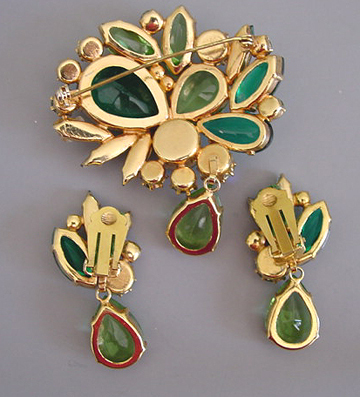 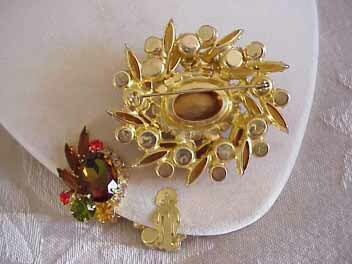 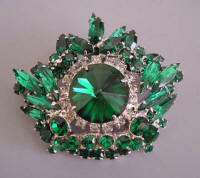 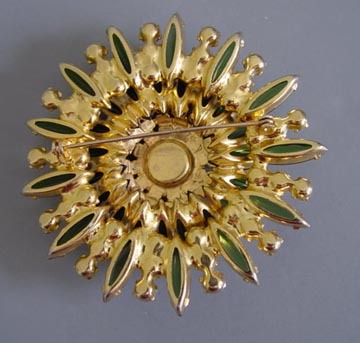 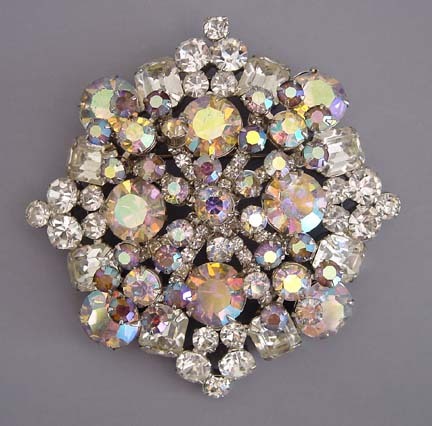 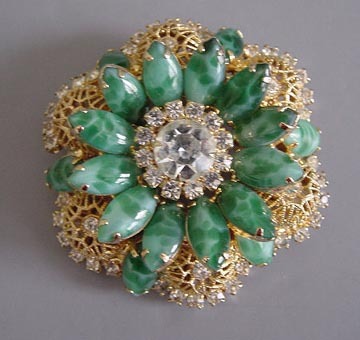 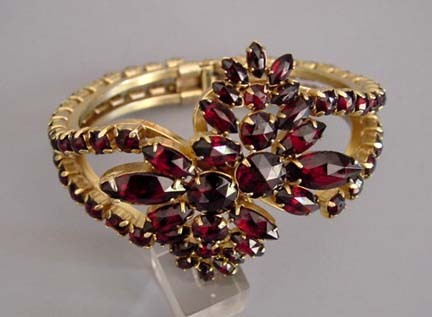 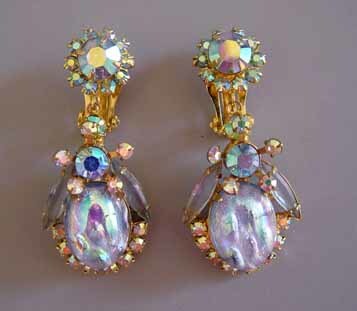 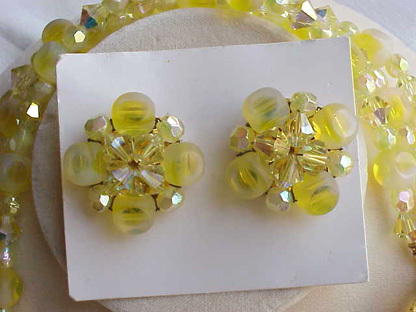 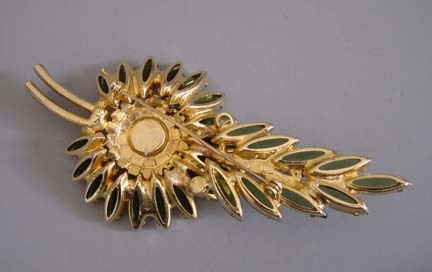 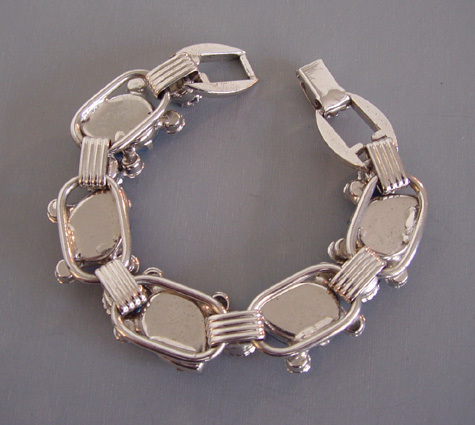 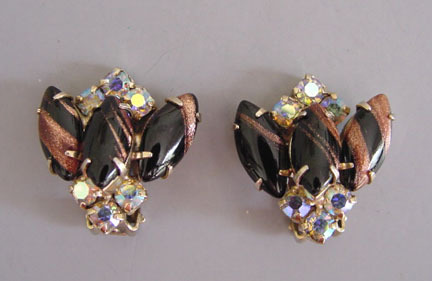 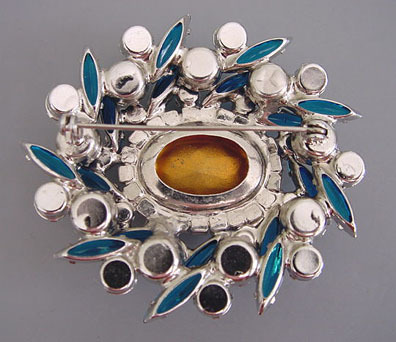 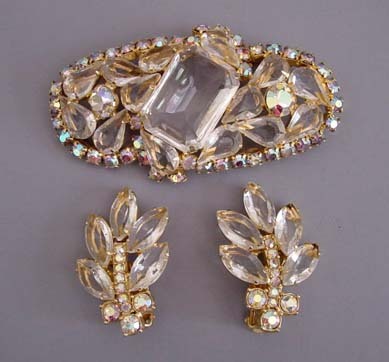 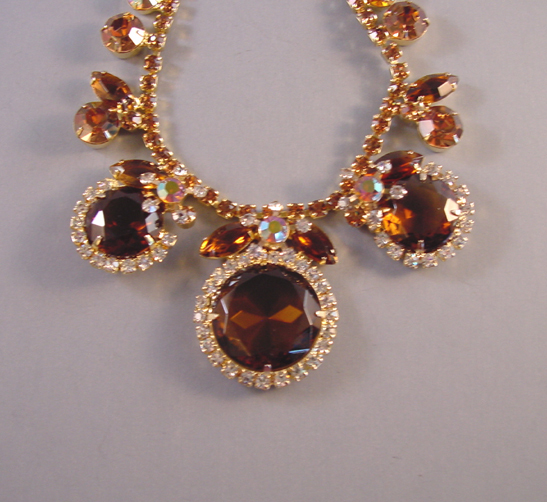 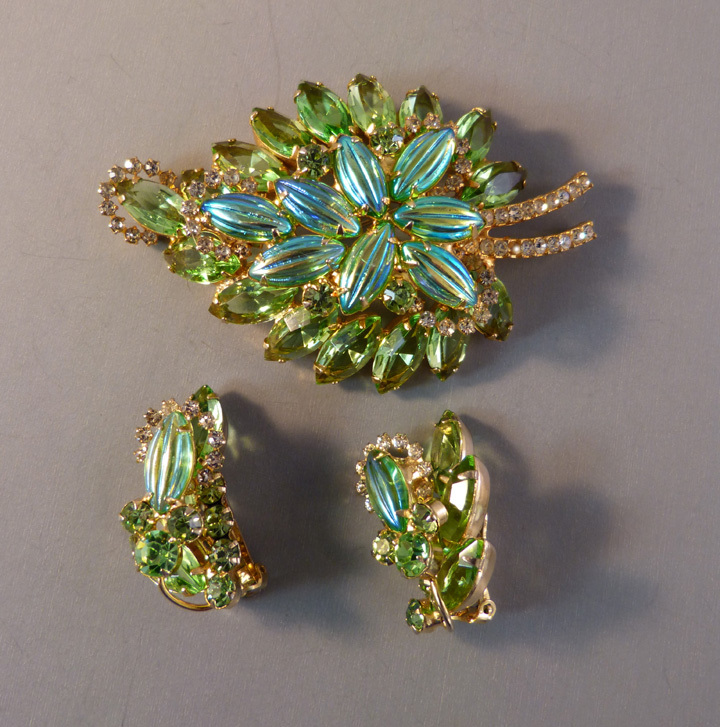 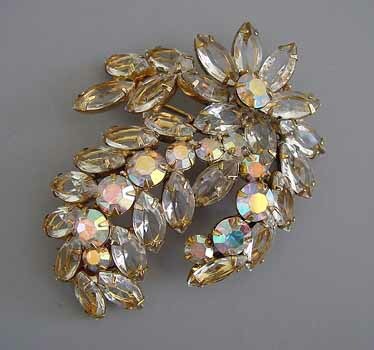 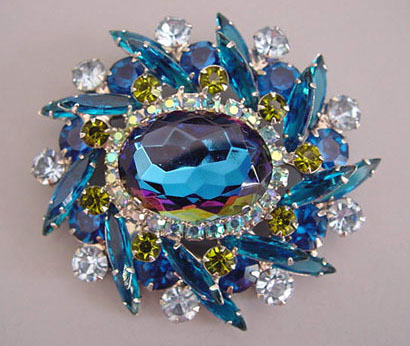 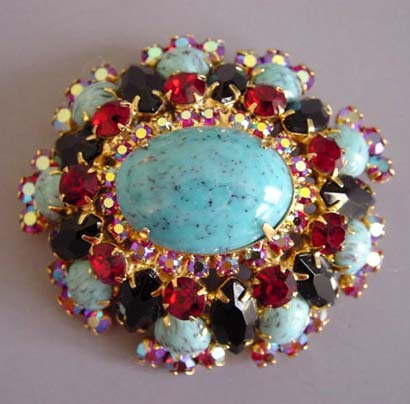 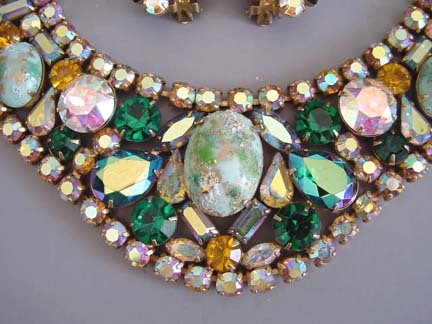 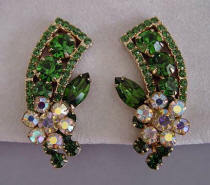 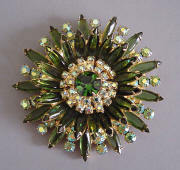 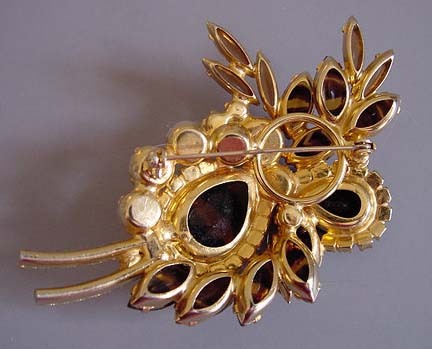 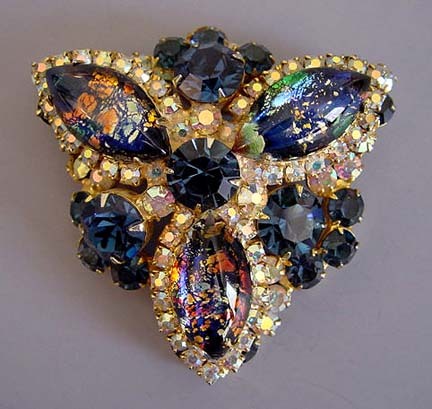 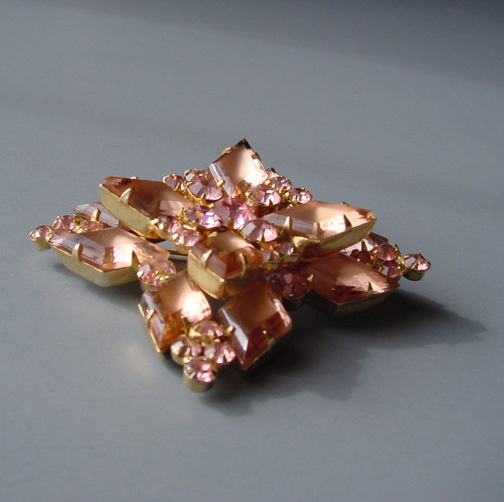 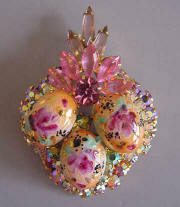 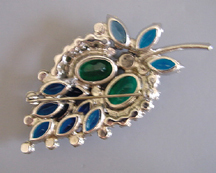 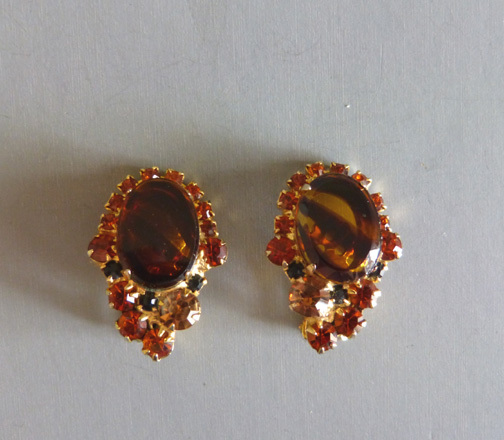 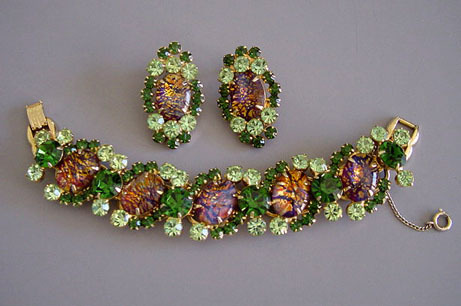 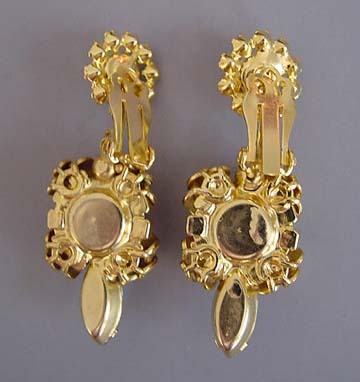 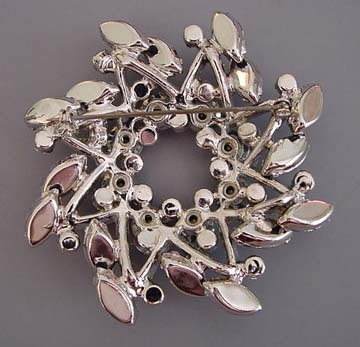 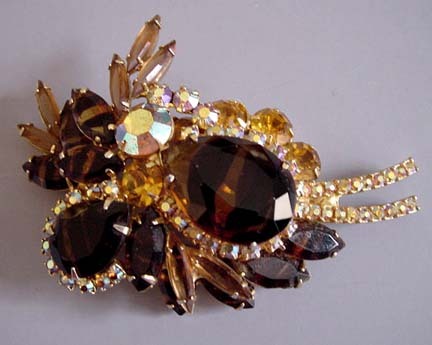 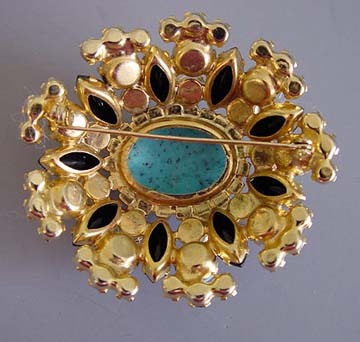 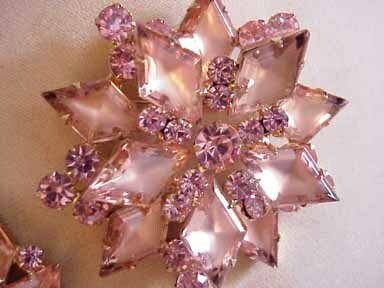 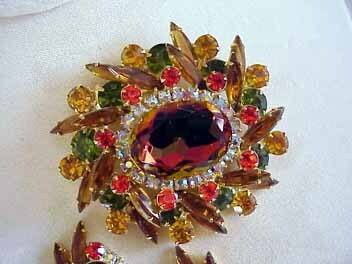 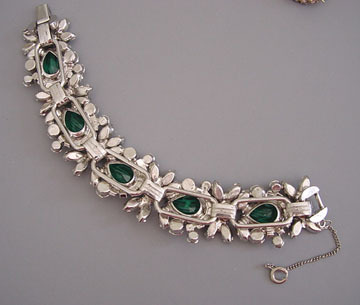 The term Juliana is used as descriptive of a certain look and style of jewelry. 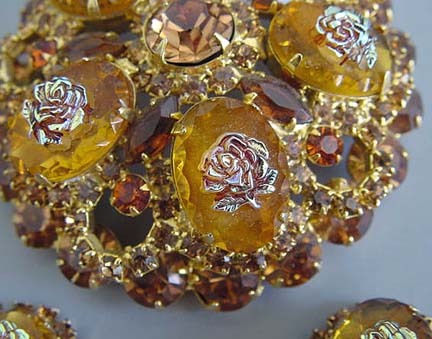 As Shakespear said, "A rose by any other name would smell as sweet", and this is one of the best roses in the costume jewelry garden. 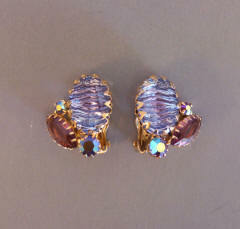 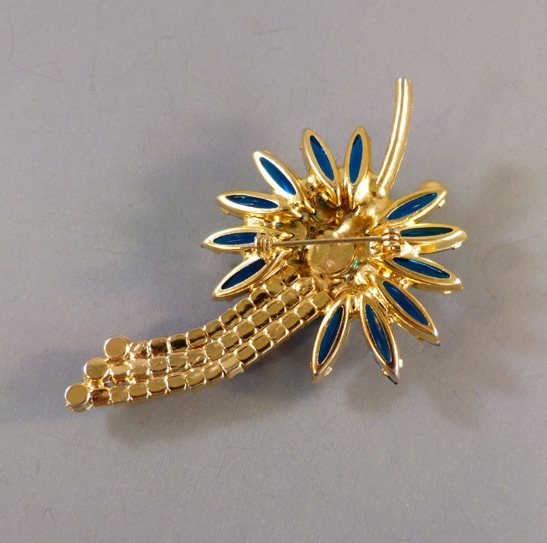 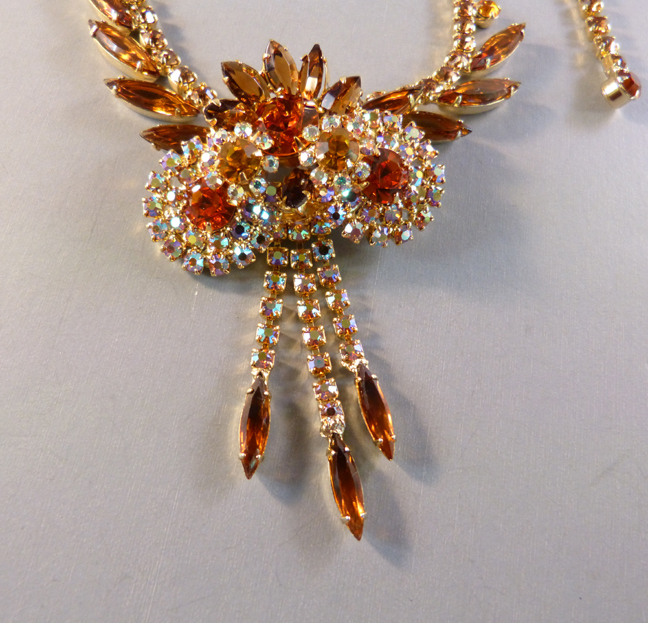 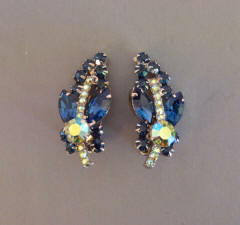 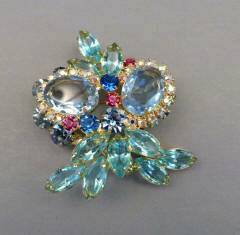 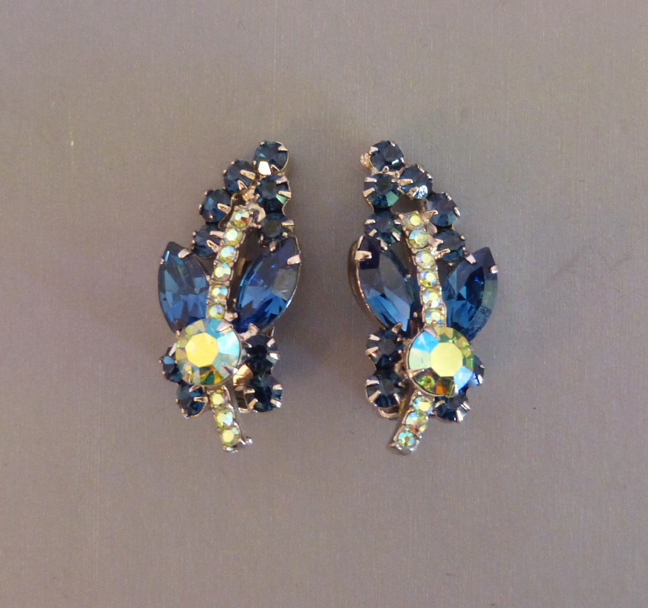 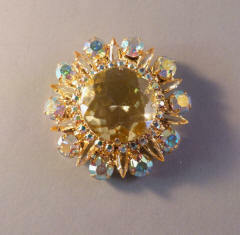 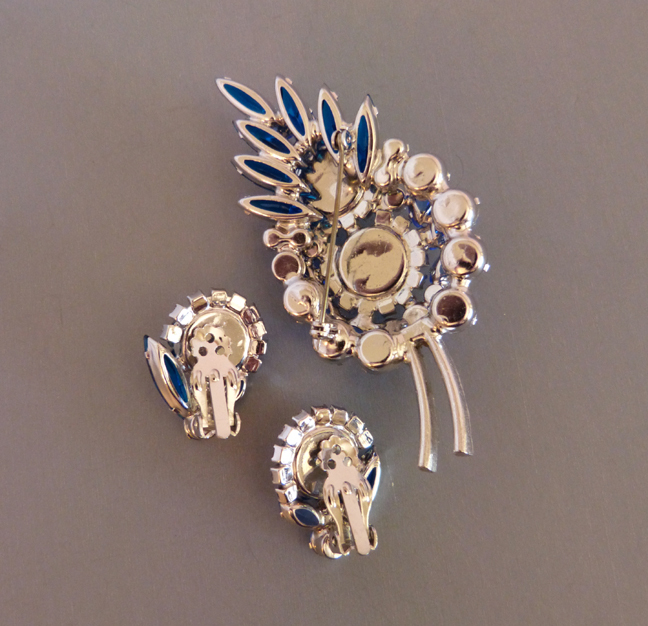 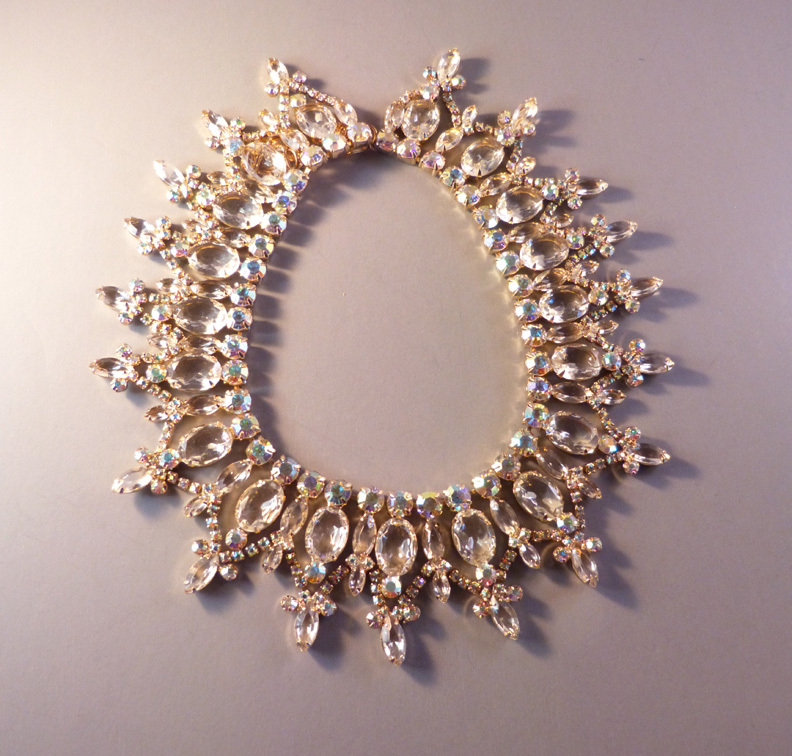 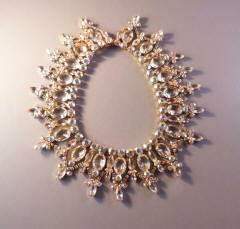 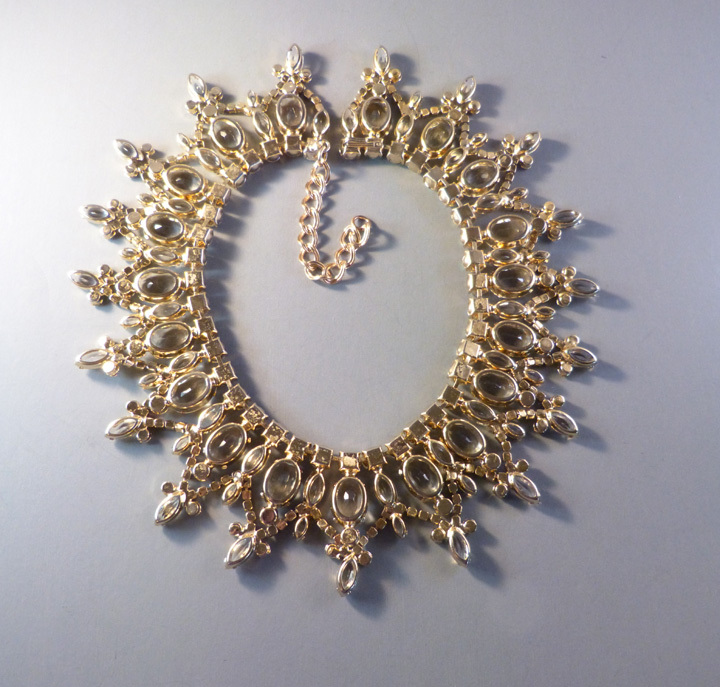 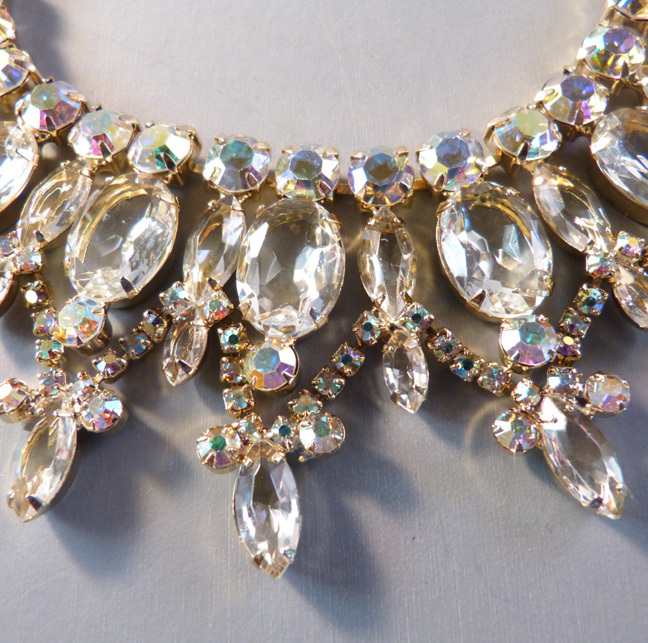 For more information on JULIANA Jewelry, see our article in JEWEL CHAT on line magazine. 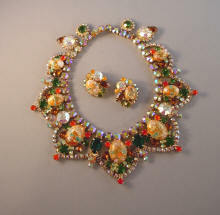 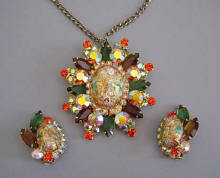 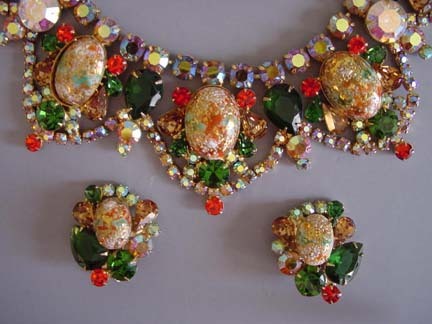 JULIANA style grand parure in speckled orange and green cabochons View View View View View Juliana style necklace and earrings with "Gloria" tag. 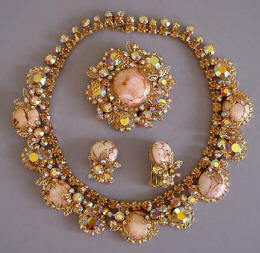 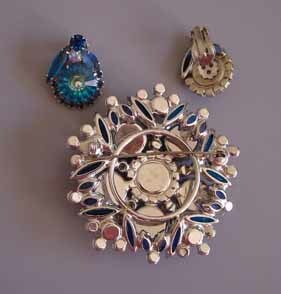 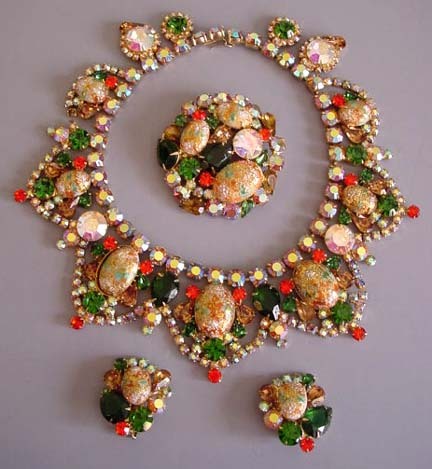 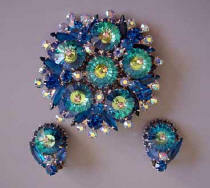 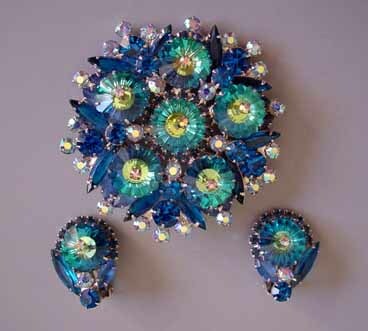 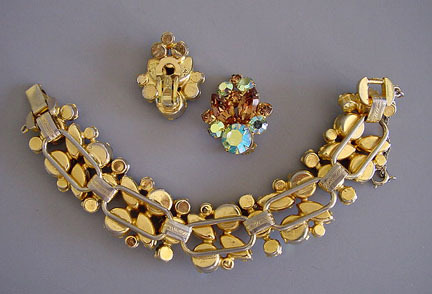 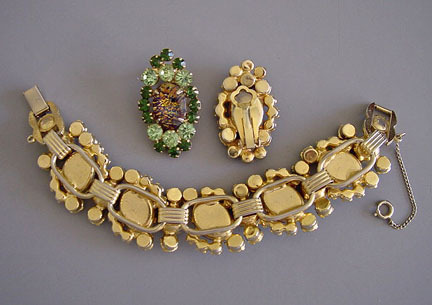 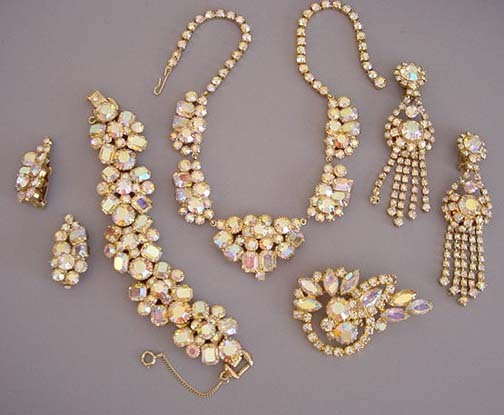 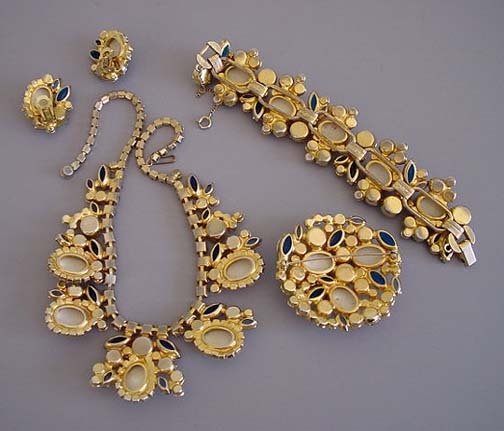 Necklace 14-1/2", round brooch 2-1/2", oval brooch 2-1/4" by 2", round earrings on card 1-1/3", oval earrings 1-1/4", circa 1960. 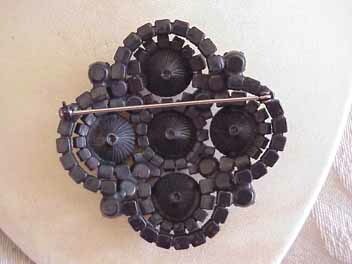 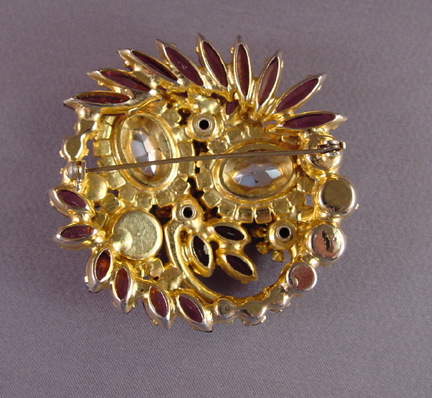 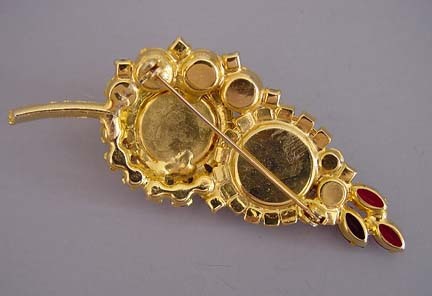 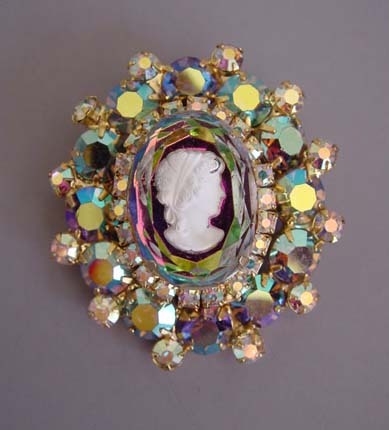 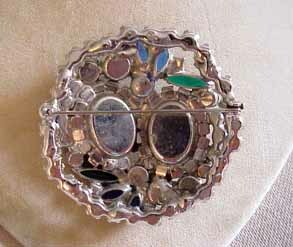 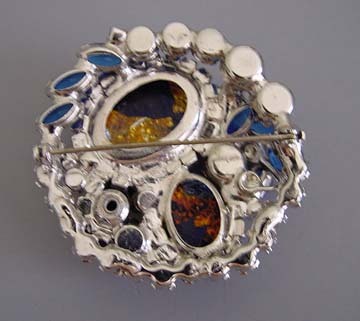 This is the same piece seen in Christie Romero's "Warman's Jewelry", 3rd Ed, page 209. 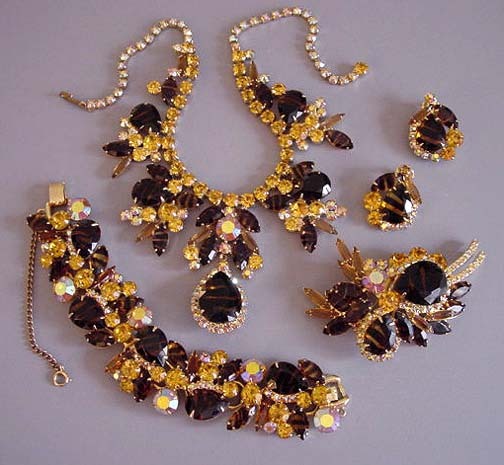 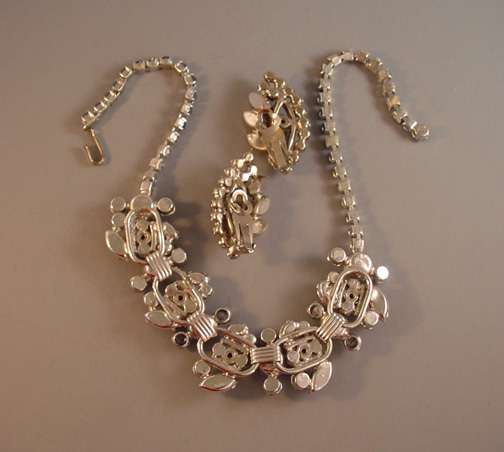 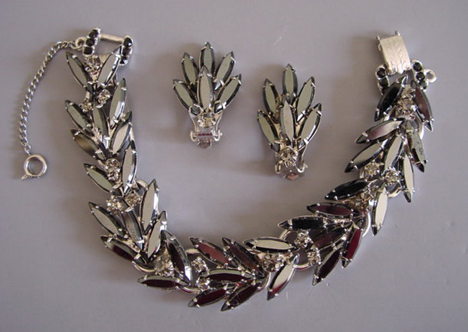 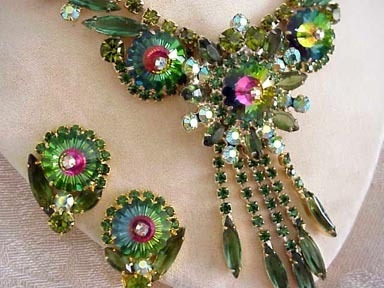 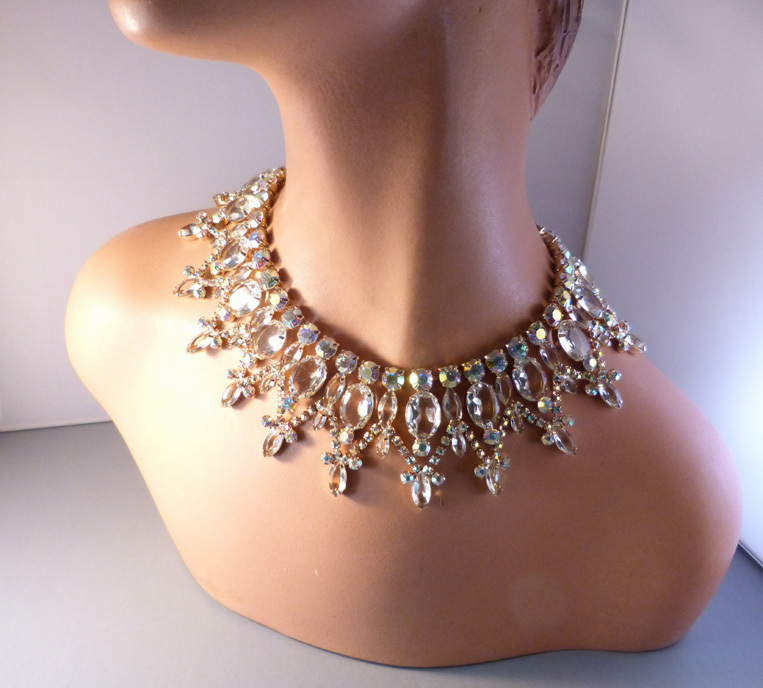 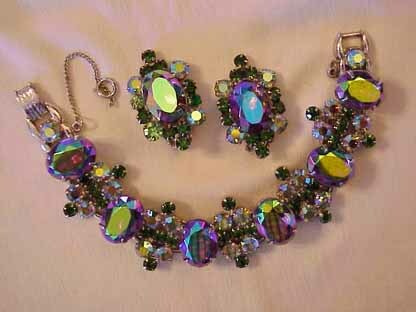 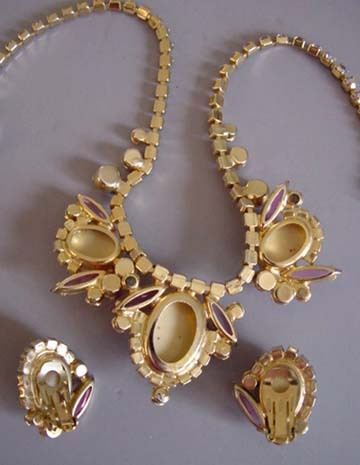 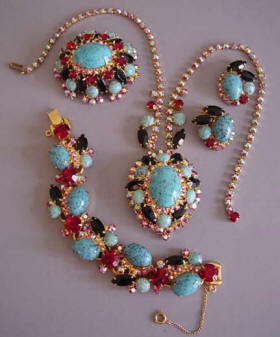 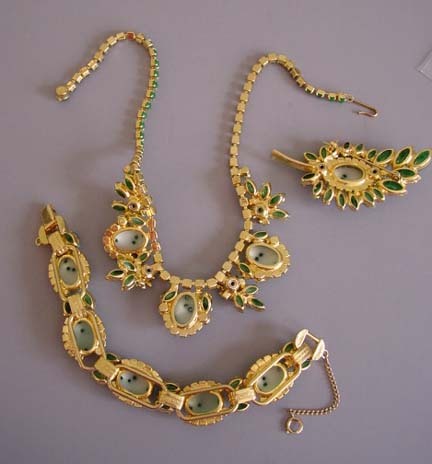 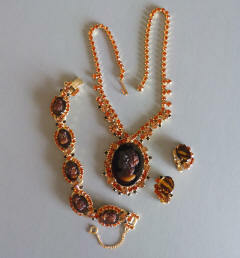 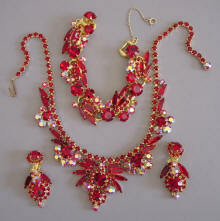 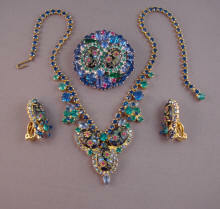 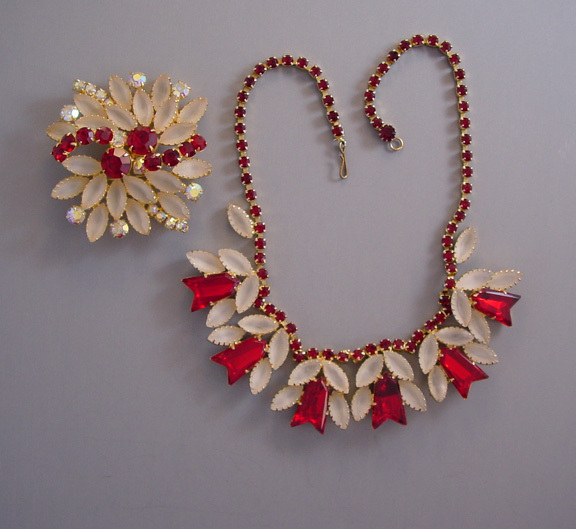 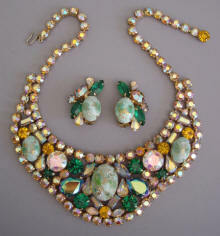 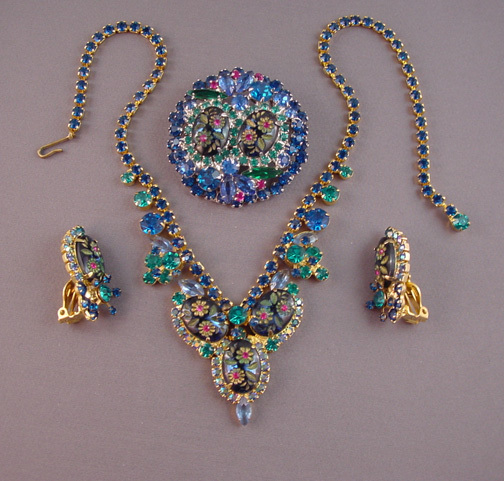 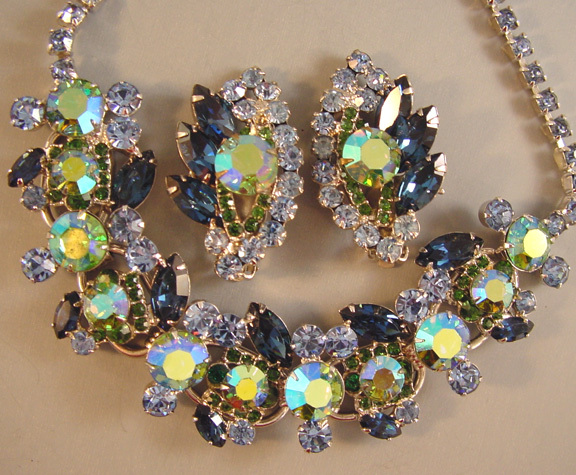 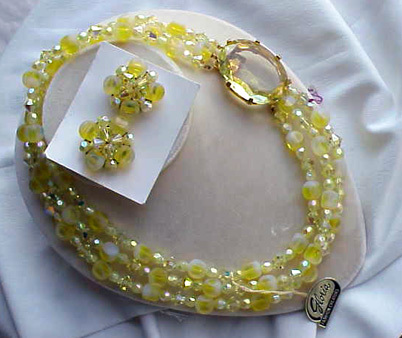 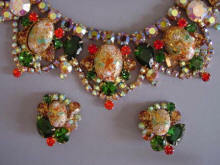 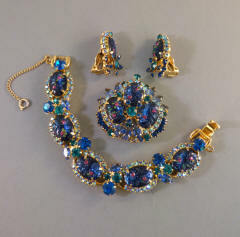 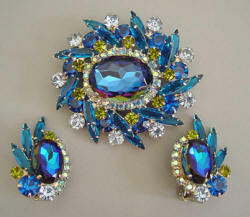 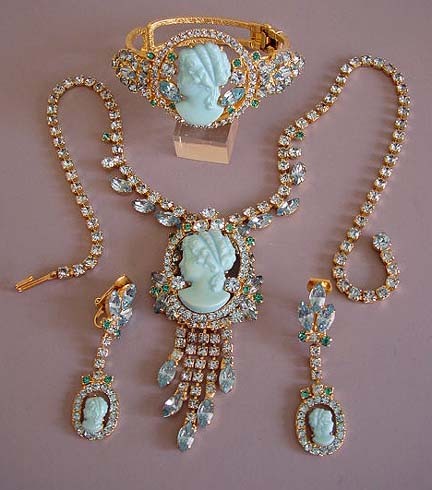 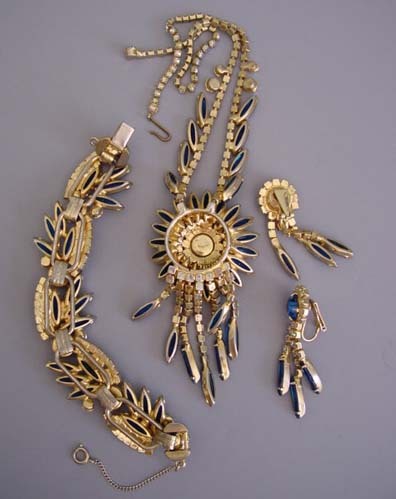 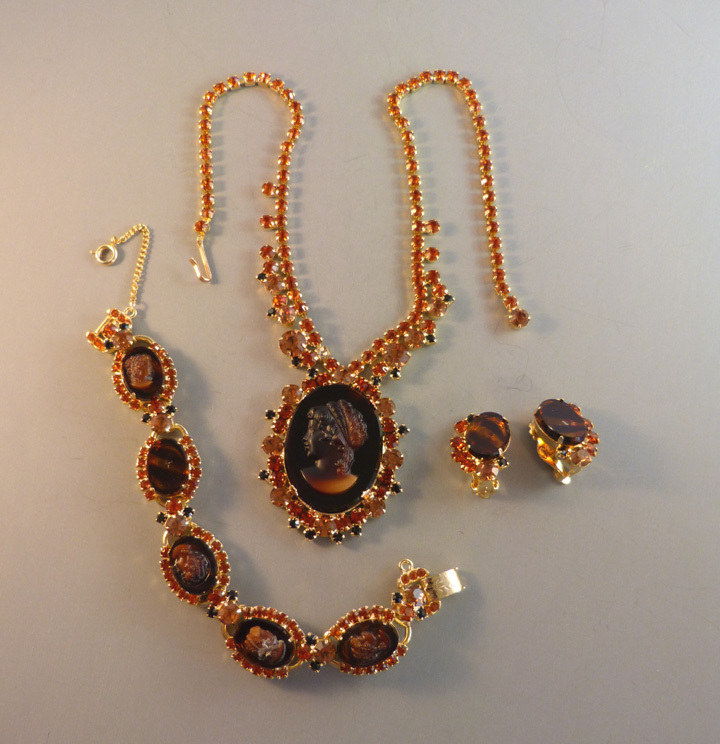 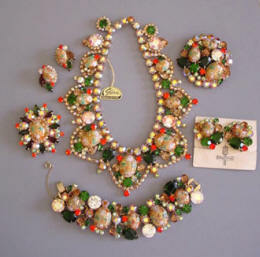 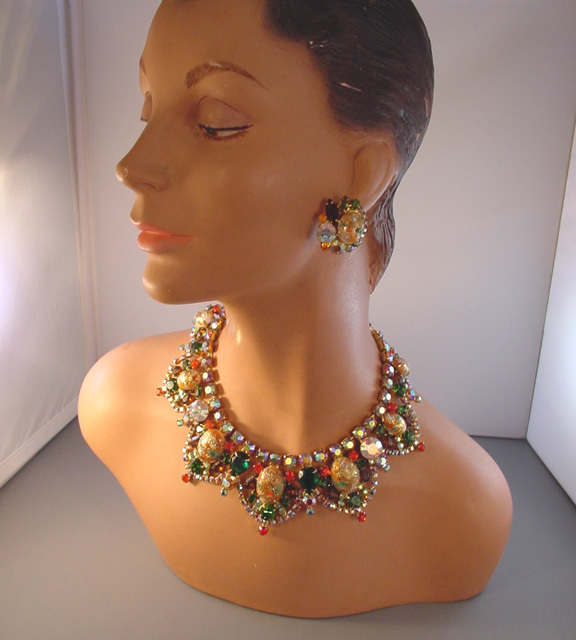 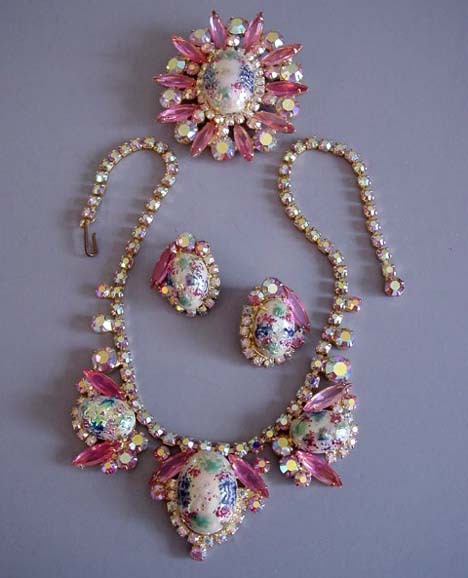 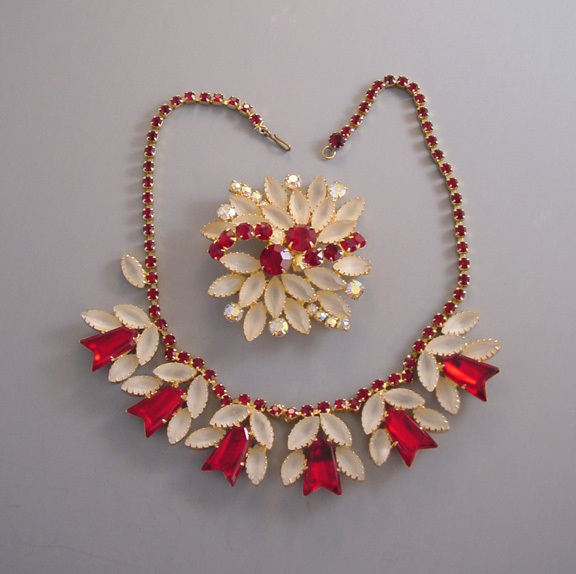 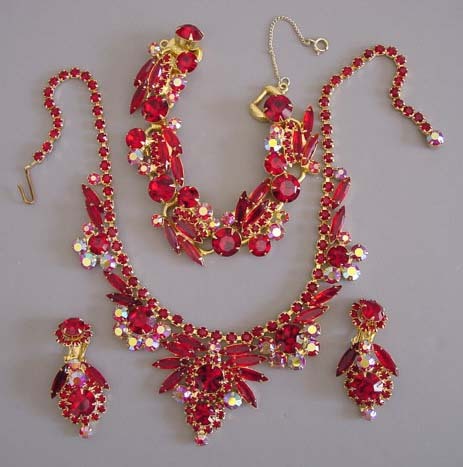 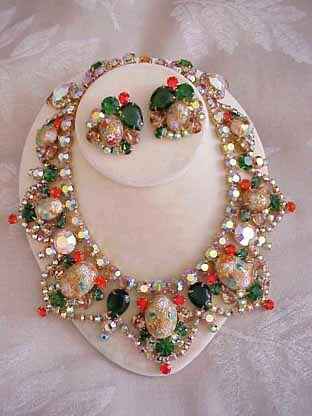 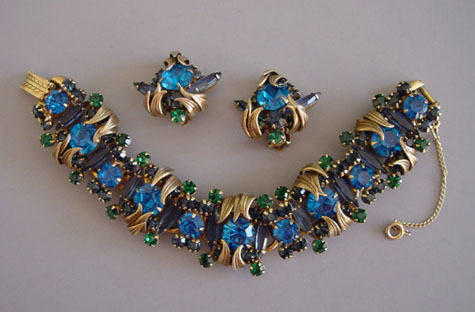 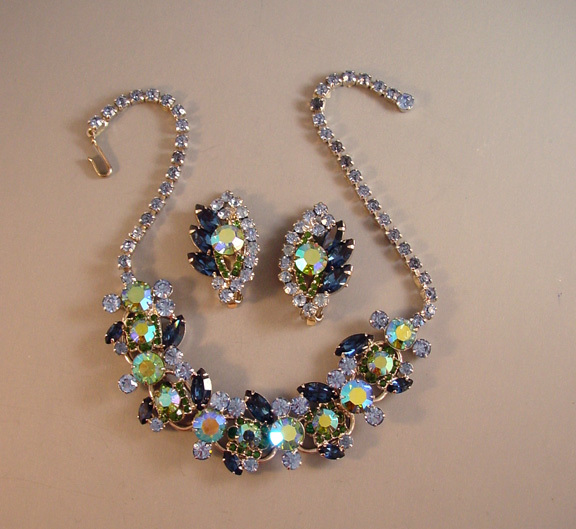 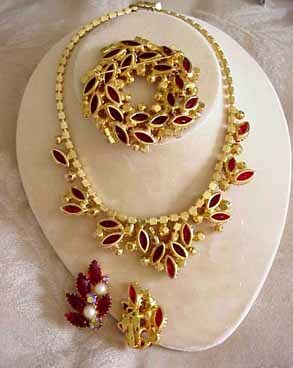 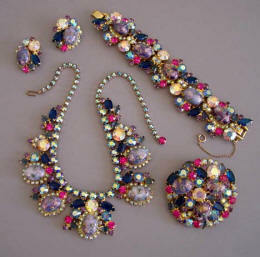 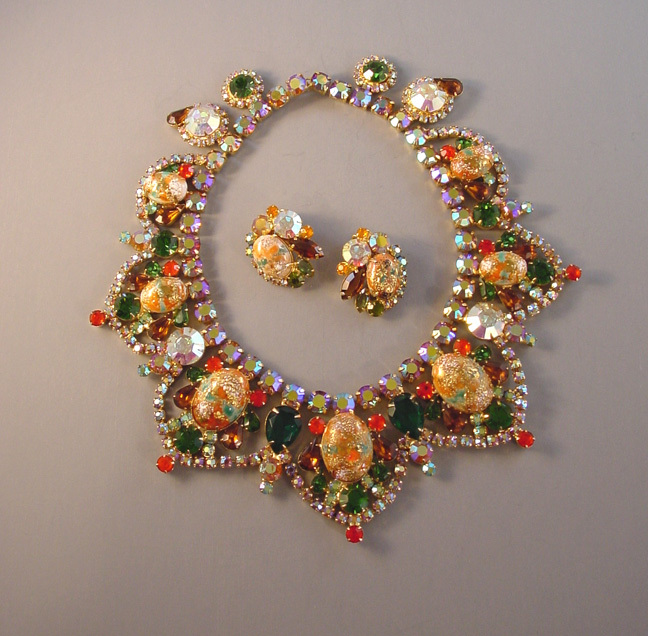 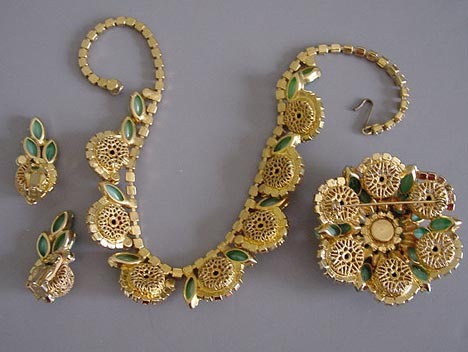 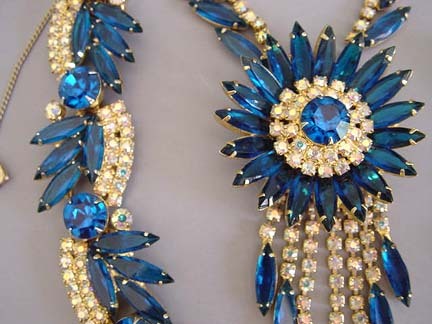 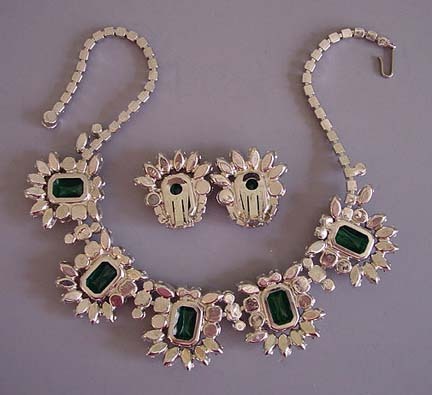 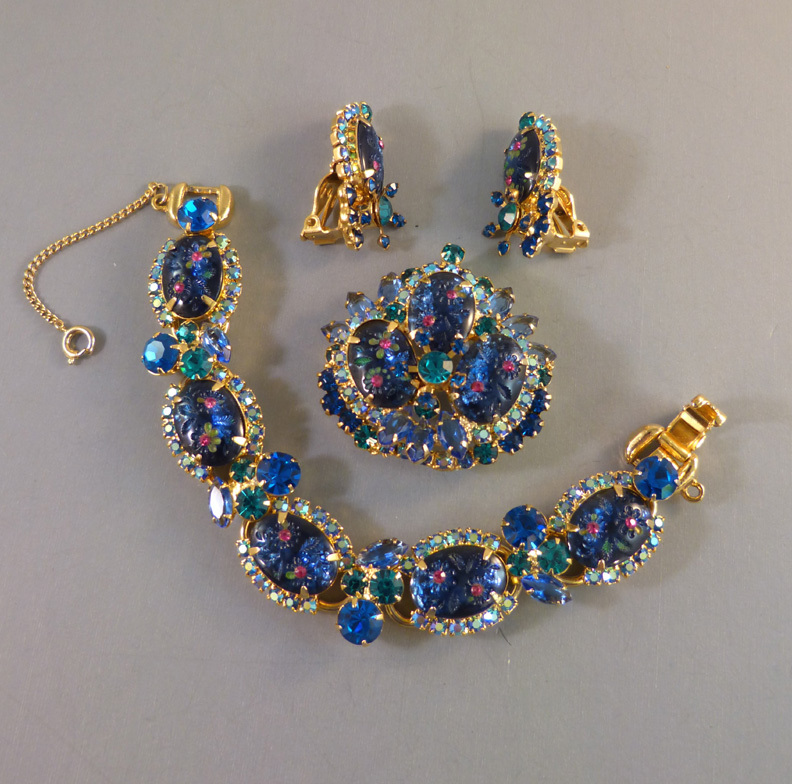 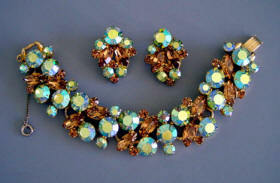 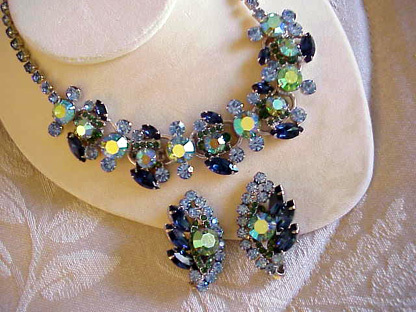 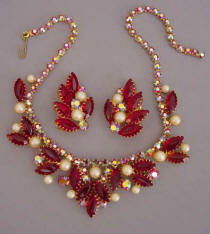 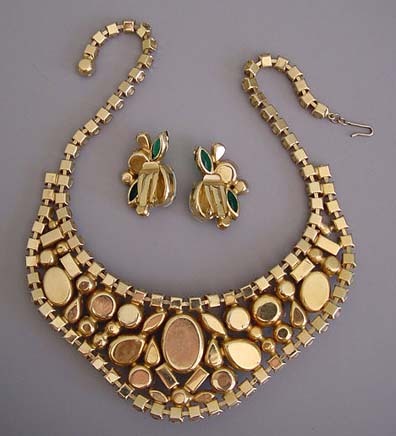 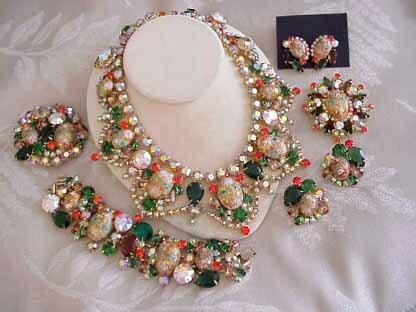 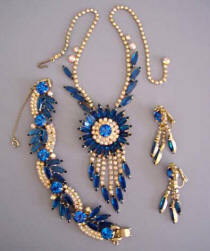 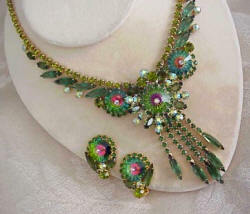 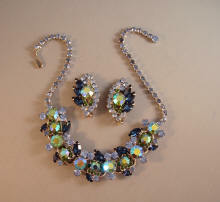 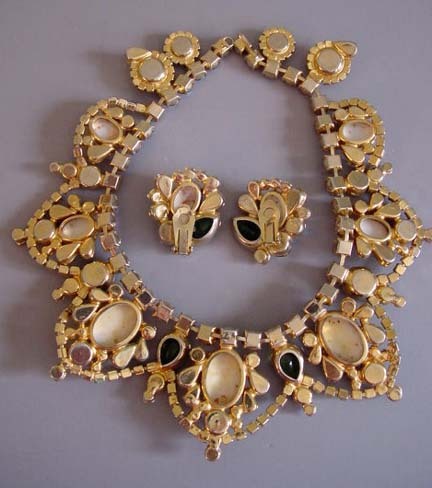 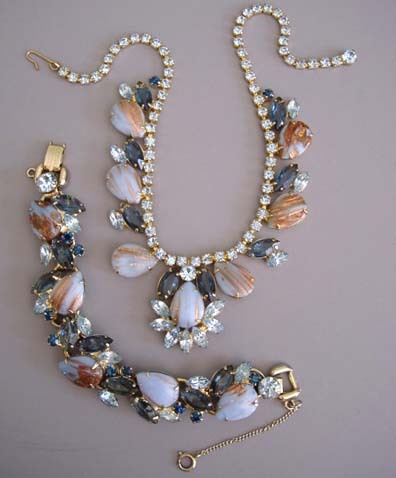 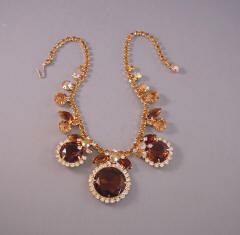 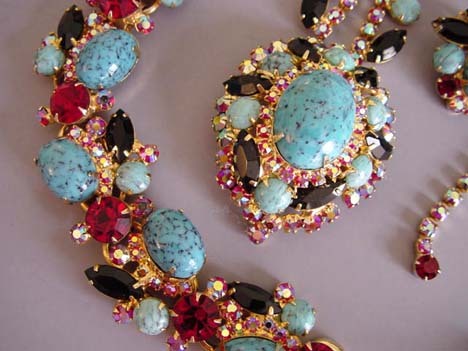 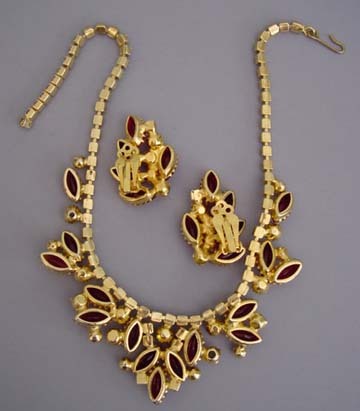 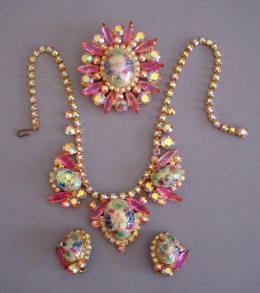 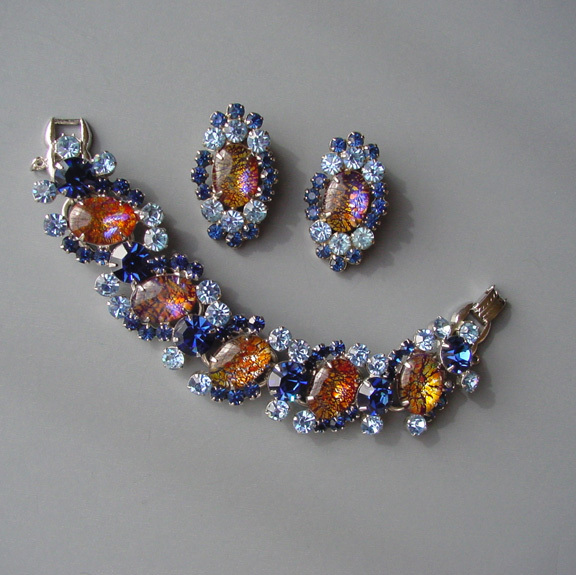 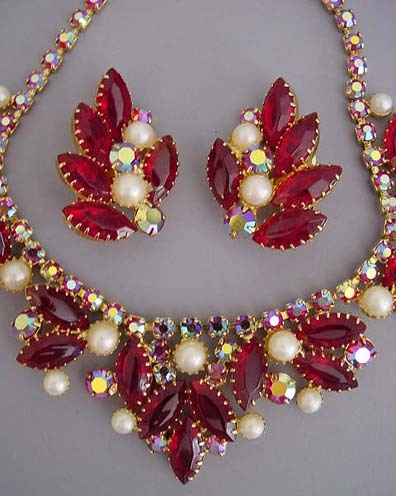 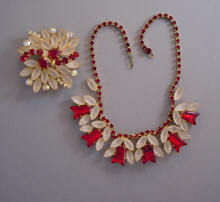 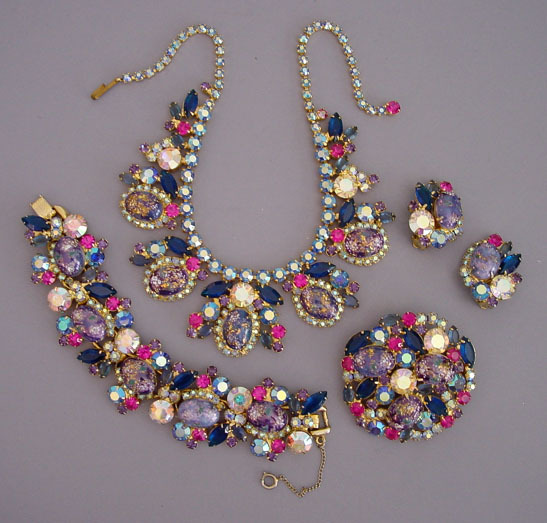 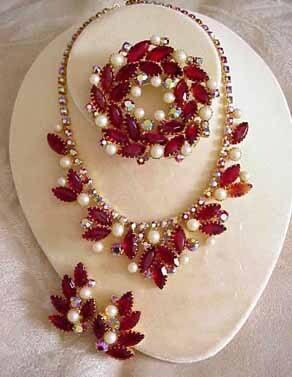 View JULIANA style grand parure, necklace and earrings with GLORIA tags. 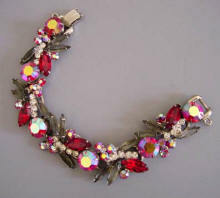 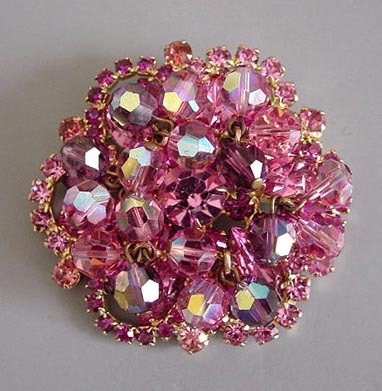 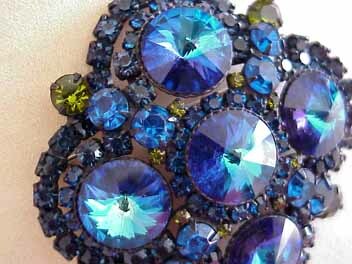 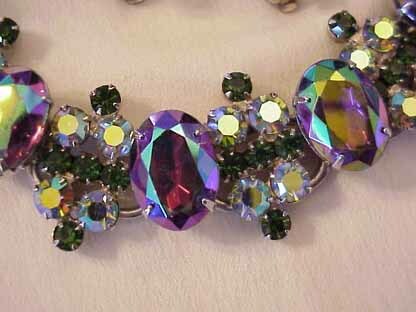 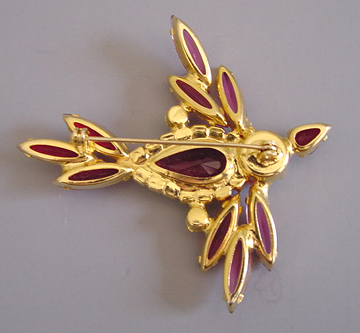 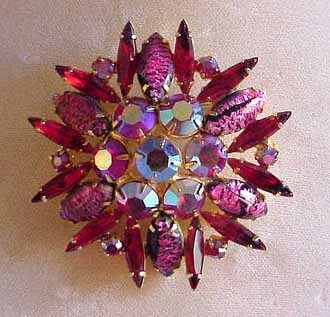 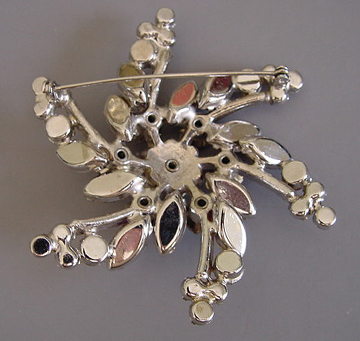 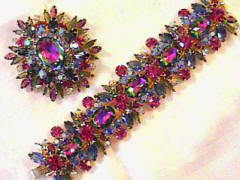 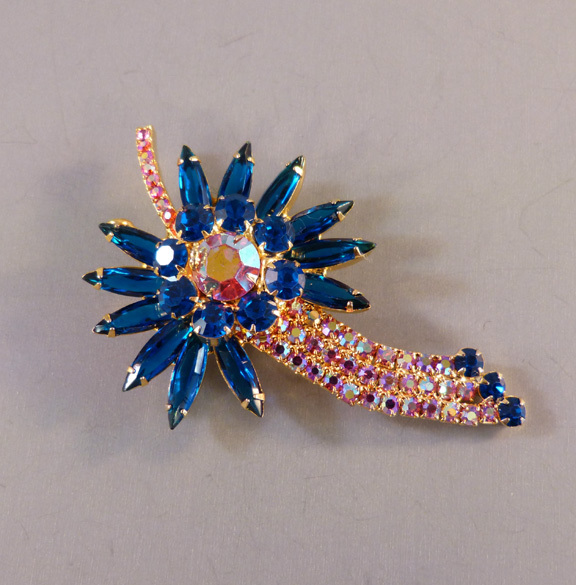 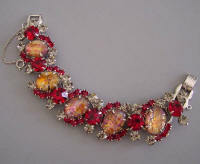 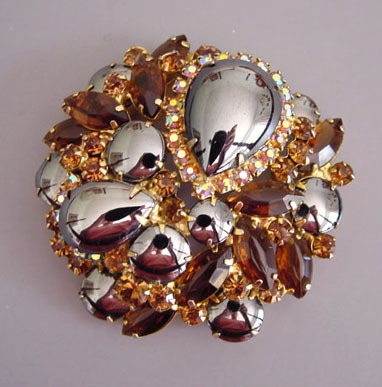 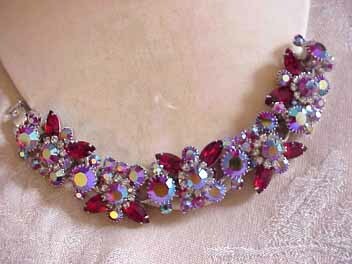 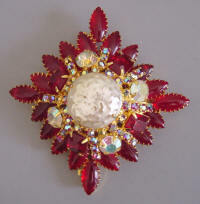 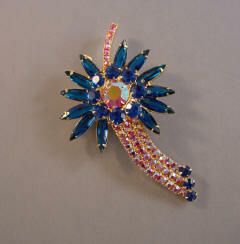 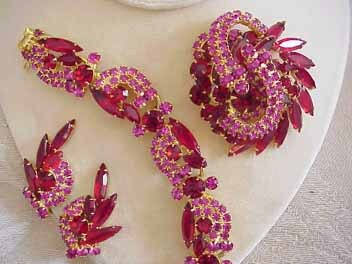 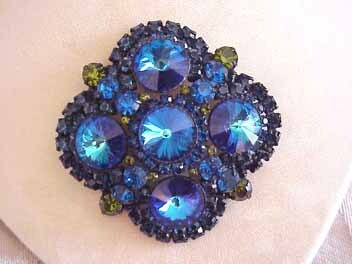 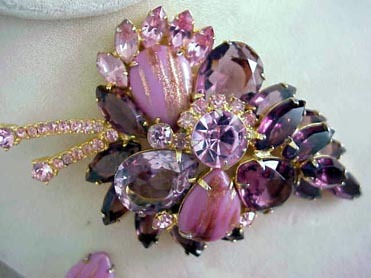 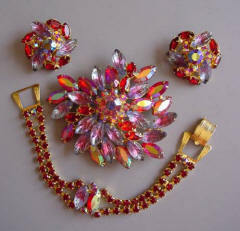 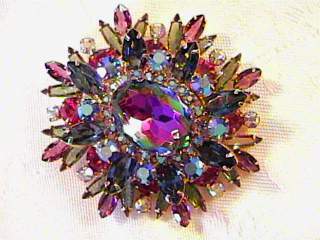 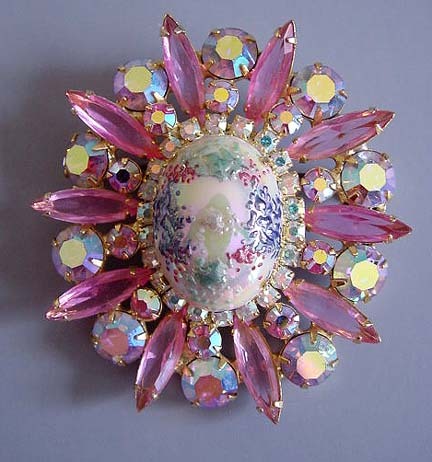 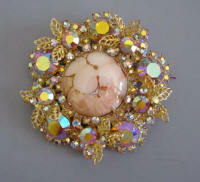 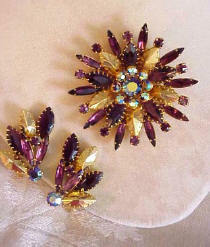 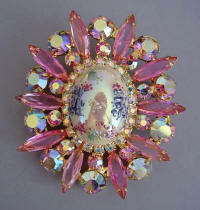 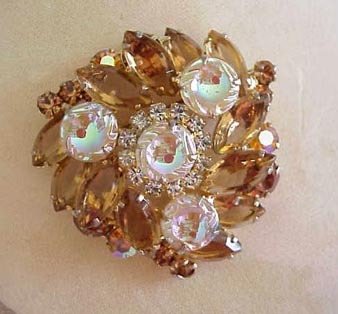 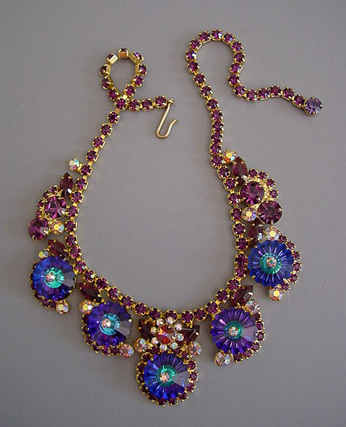 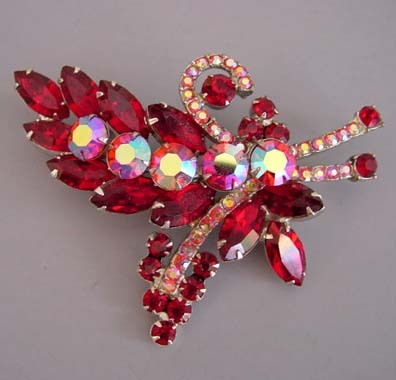 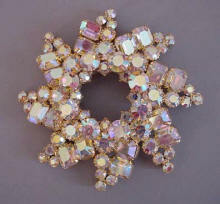 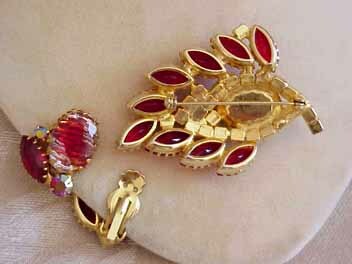 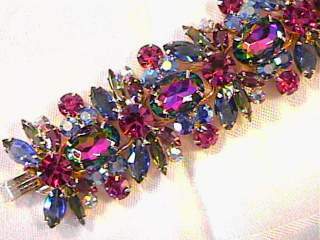 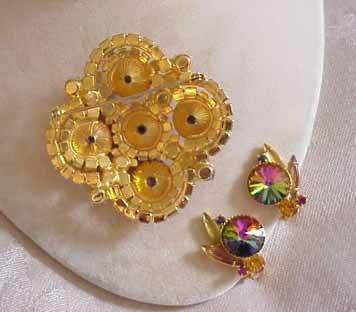 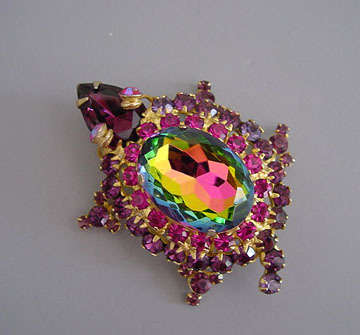 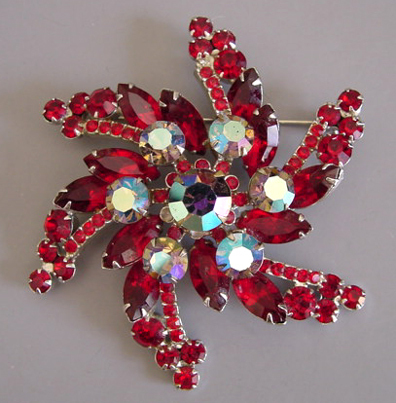 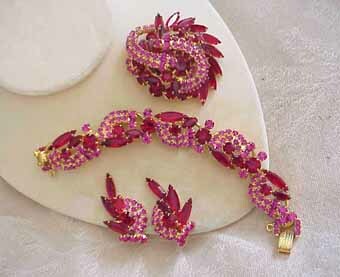 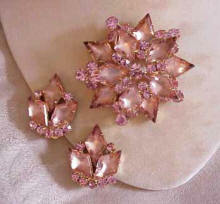 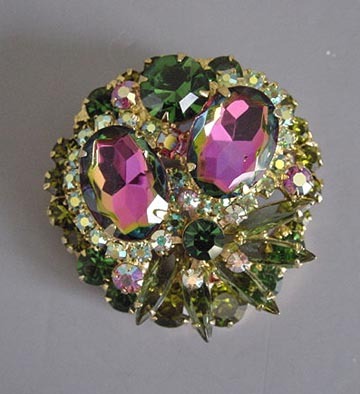 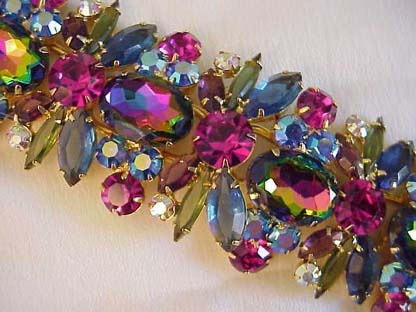 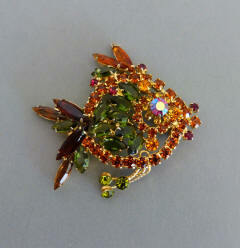 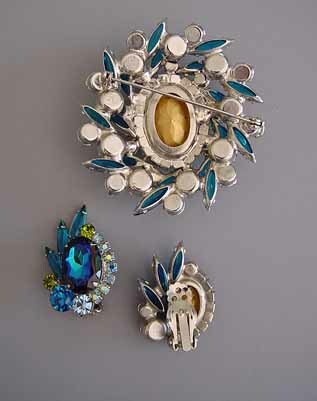 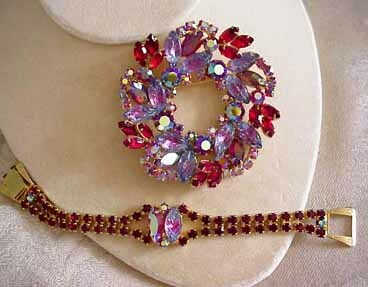 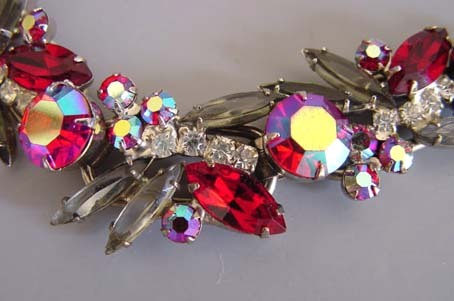 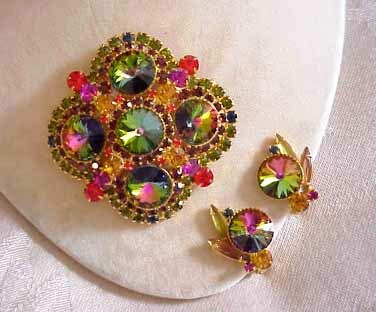 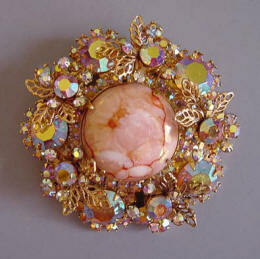 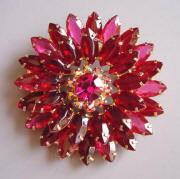 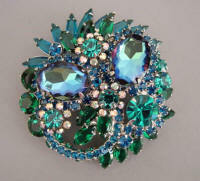 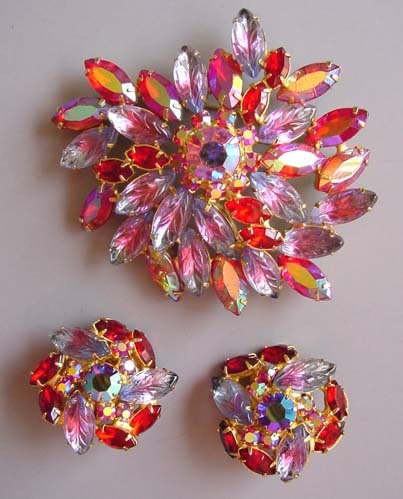 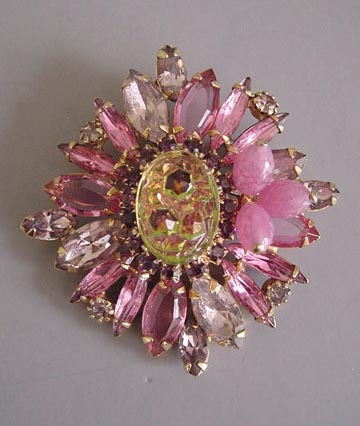 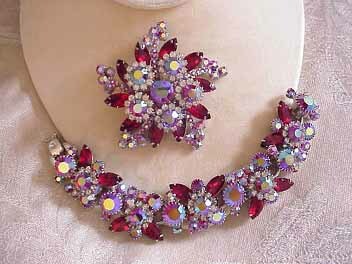 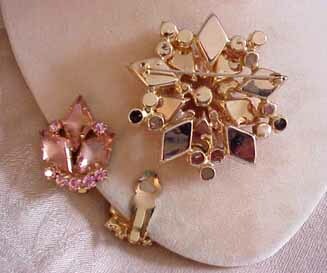 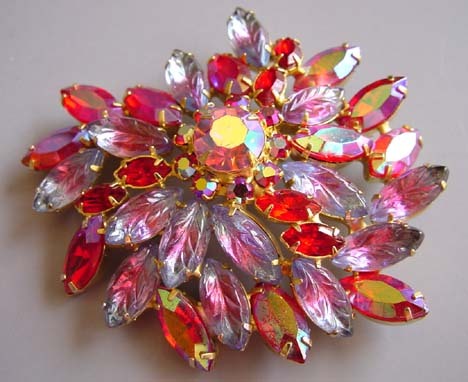 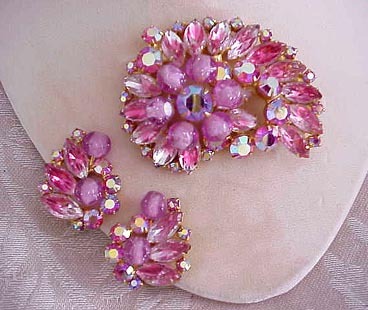 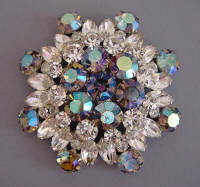 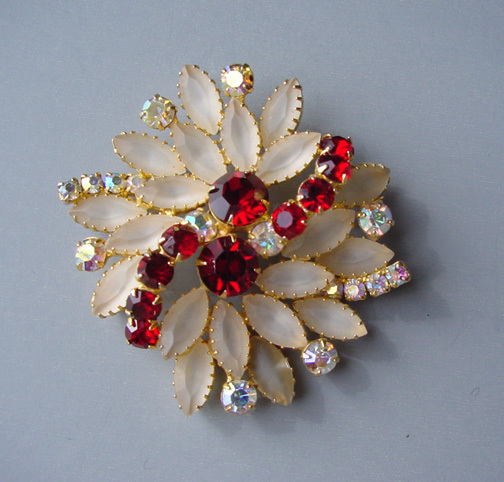 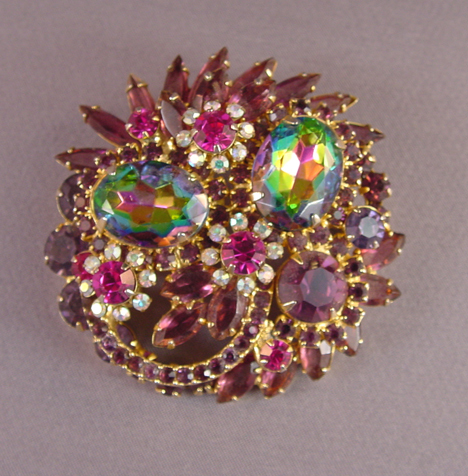 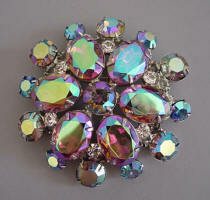 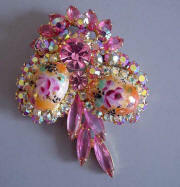 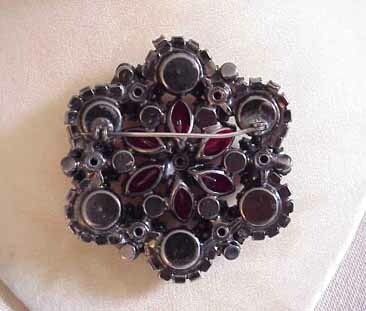 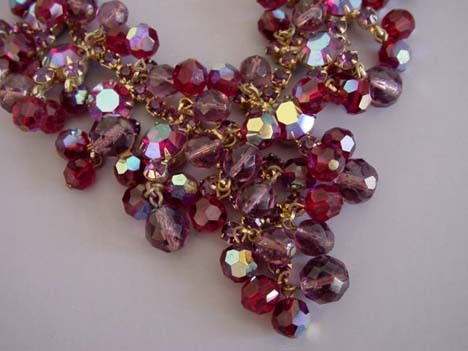 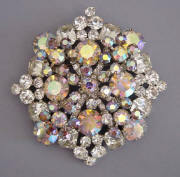 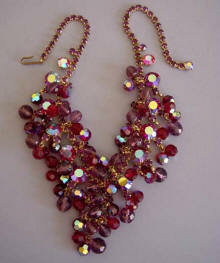 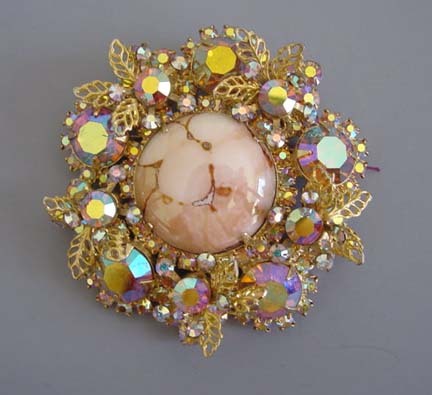 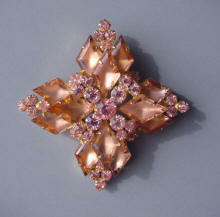 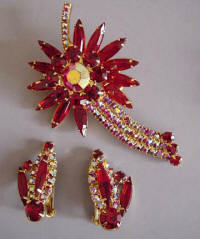 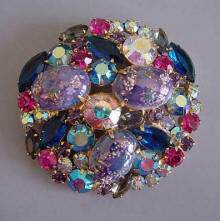 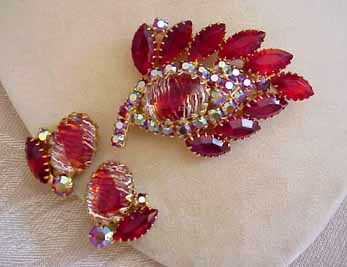 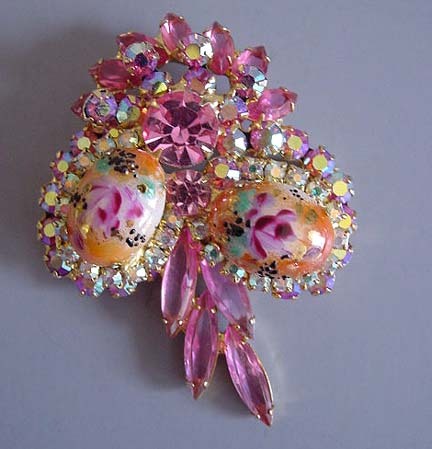 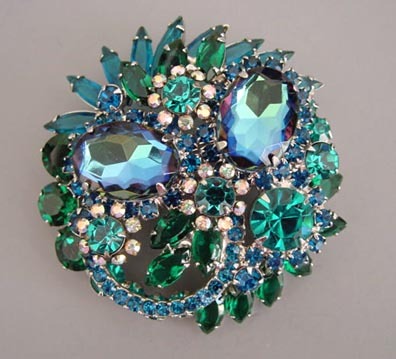 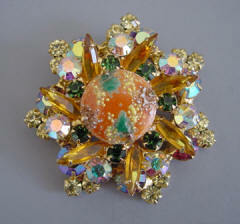 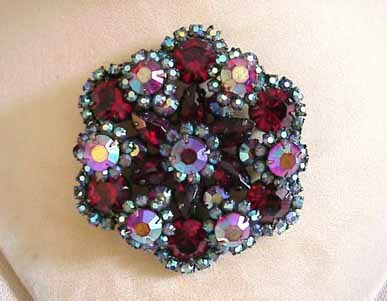 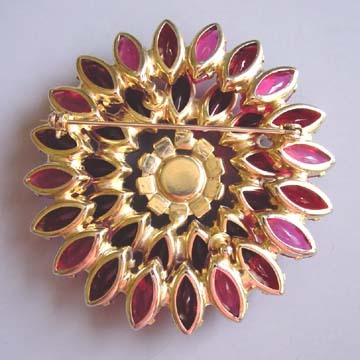 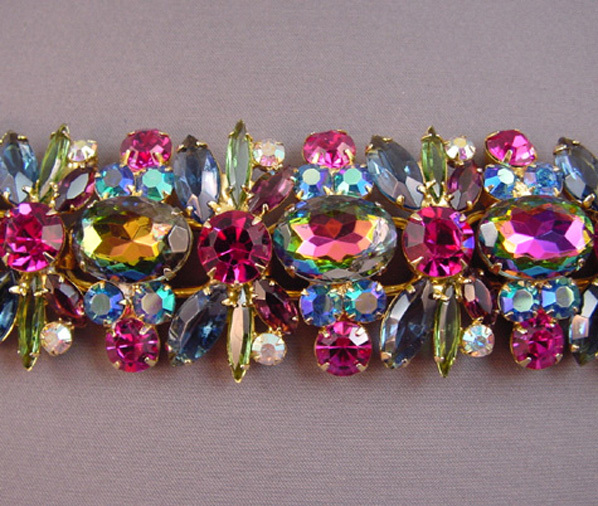 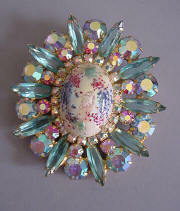 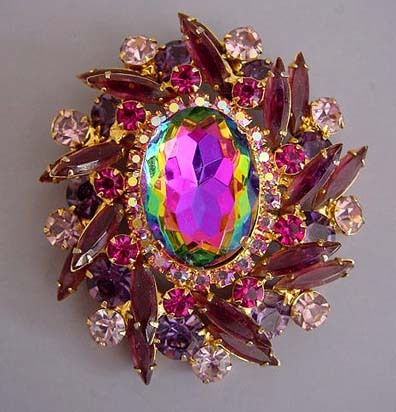 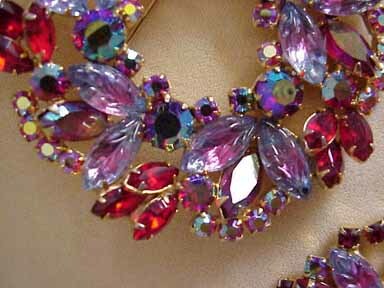 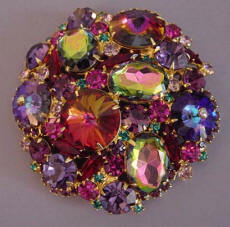 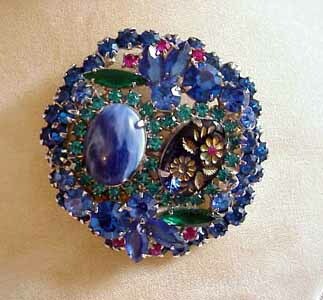 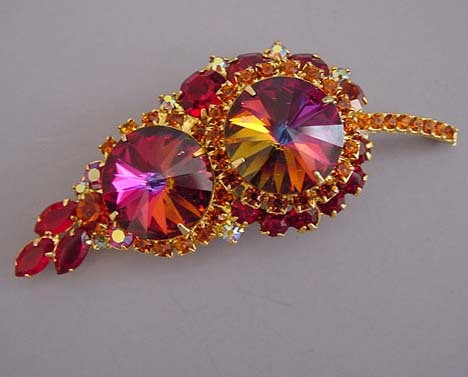 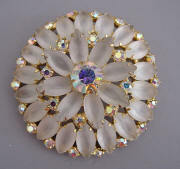 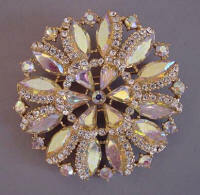 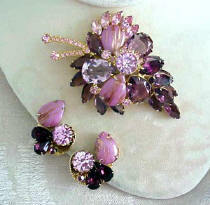 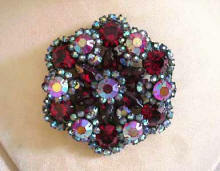 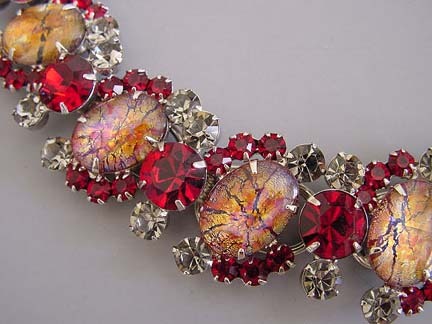 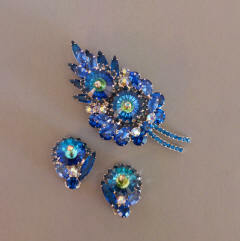 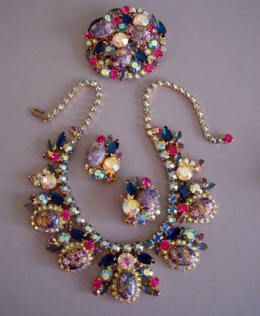 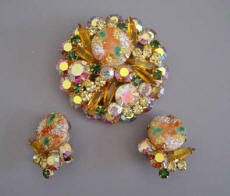 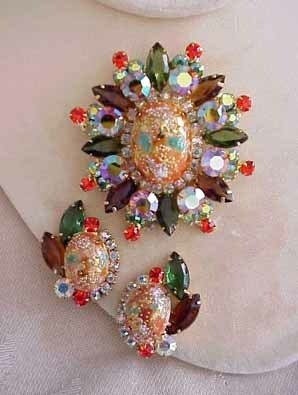 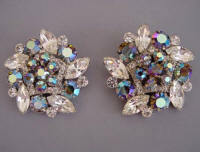 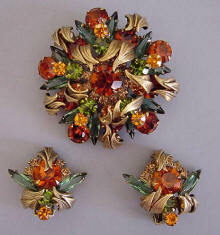 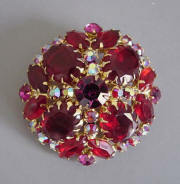 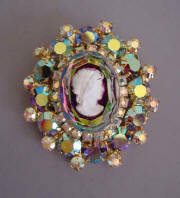 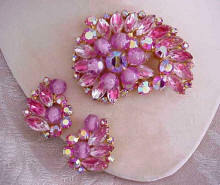 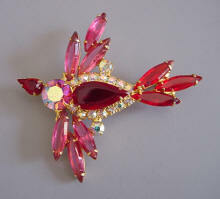 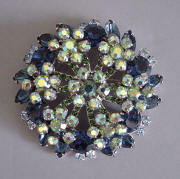 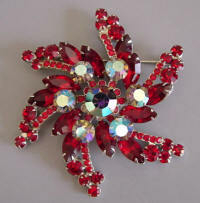 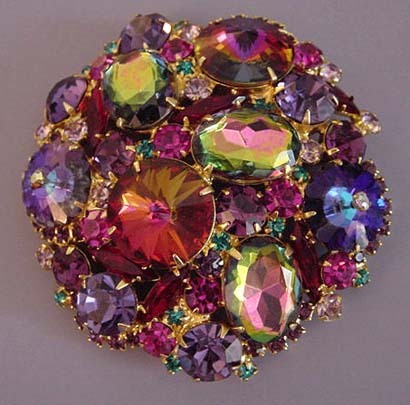 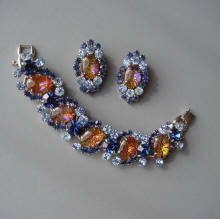 JULIANA style red and lavender rhinestone and aurora brooch. 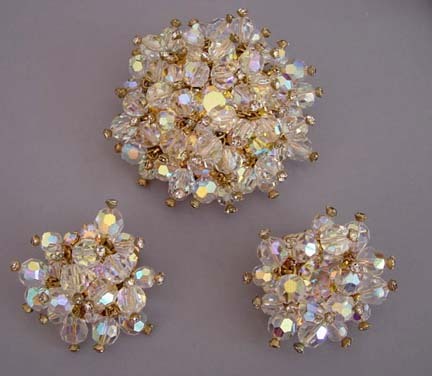 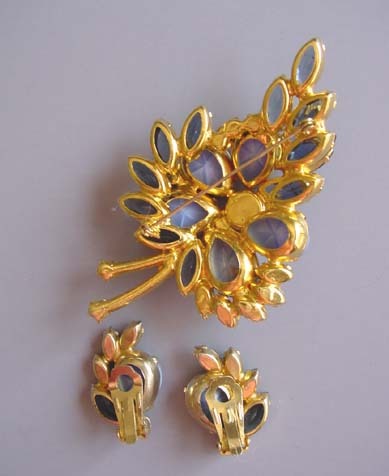 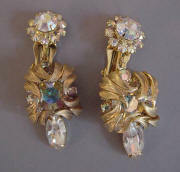 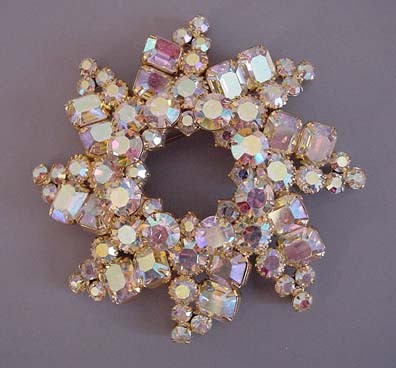 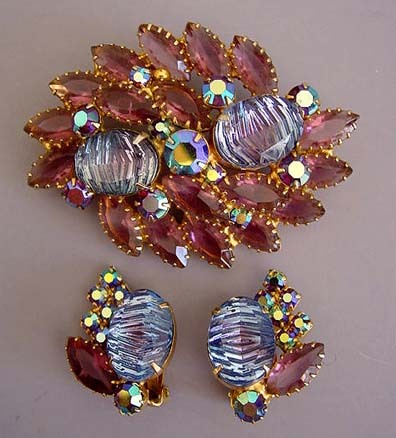 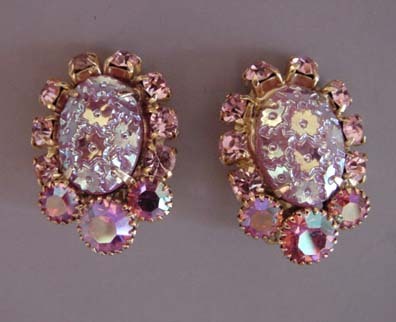 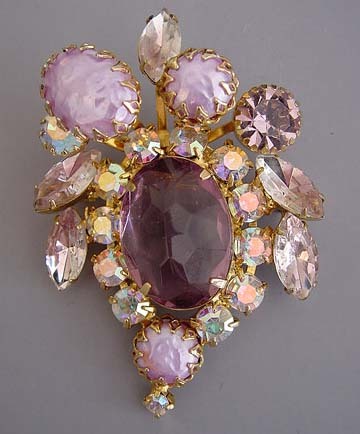 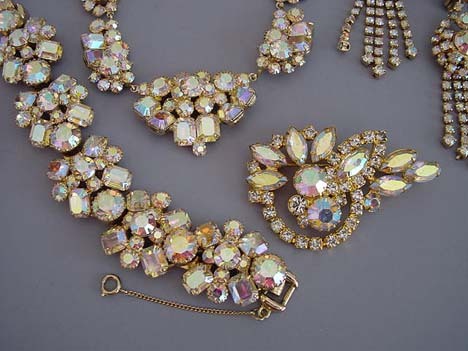 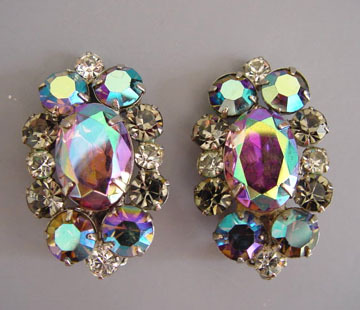 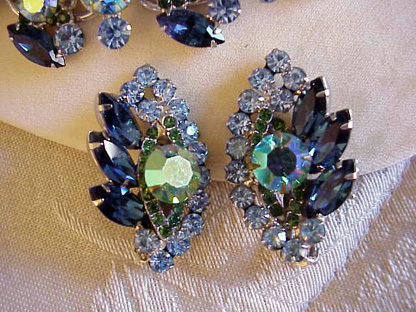 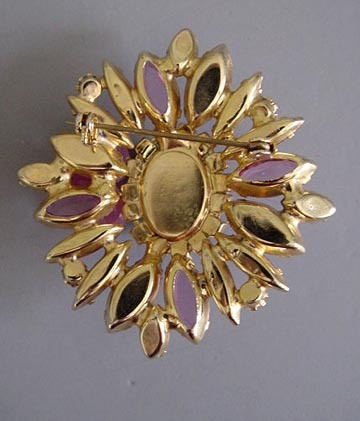 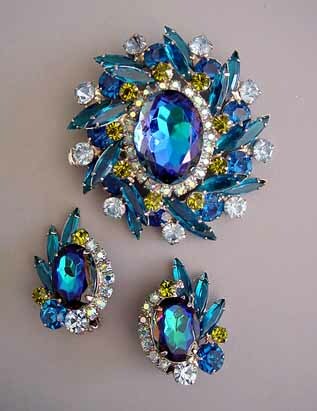 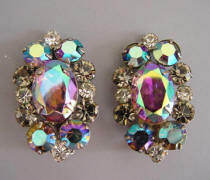 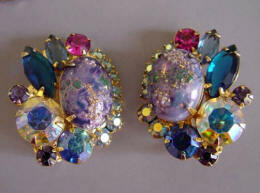 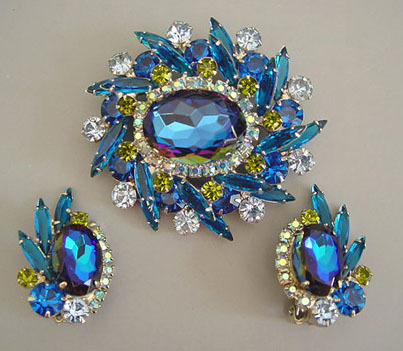 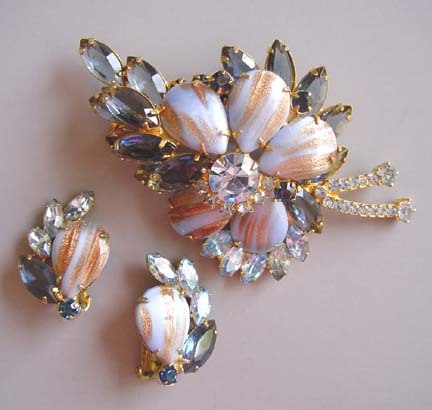 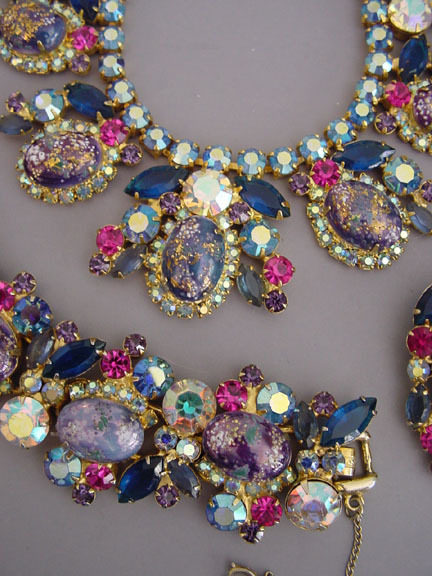 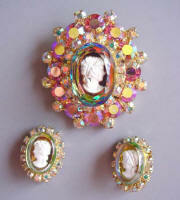 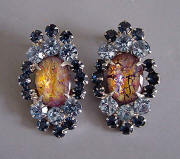 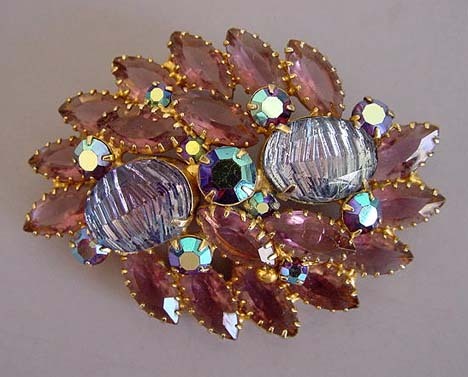 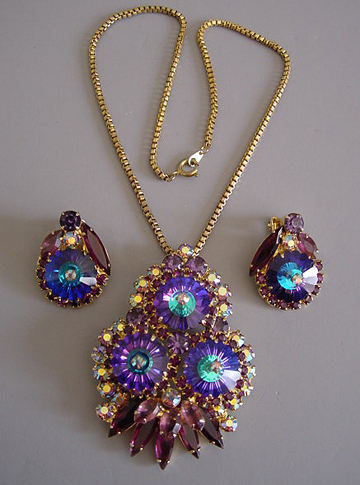 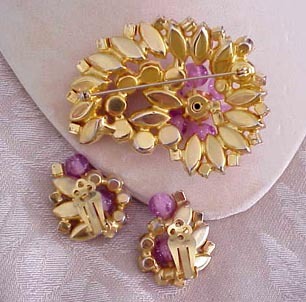 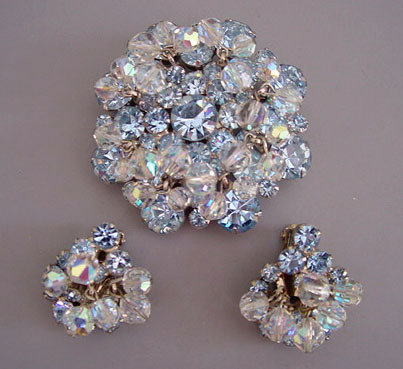 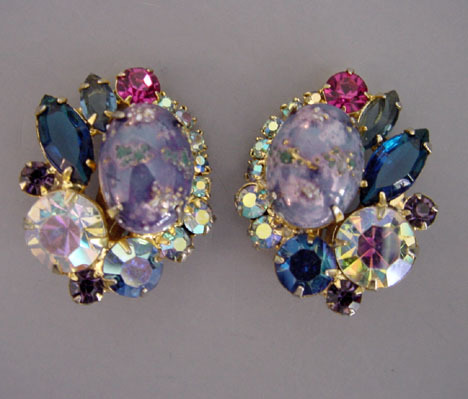 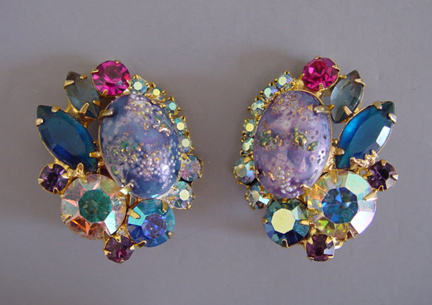 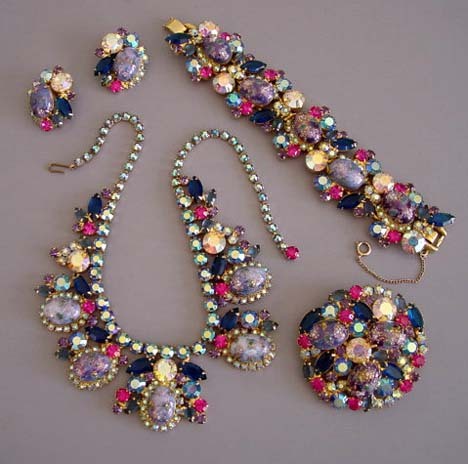 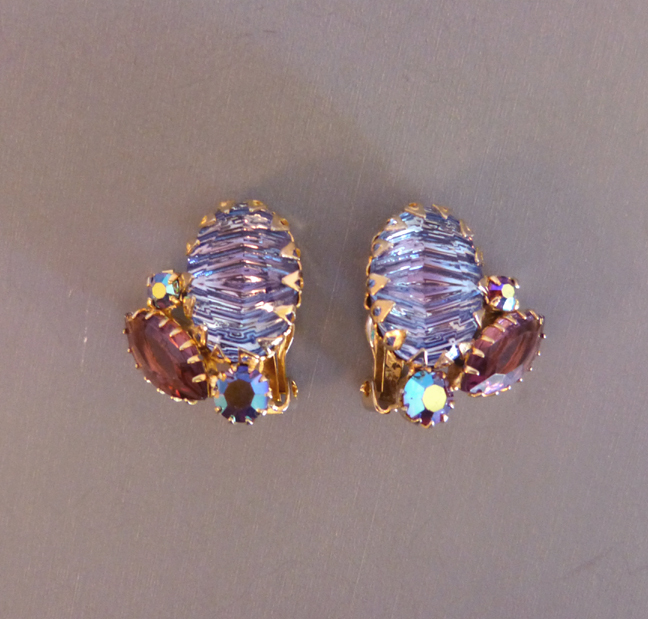 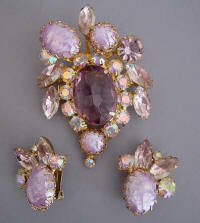 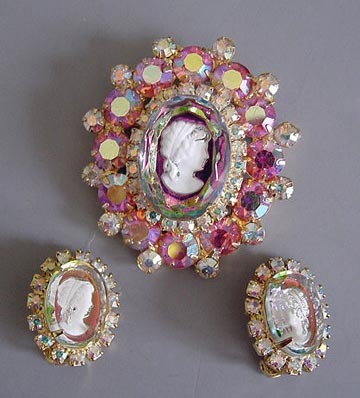 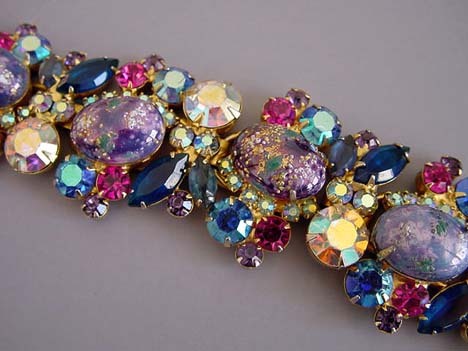 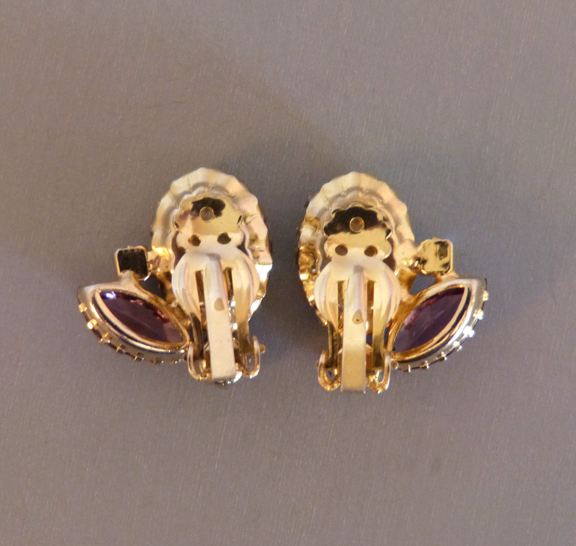 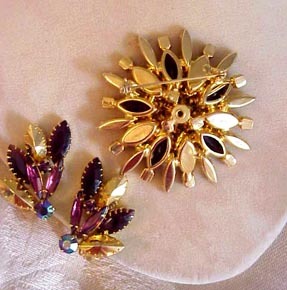 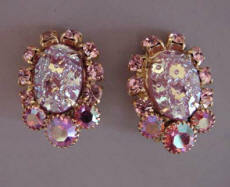 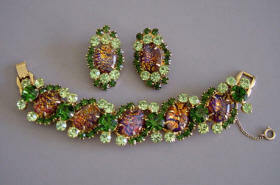 View View #J19728 JULIANA style lavender unfoiled rhinestone, purple "ruffled" rhinestones and purple aurora borealis set in multi-pronged gold tone brooch, 2-3/4" and 1-1/4" earrings. 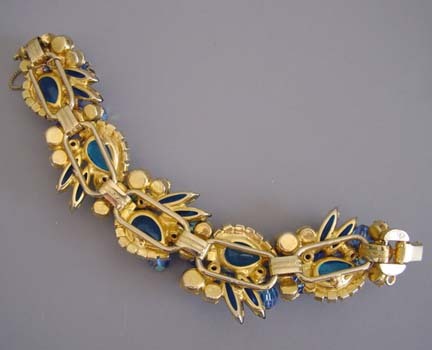 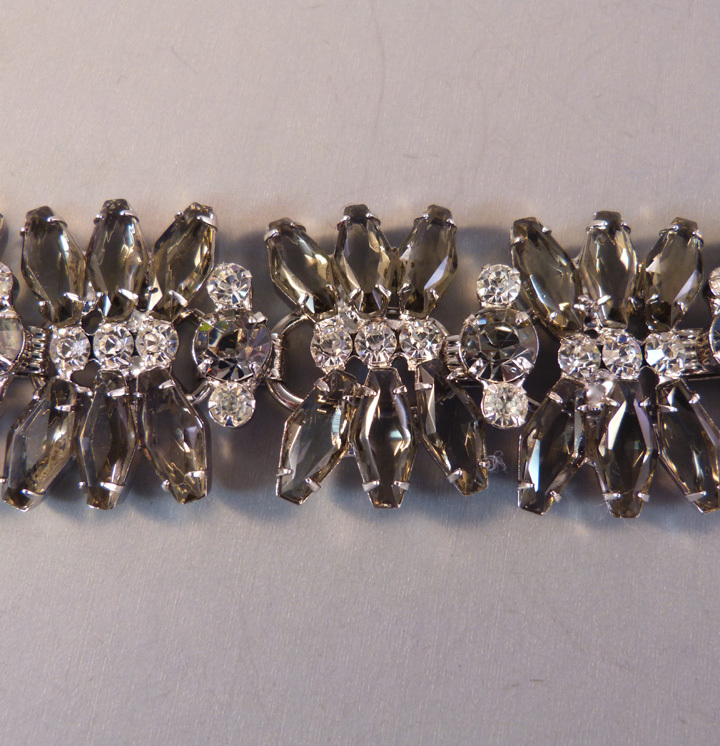 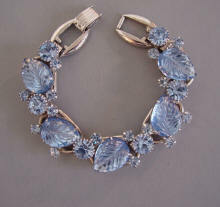 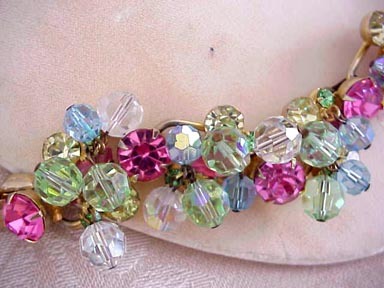 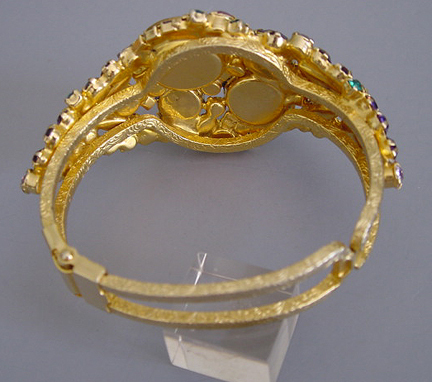 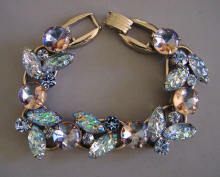 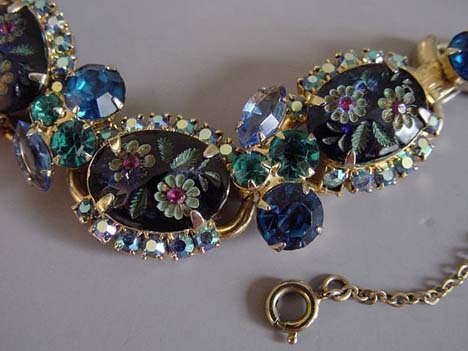 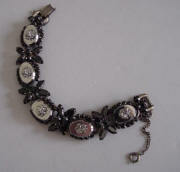 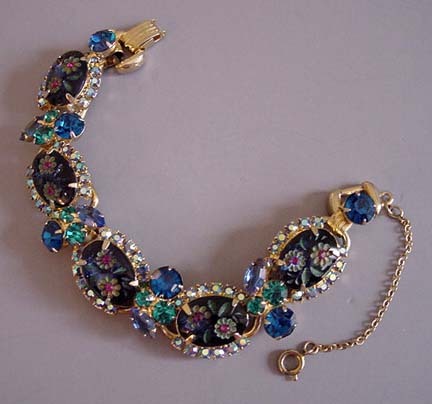 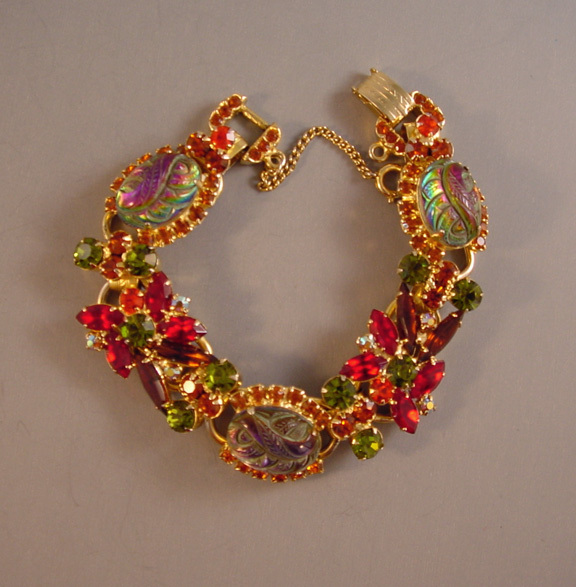 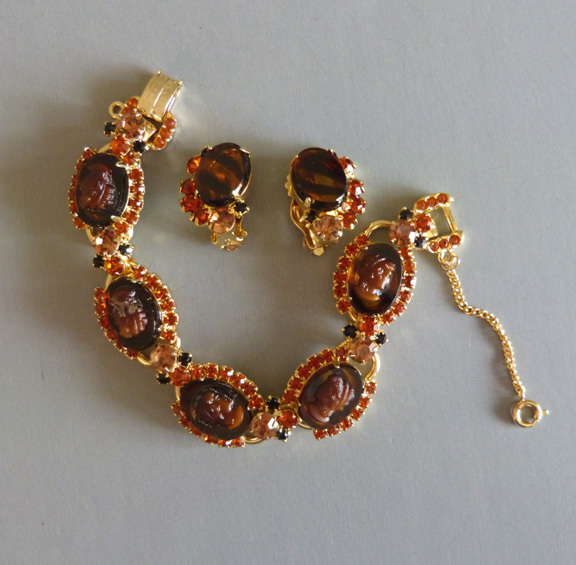 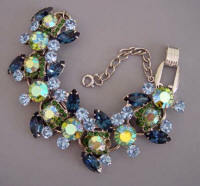 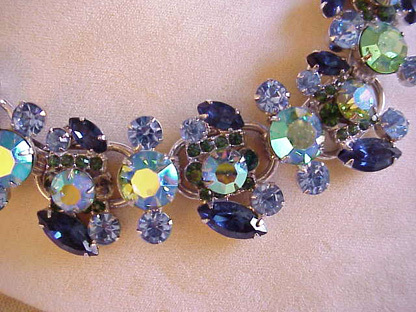 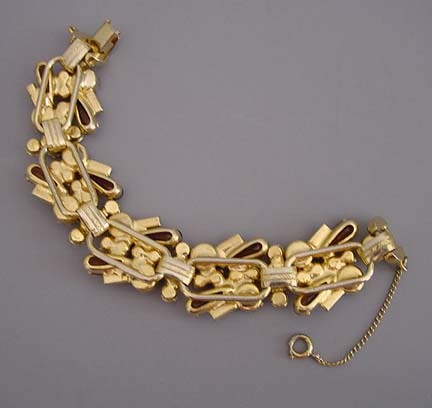 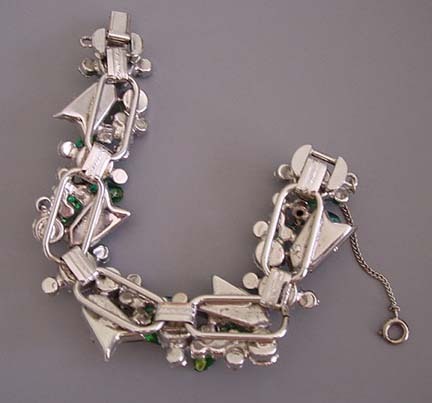 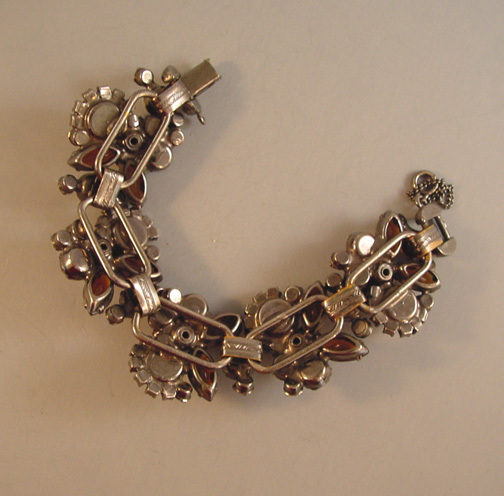 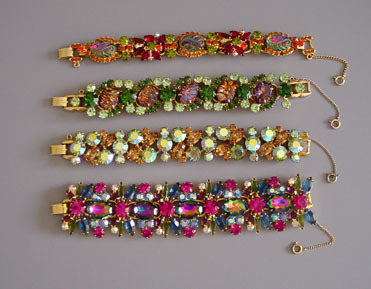 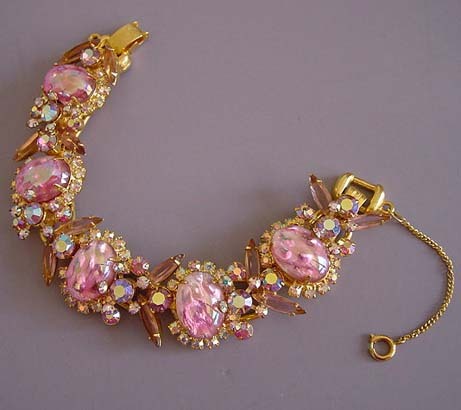 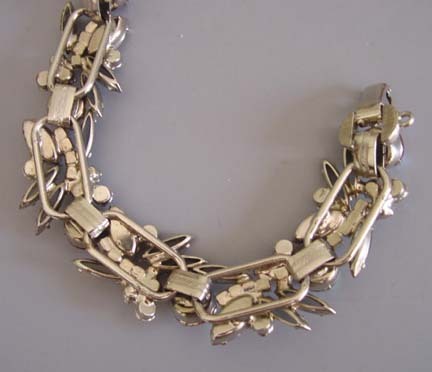 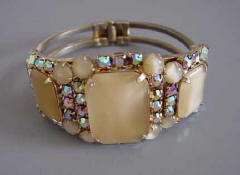 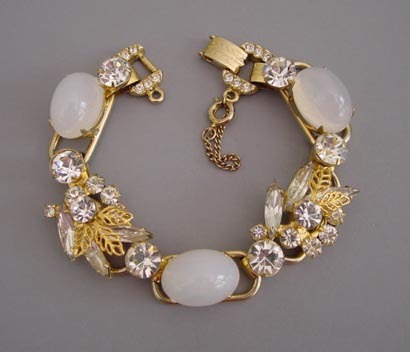 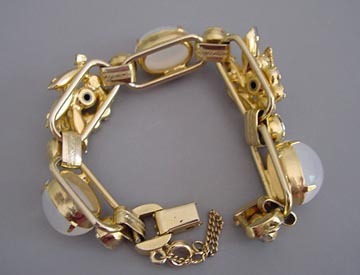 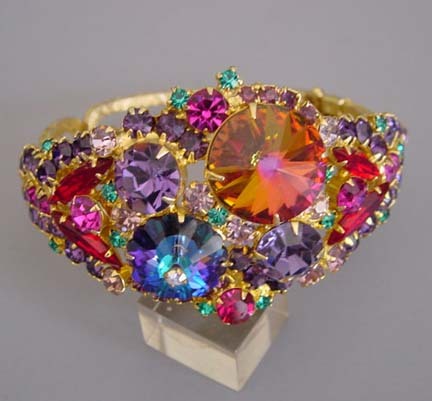 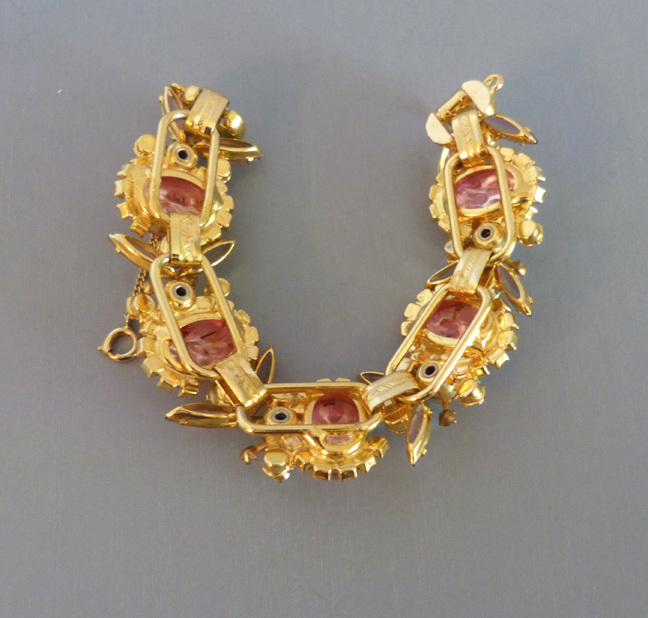 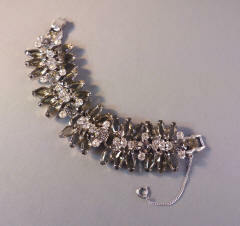 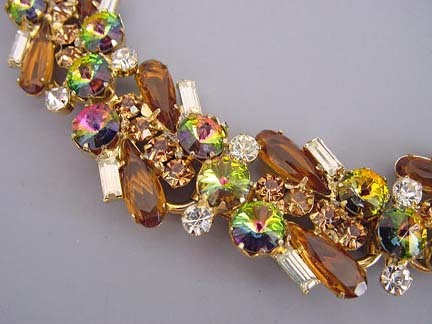 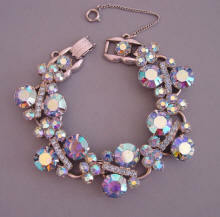 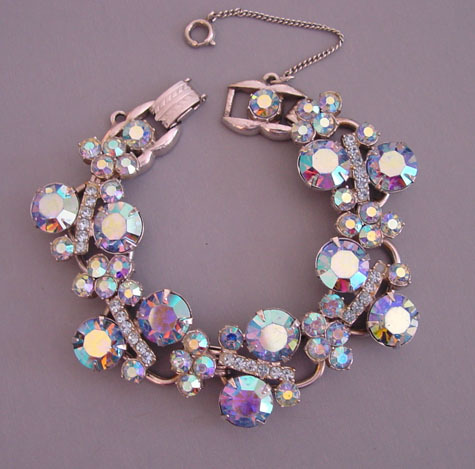 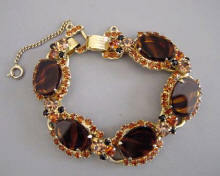 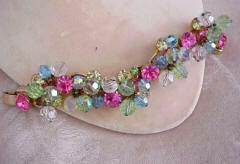 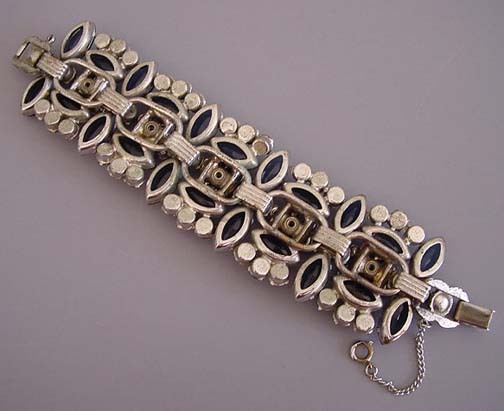 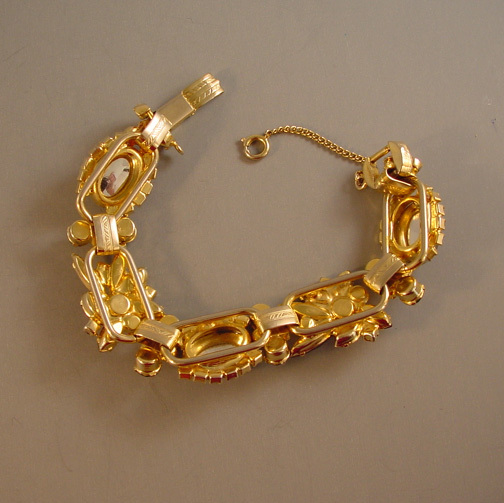 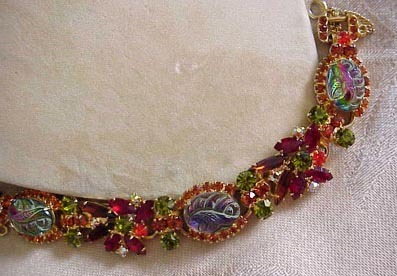 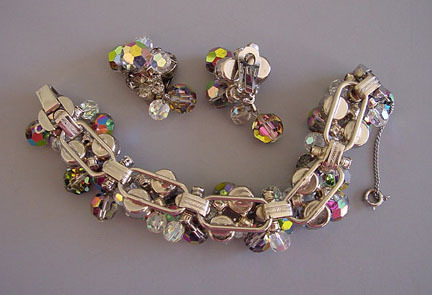 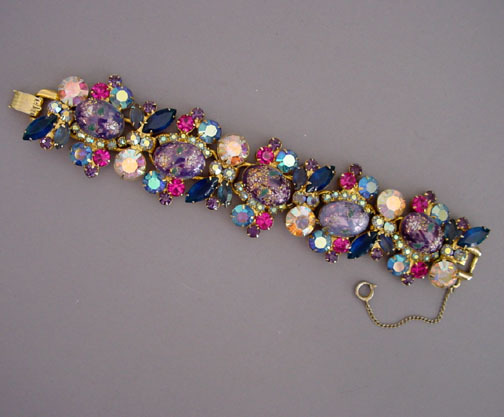 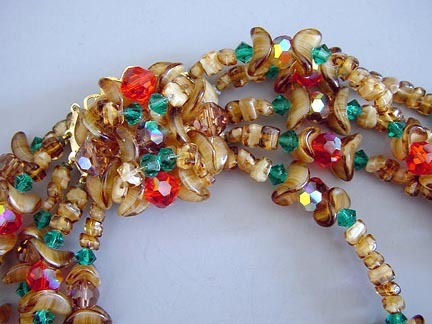 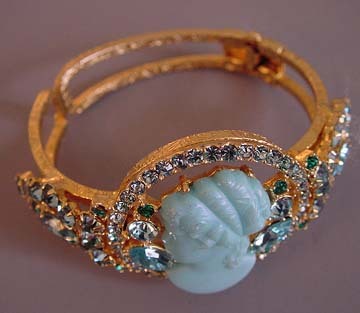 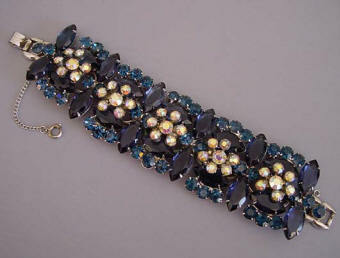 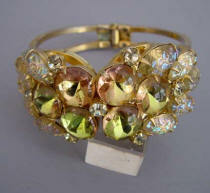 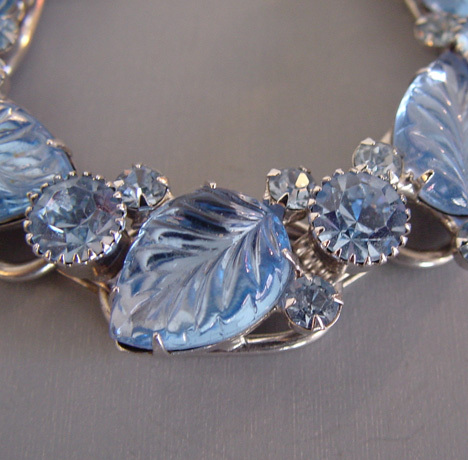 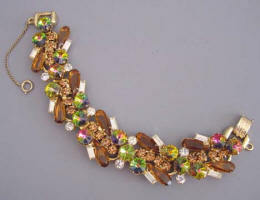 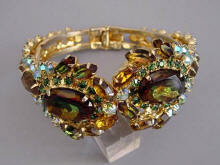 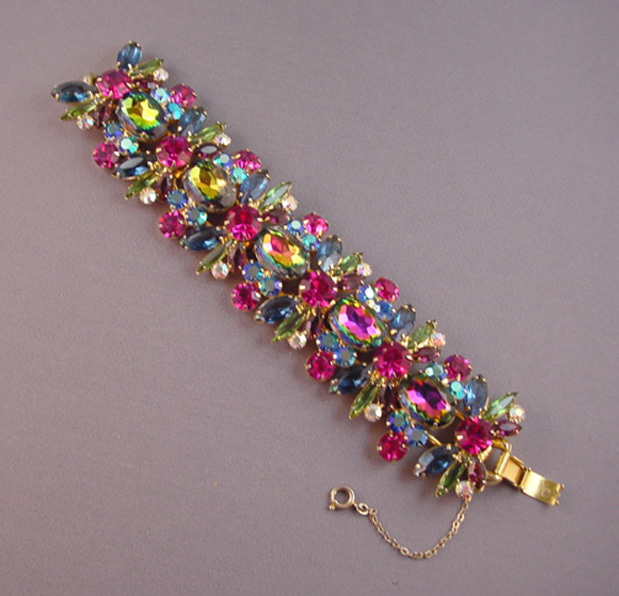 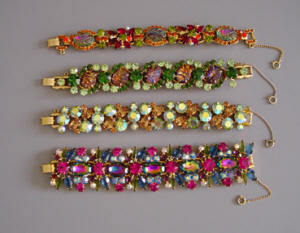 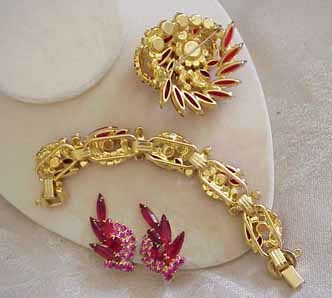 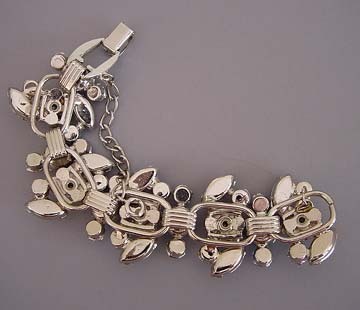 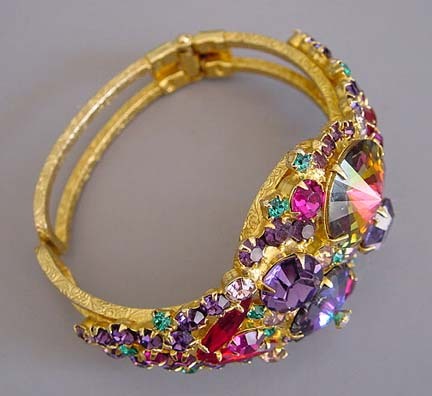 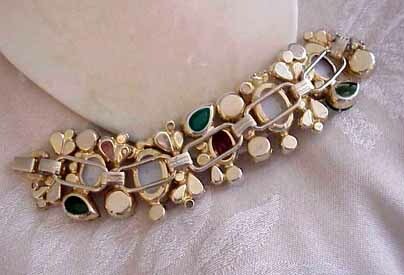 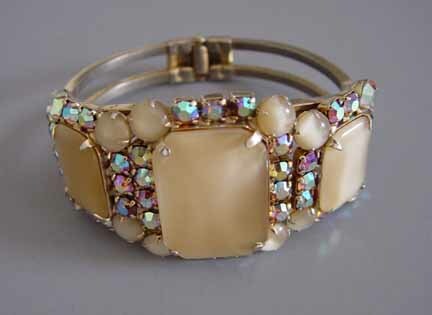 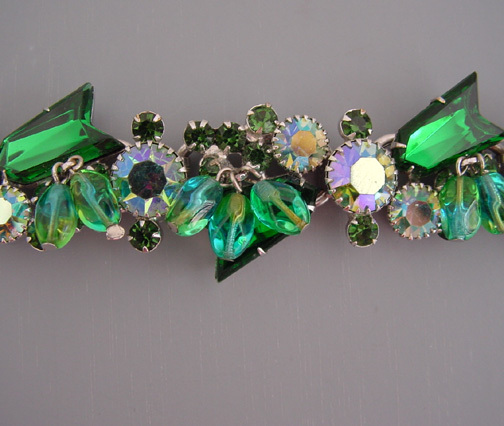 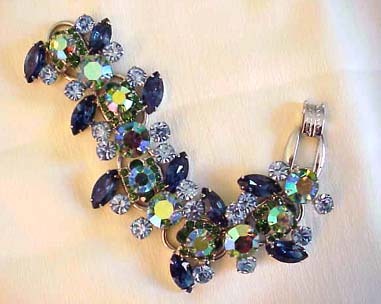 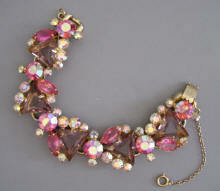 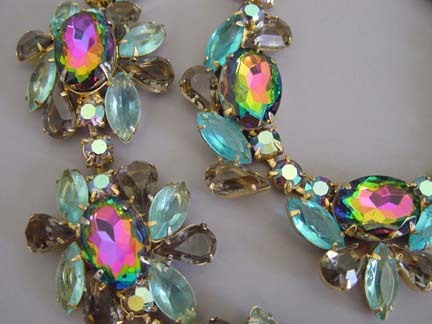 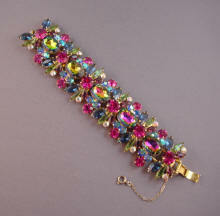 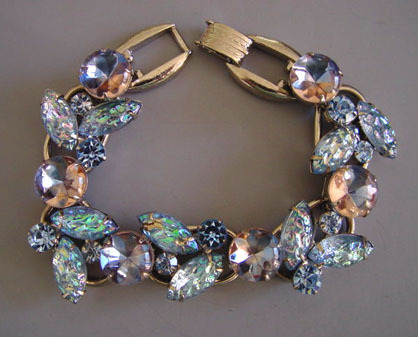 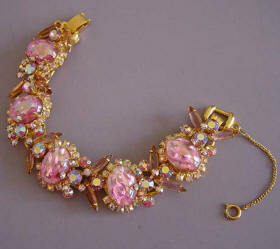 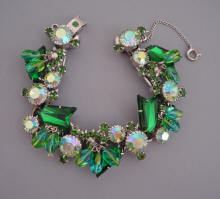 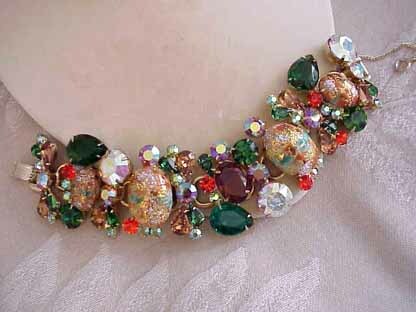 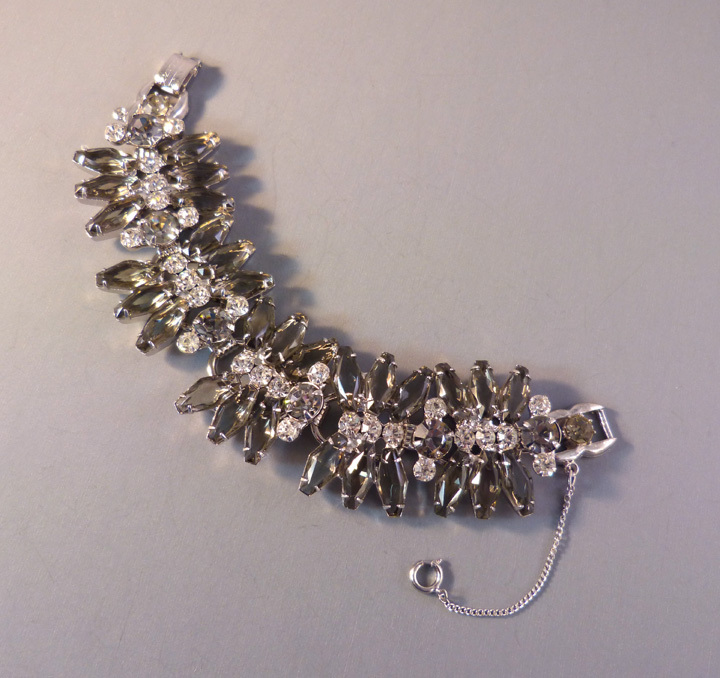 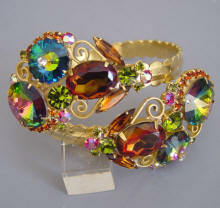 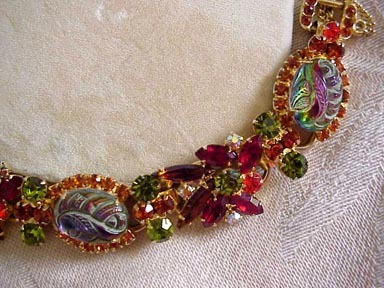 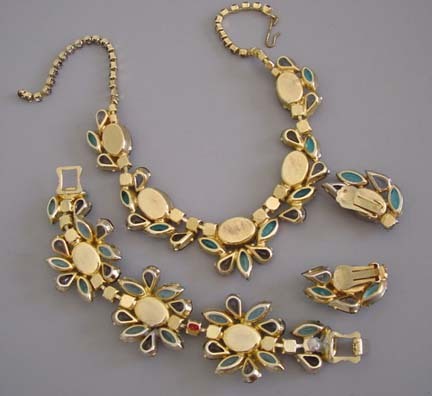 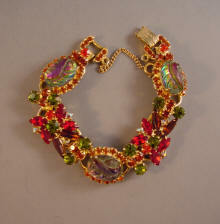 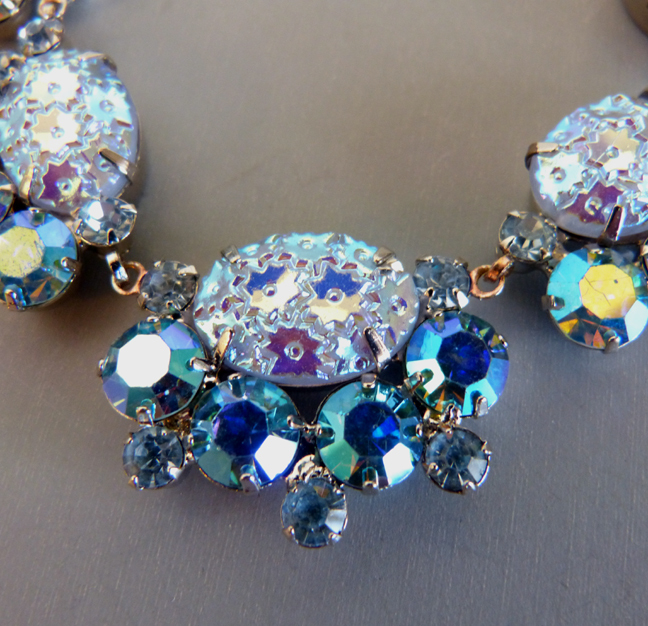 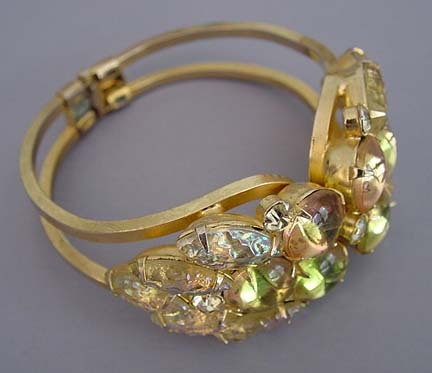 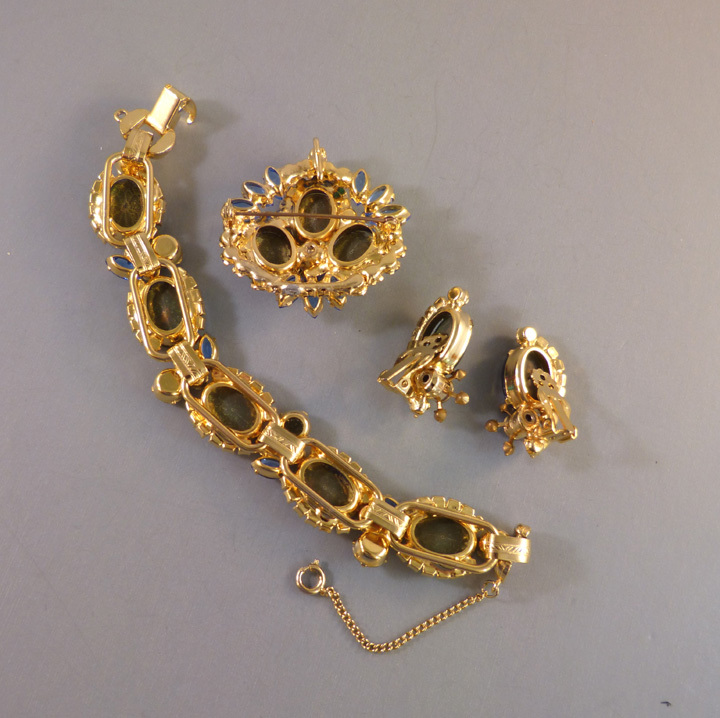 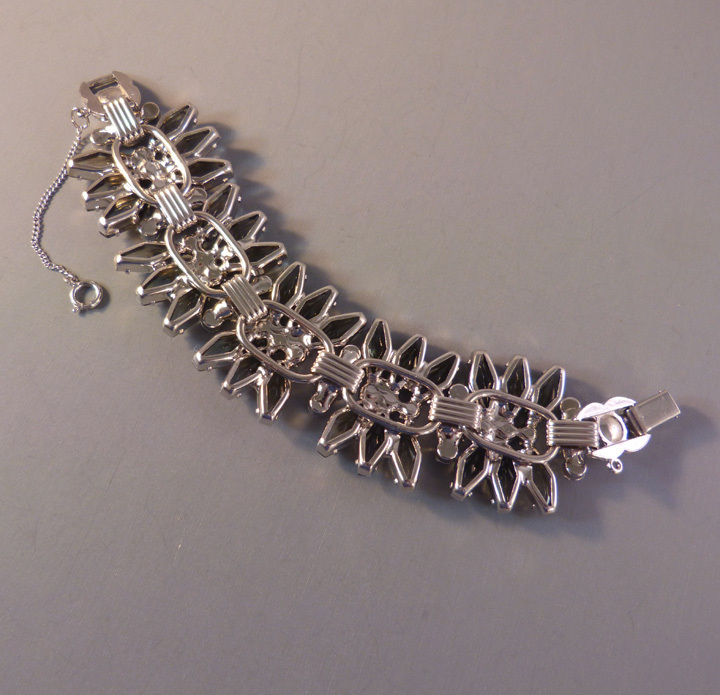 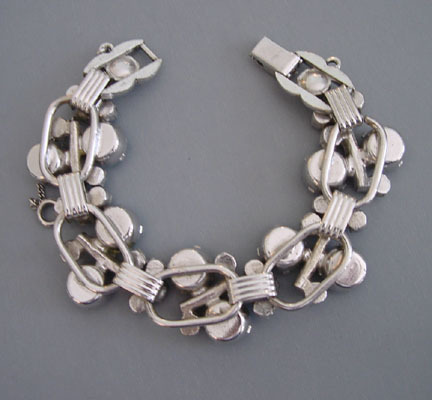 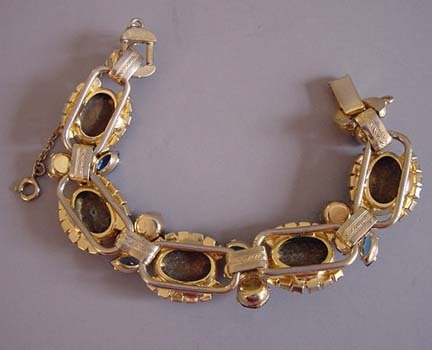 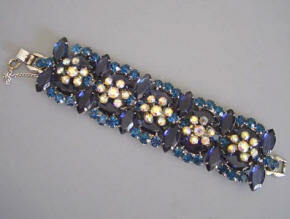 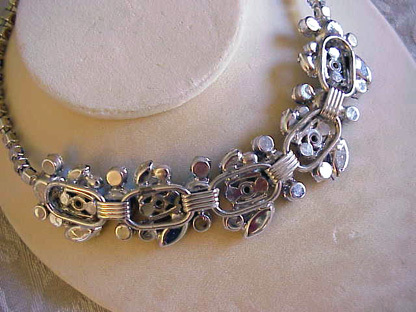 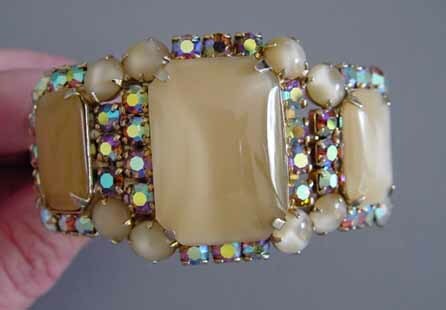 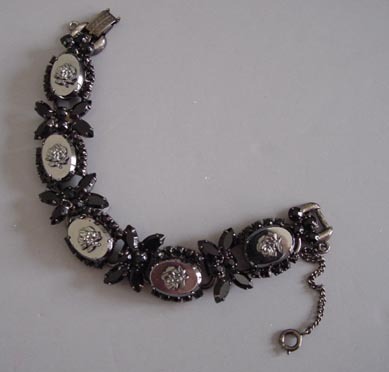 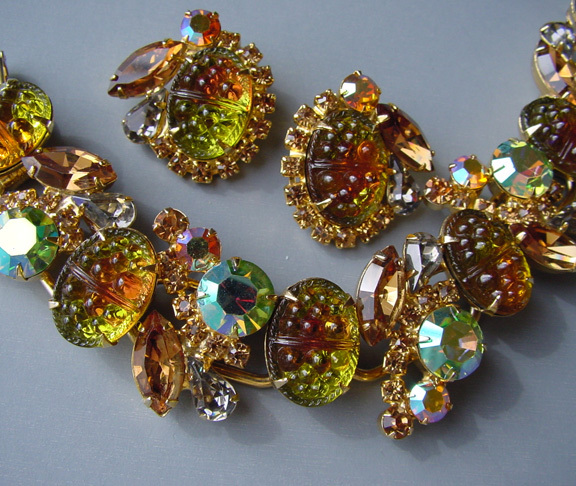 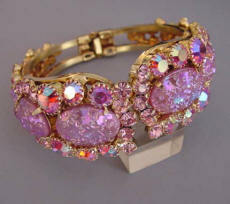 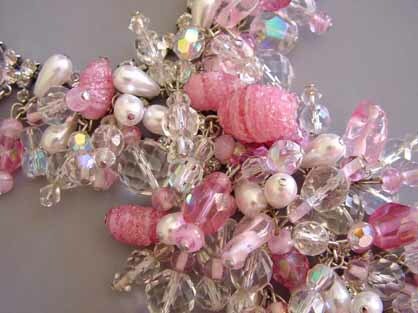 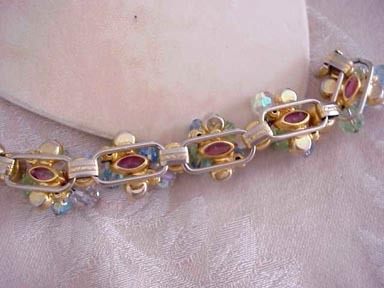 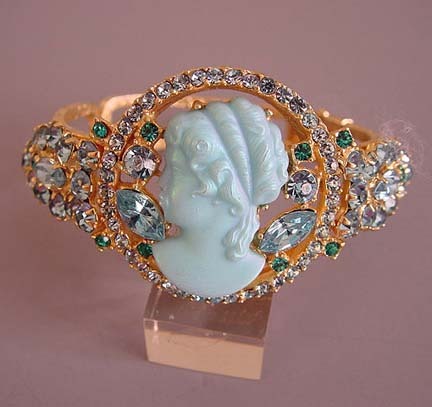 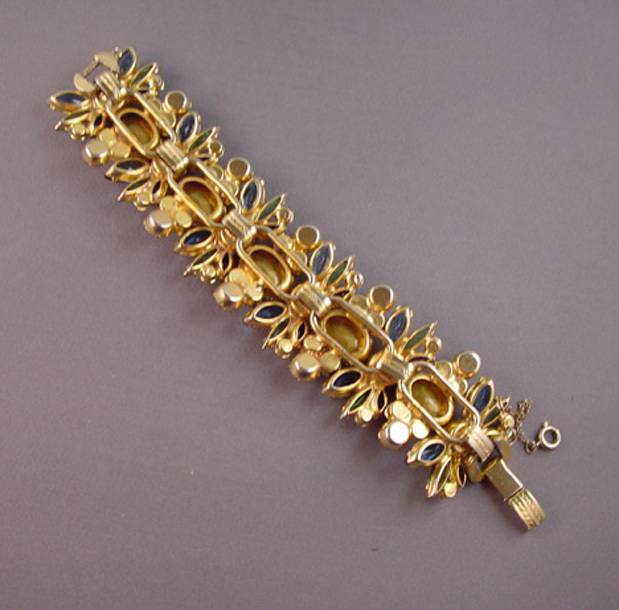 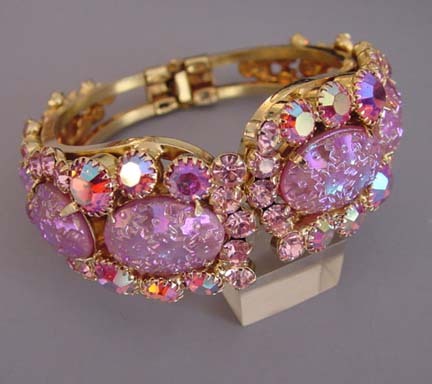 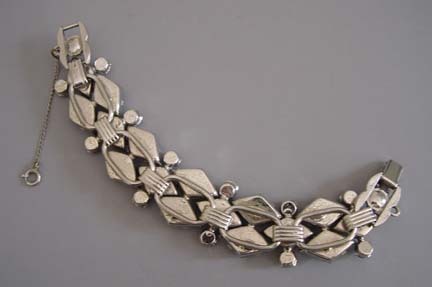 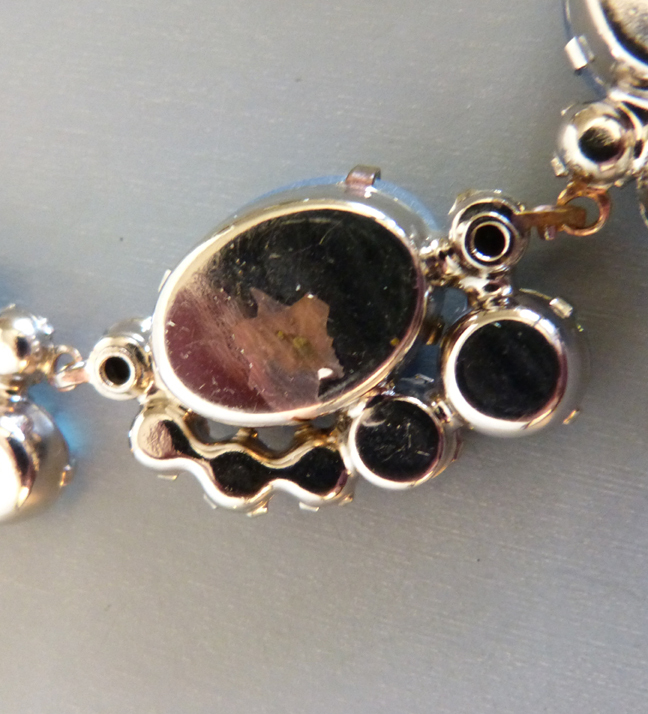 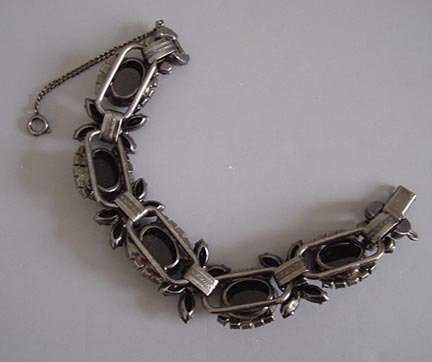 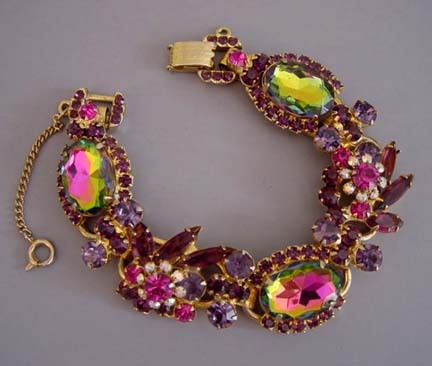 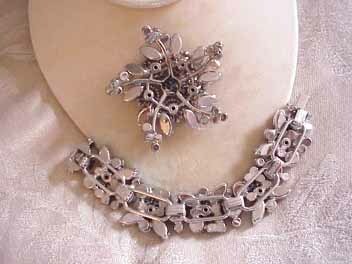 View View View #J29676 JULIANA style bracelet with iridescent carved flowers. 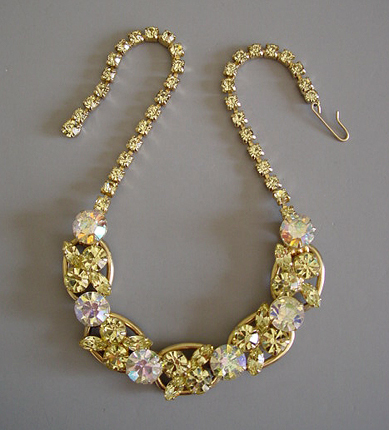 View #J19864. 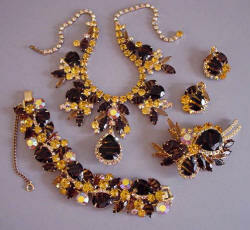 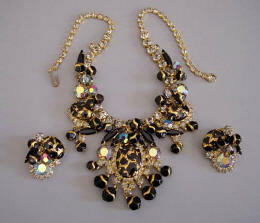 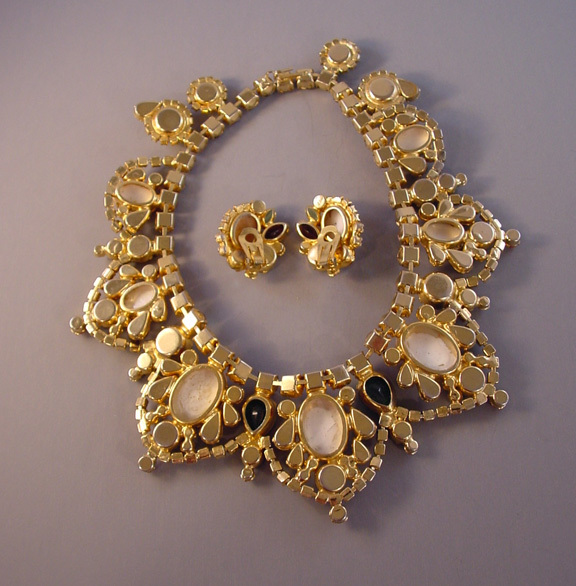 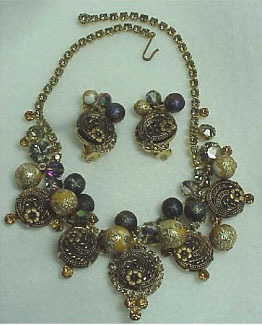 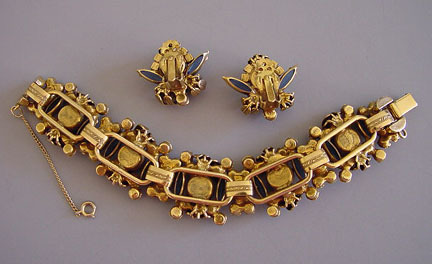 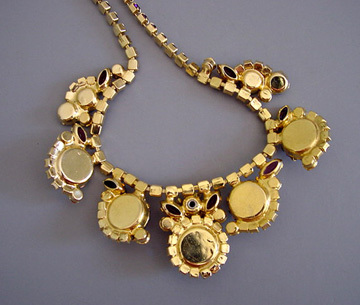 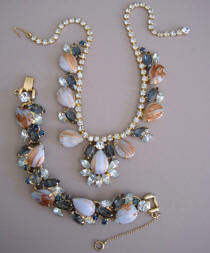 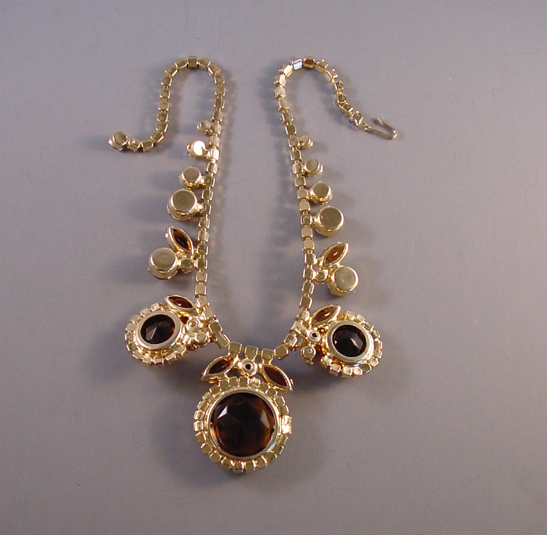 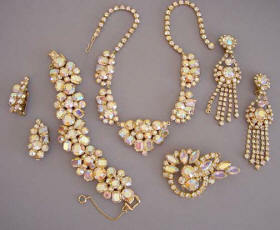 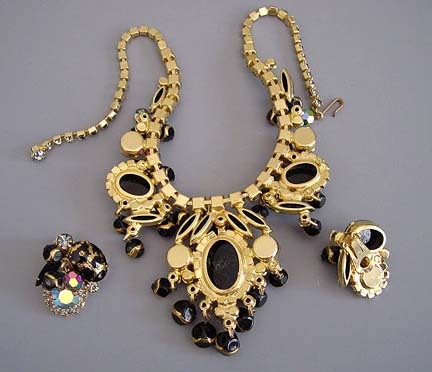 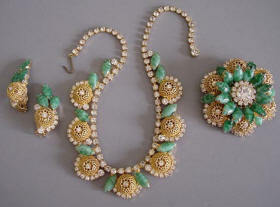 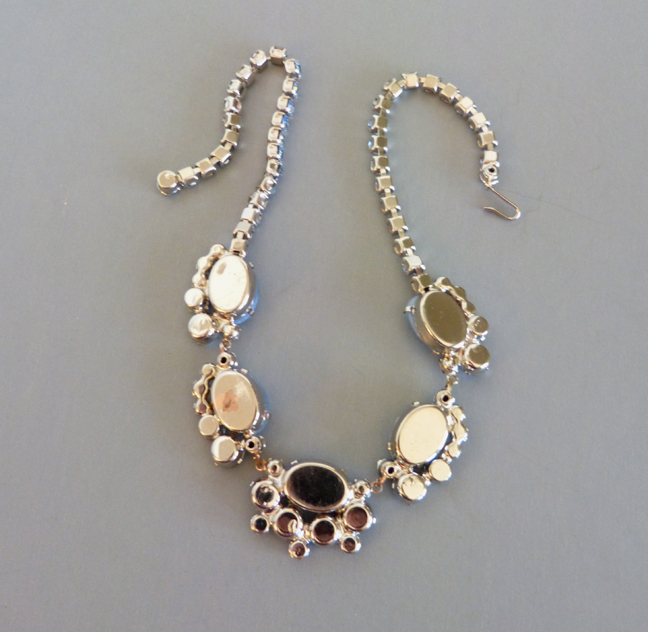 JULIANA necklace and earrings... buttons and beads in gold tone and black necklace and earrings.